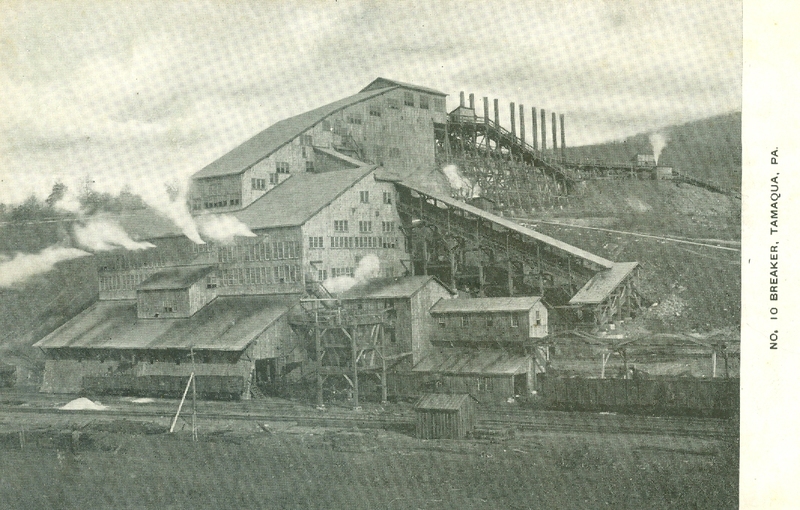 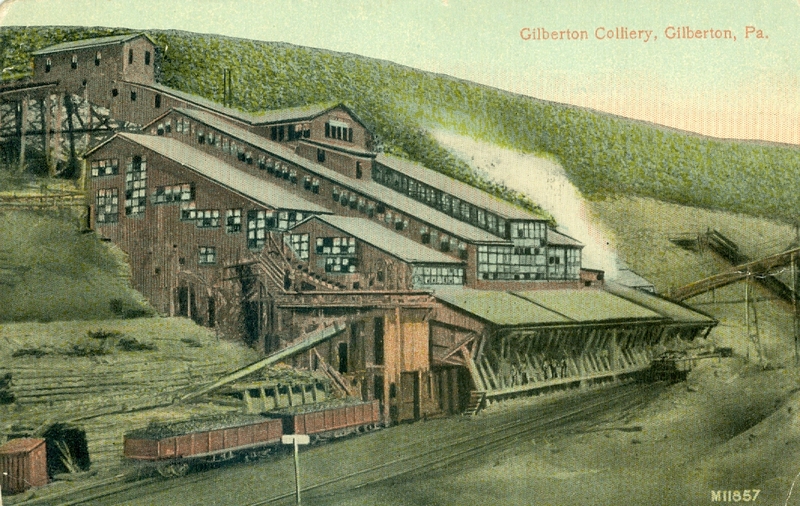 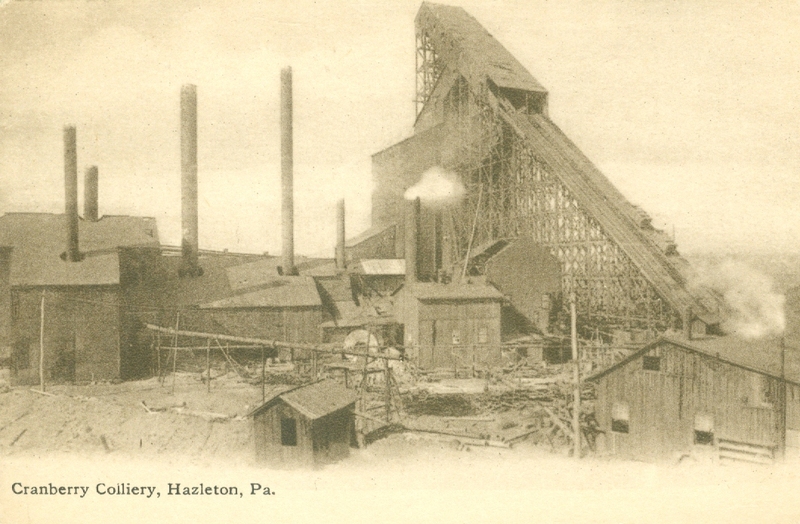 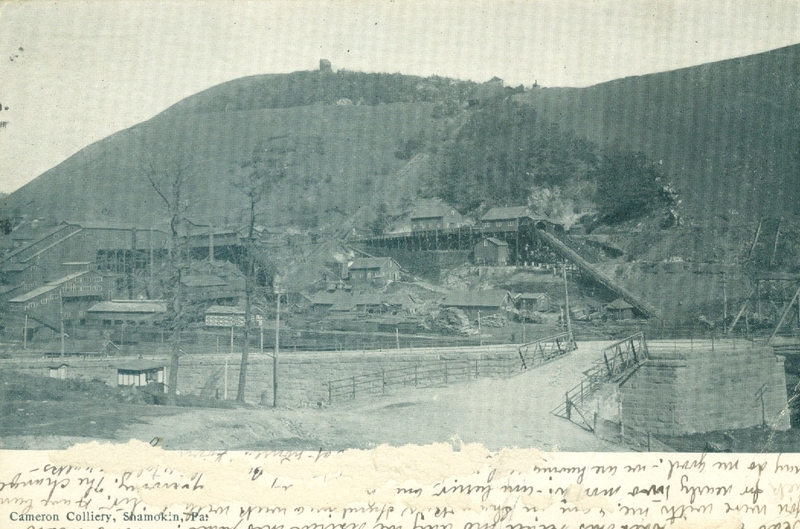 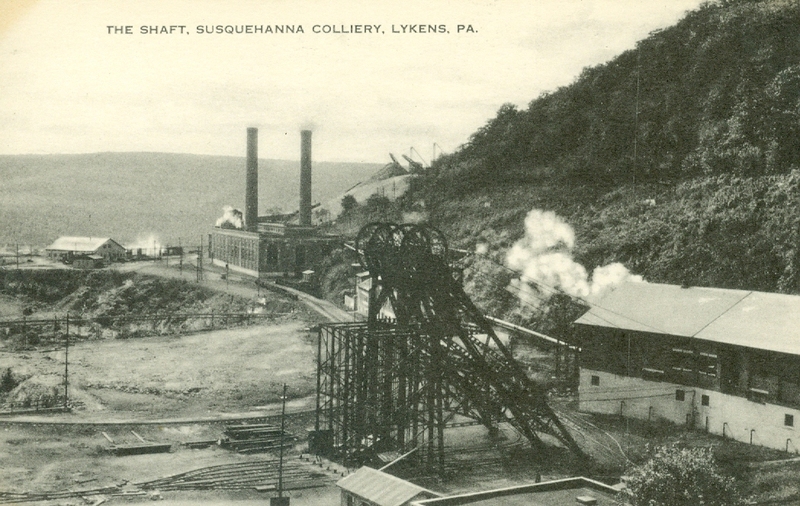 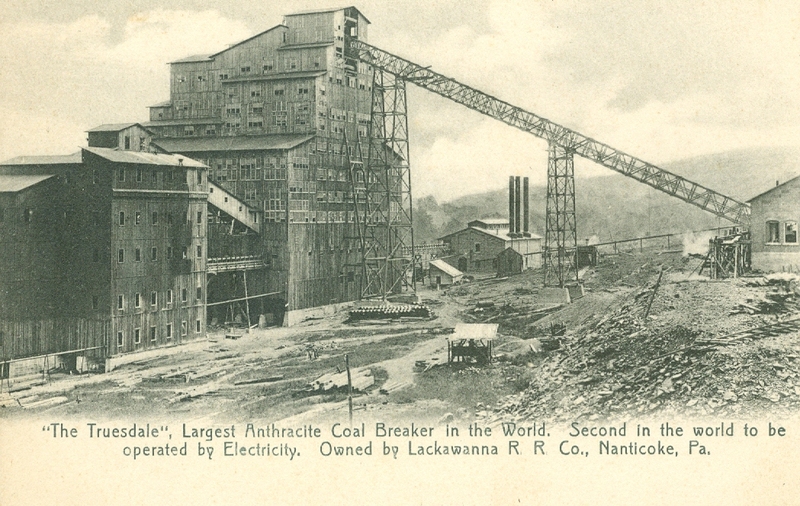 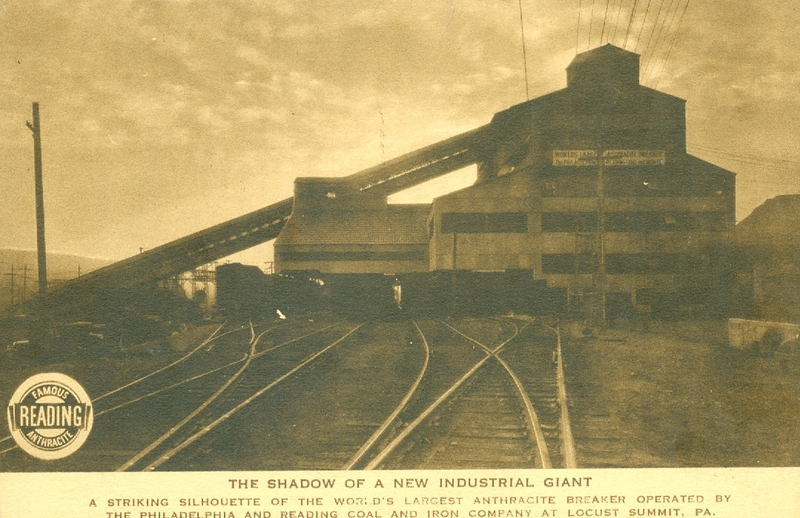 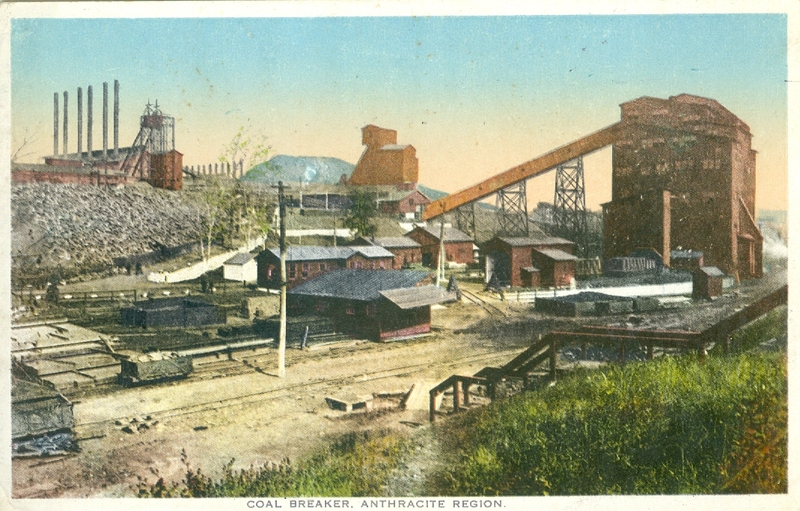 As anthracite mining got underway it was realized that coal did not come out of a mine in uniformly sized and clean pieces. 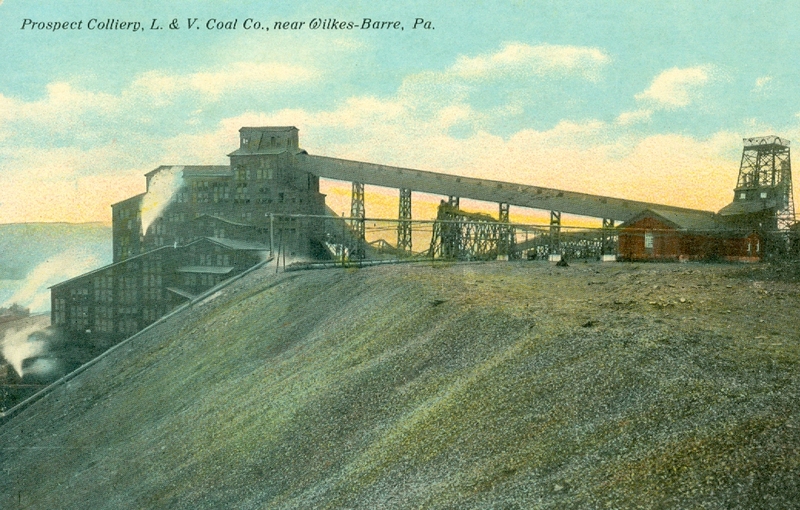 As it was blasted loose from veins deep underground, the coal fell in all sizes mixed with rock, slate, dirt and a myriad of other impurities. 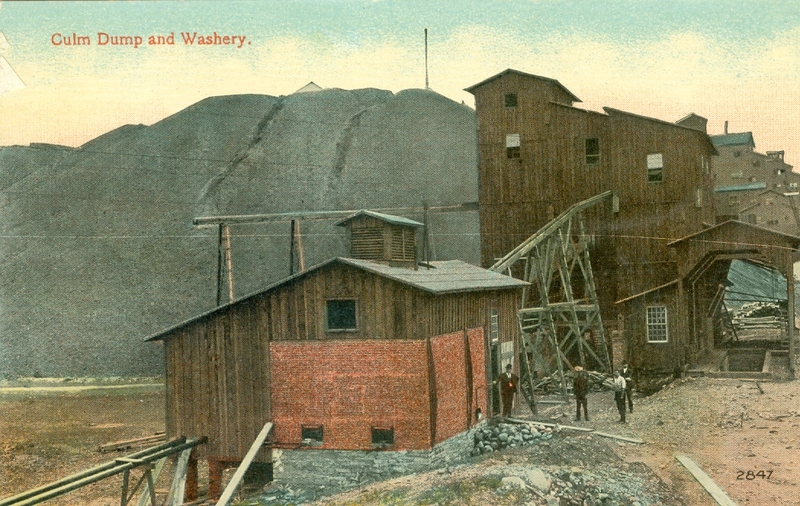 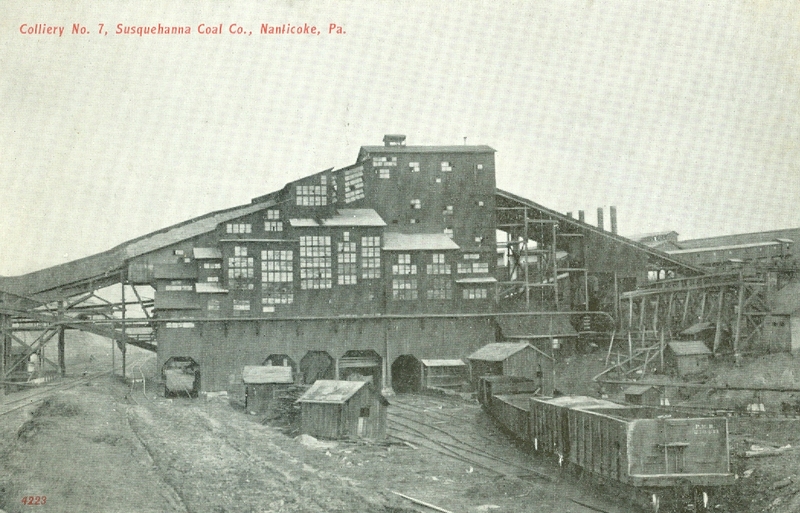 Before it could be sold in any form for commercial success the coal had to be washed if possible and then sized and separated from its accompanying impurities. 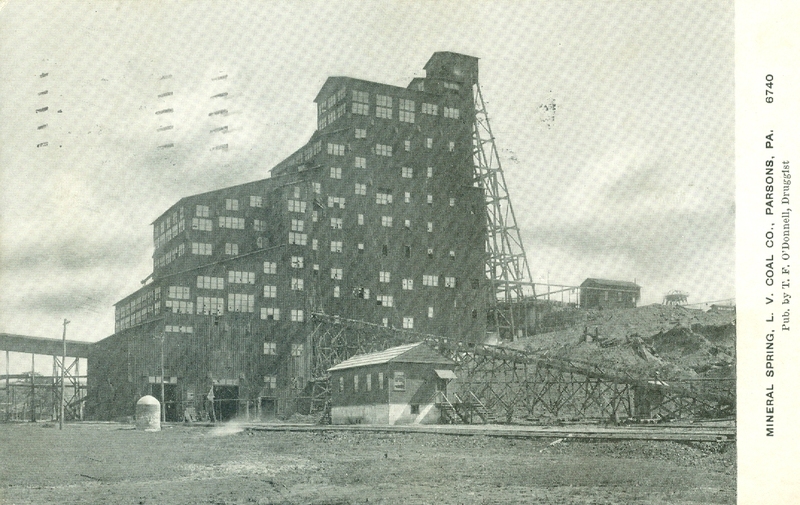 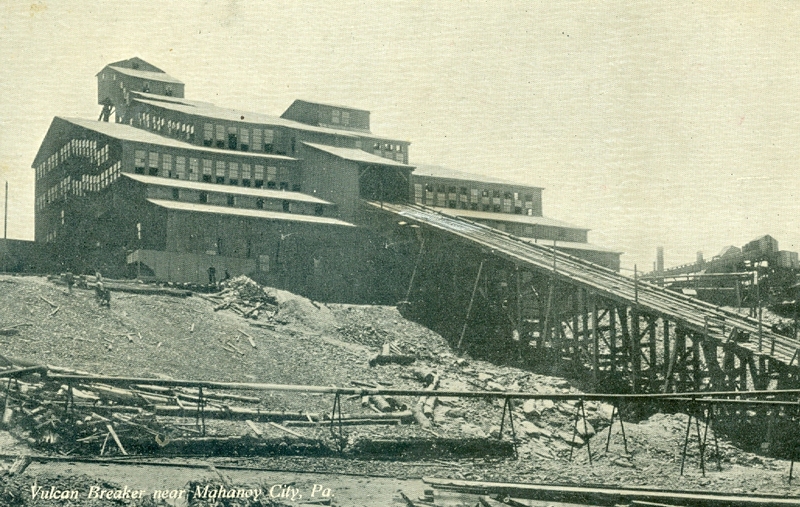 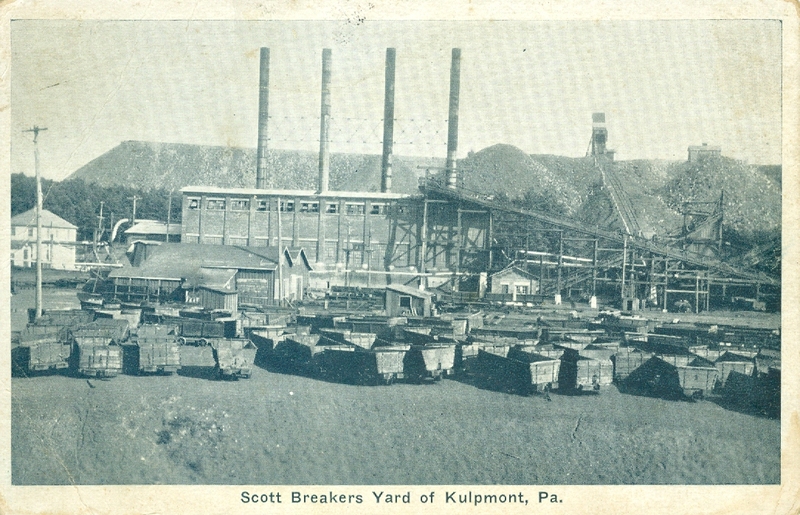 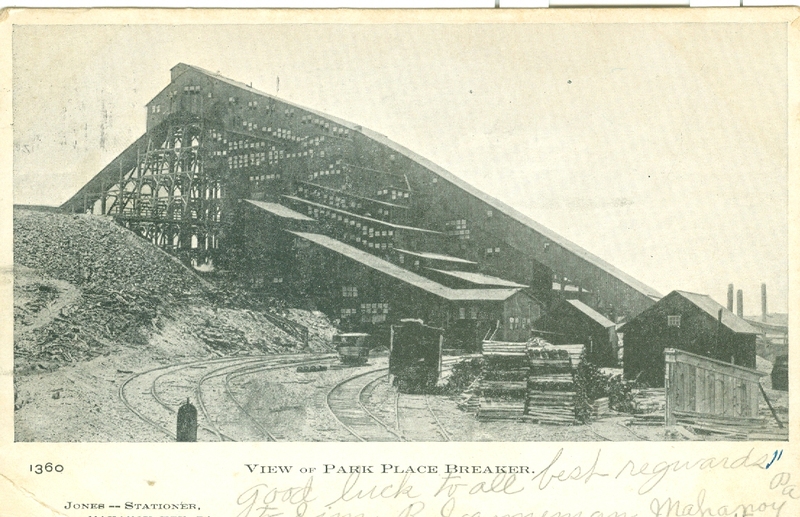 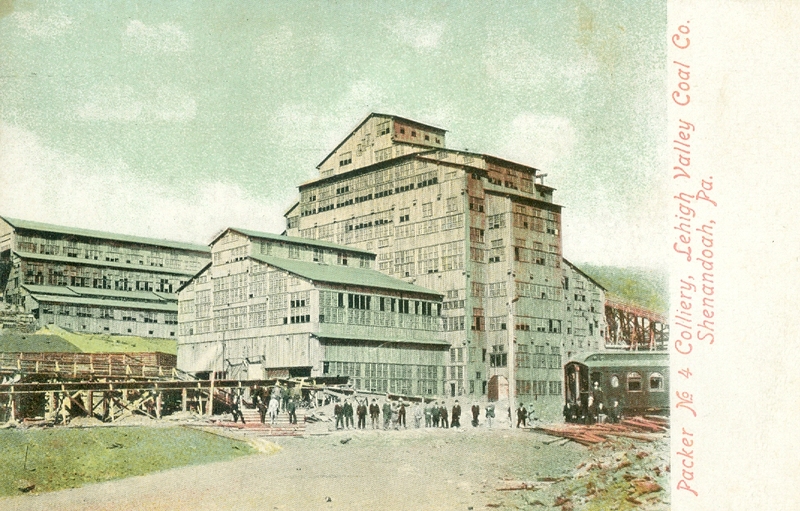 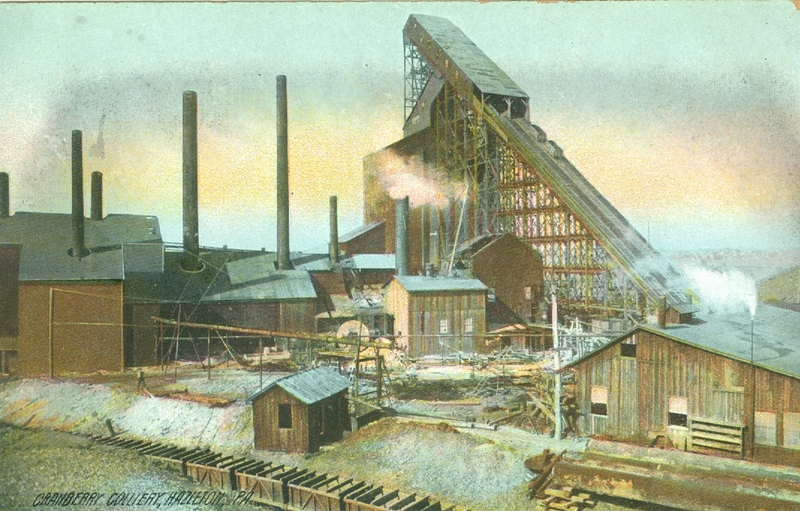 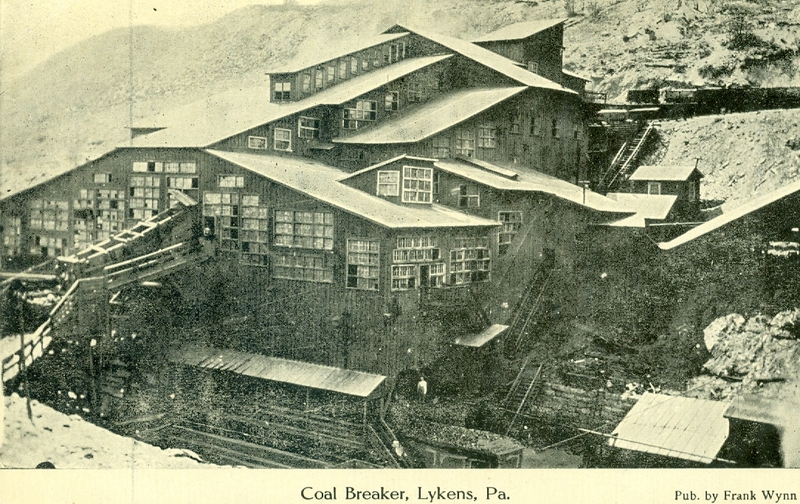 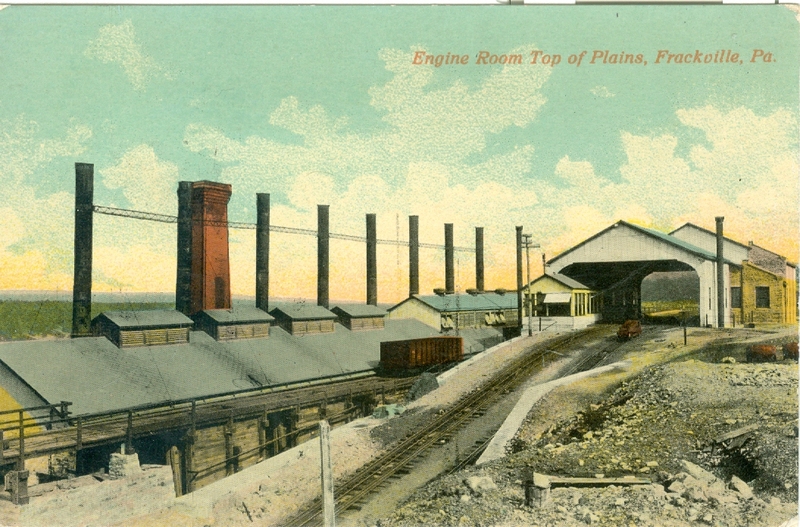 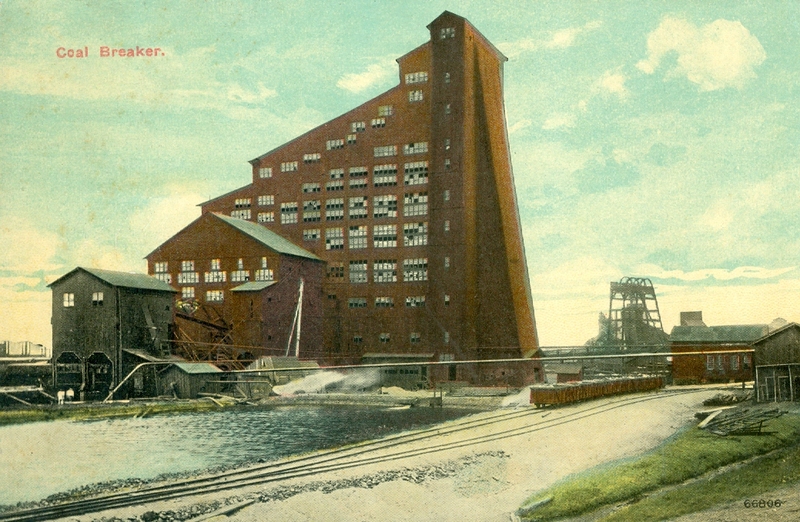 The answer lay in coal breakers which were essentially coal preparation plants housed in buildings on site often as close to the mine opening as possible for economy and ease of operation. 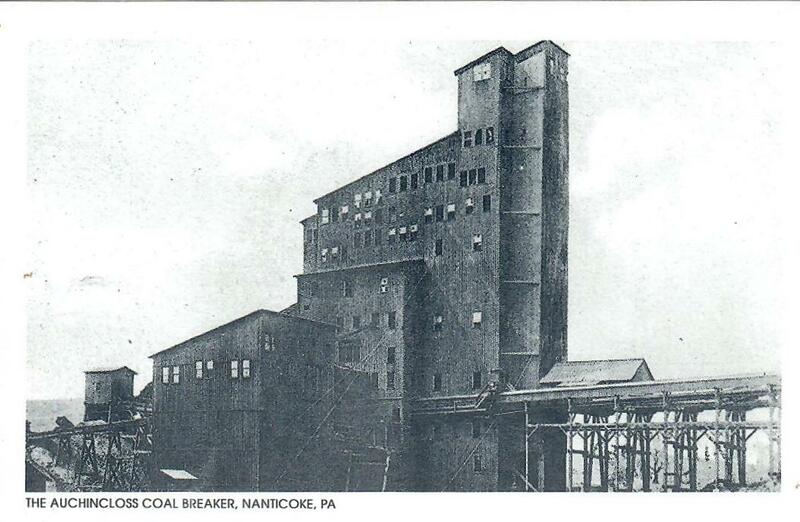 Over the next 150 years coal breakers numbering in the hundreds spread throughout the anthracite region. 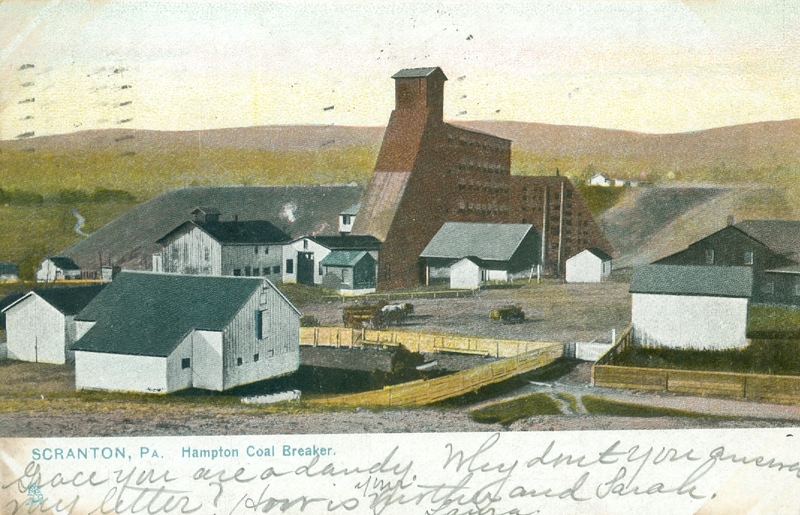 Some had colorful local names; others were simply numbered. 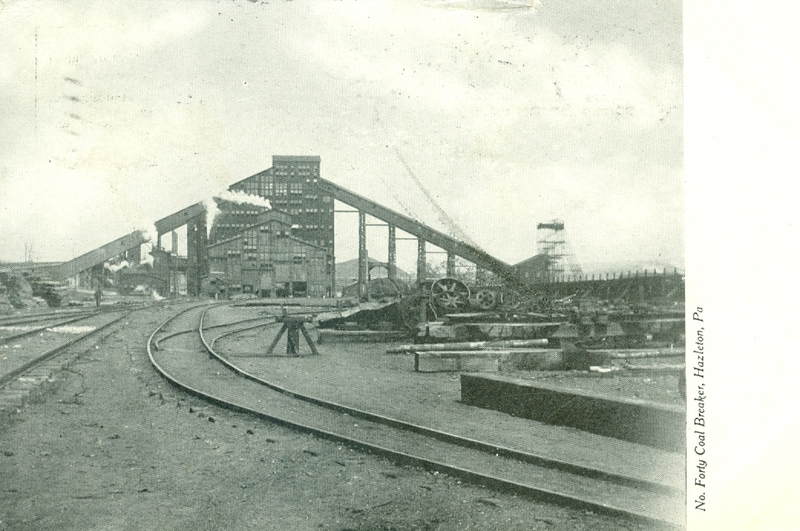 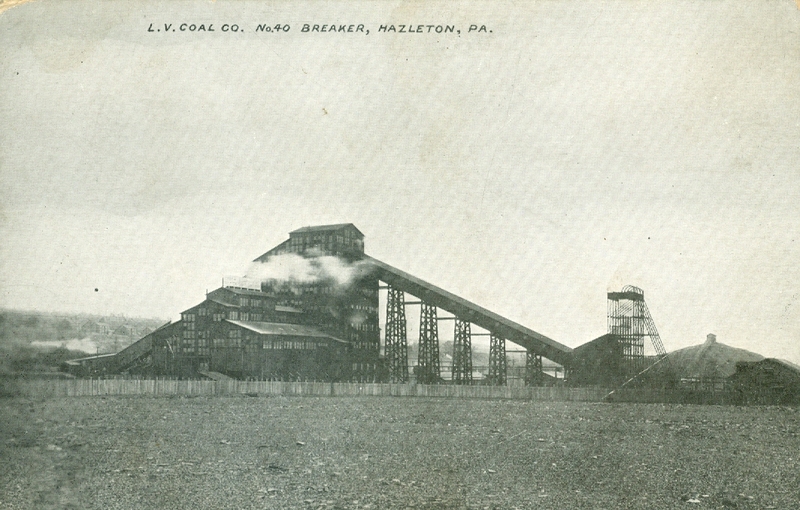 However identified the coal breaker was essential to the operation of the mine. 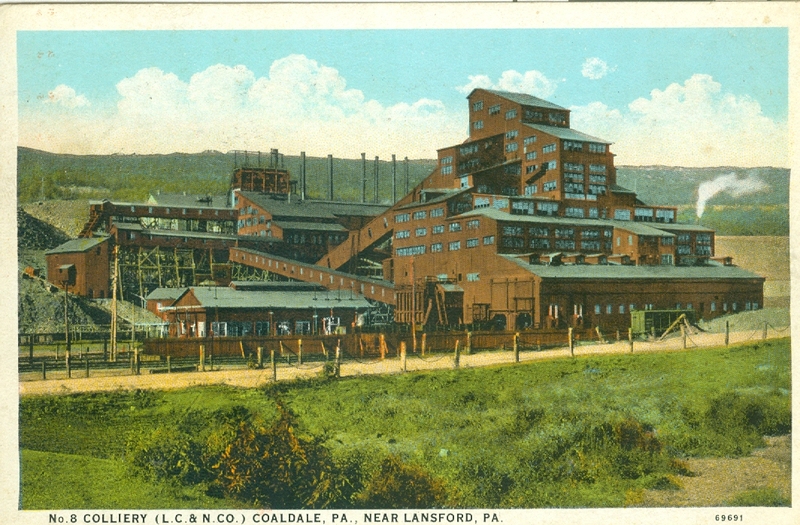 Often dominating the landscape around the various coal patch towns, they were what I like to refer to as MONUMENTS TO KING COAL. 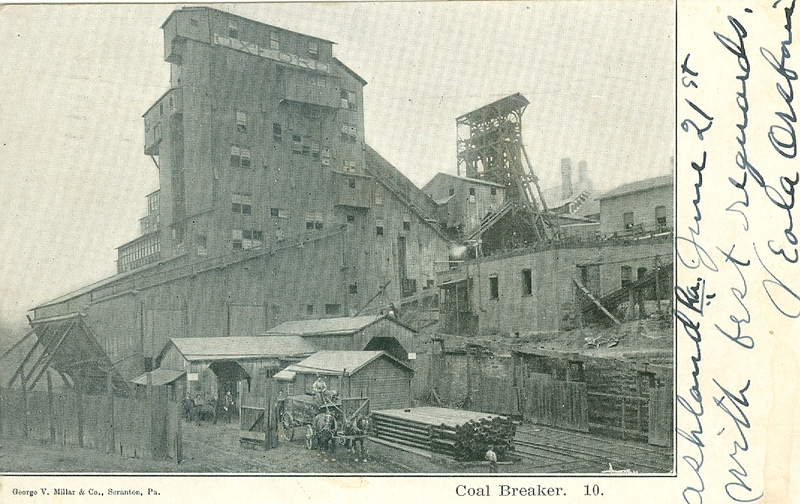 The terms colliery and coal breaker are often used inter-changeably and often imply that they are one in the same. 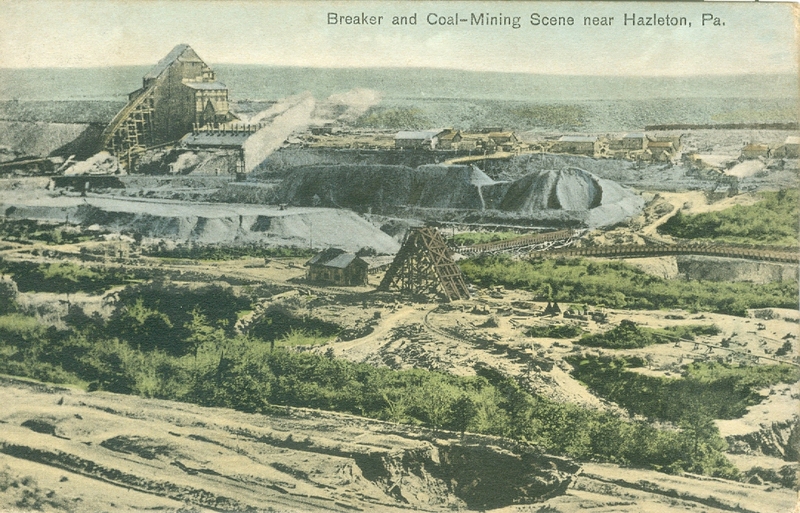 A colliery in reality is where the coal is dug and can often refer to the mine itself and its associated property. 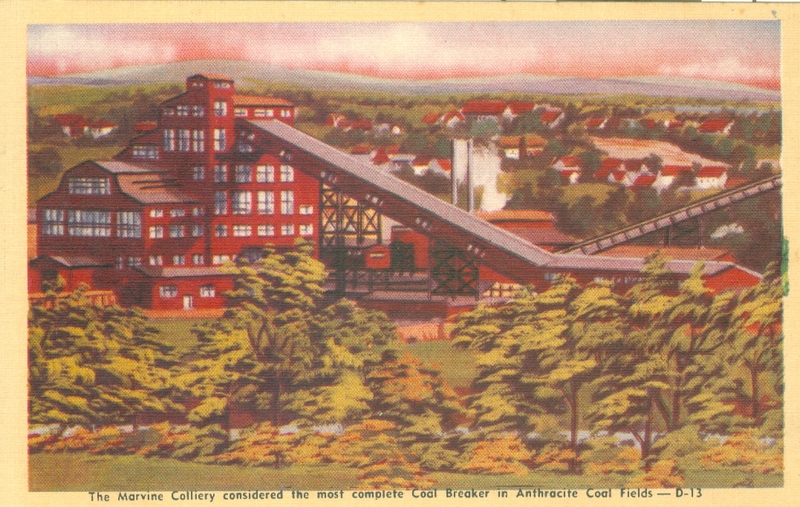 A coal breaker is the coal preparation plant. 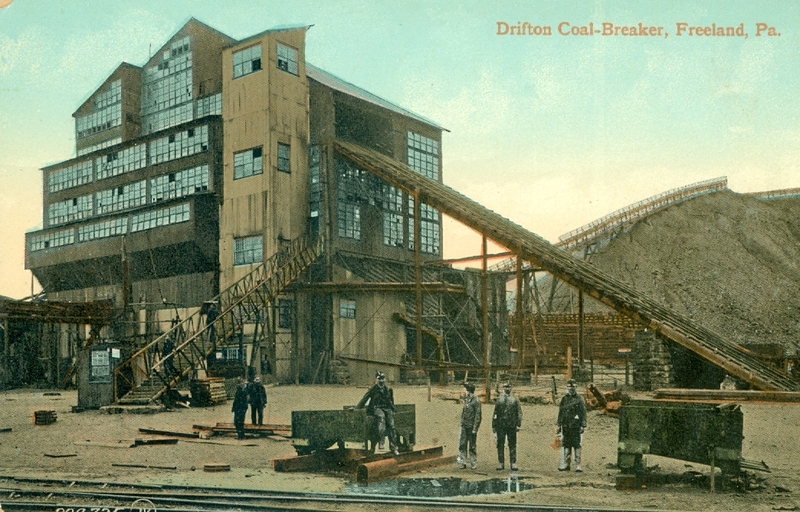 Thus said, it should be noted that all collieries did not have coal breakers, but all coal breakers were associated with one or more collieries. 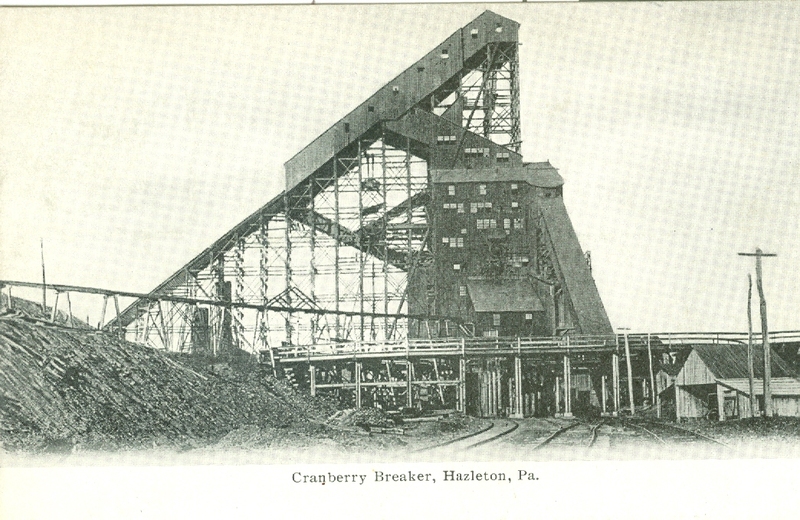 Not every single mine opening had its own breaker and not all breakers had washeries to clean the coal. 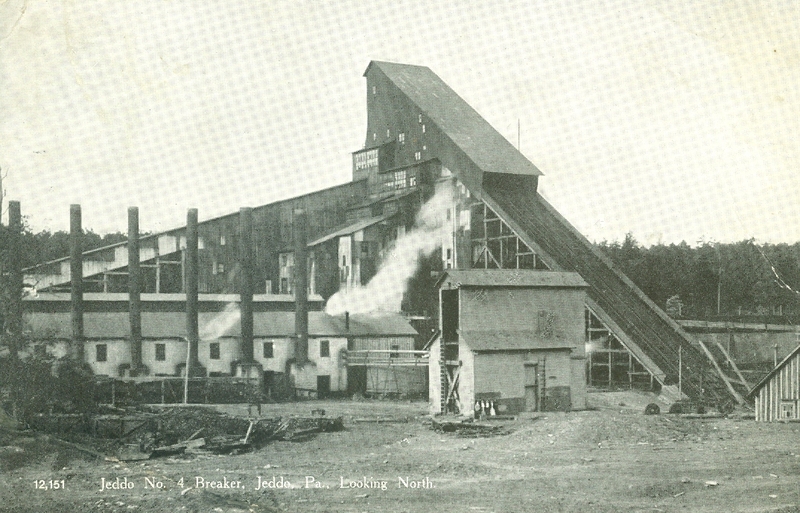 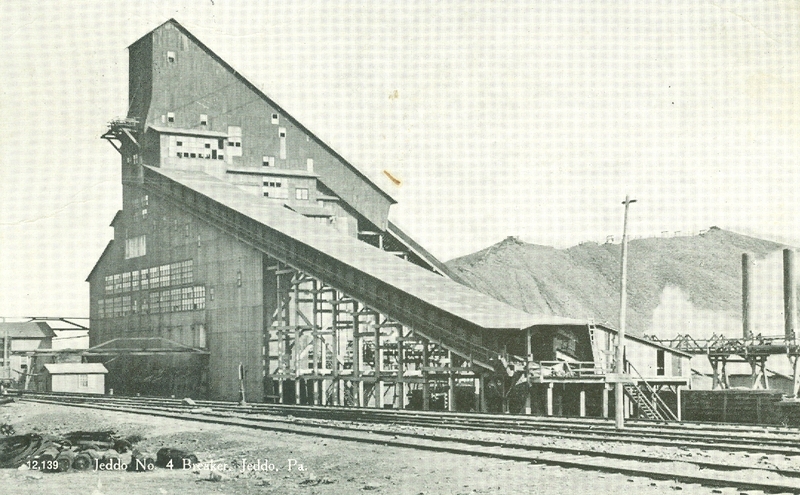 Coal was brought from the mine in jimmies and then dumped at the top of the breaker onto screens with varying hole sizes that separated the coal from some of the dirt. 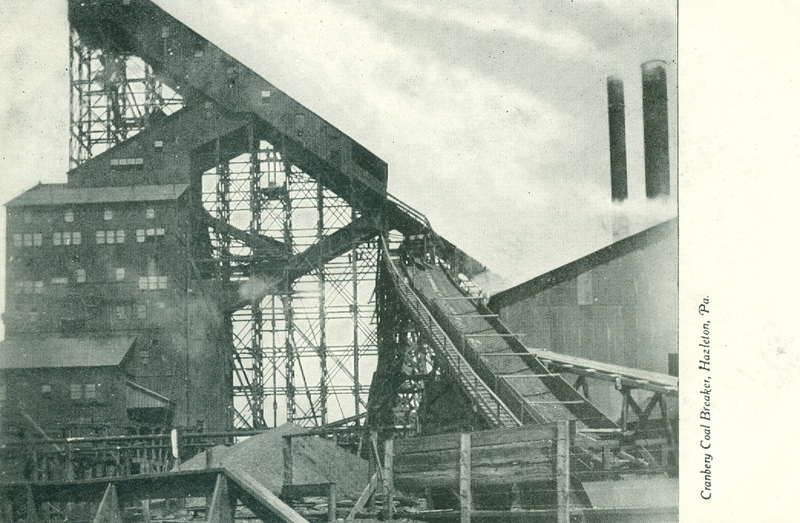 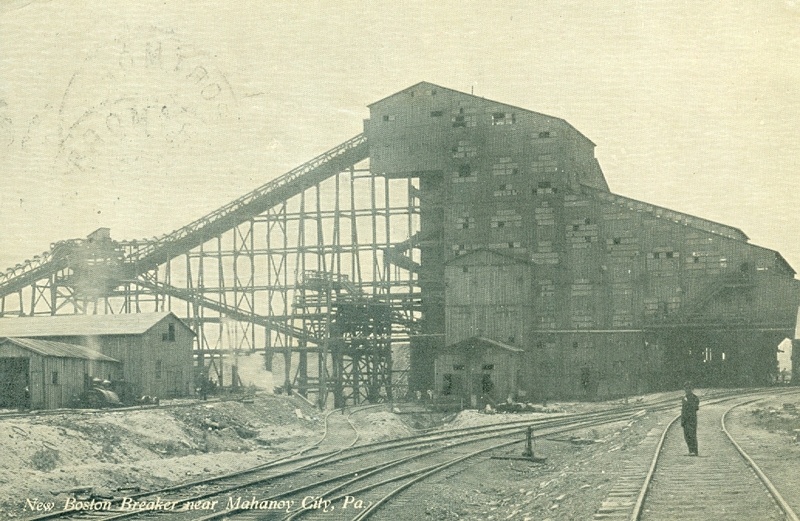 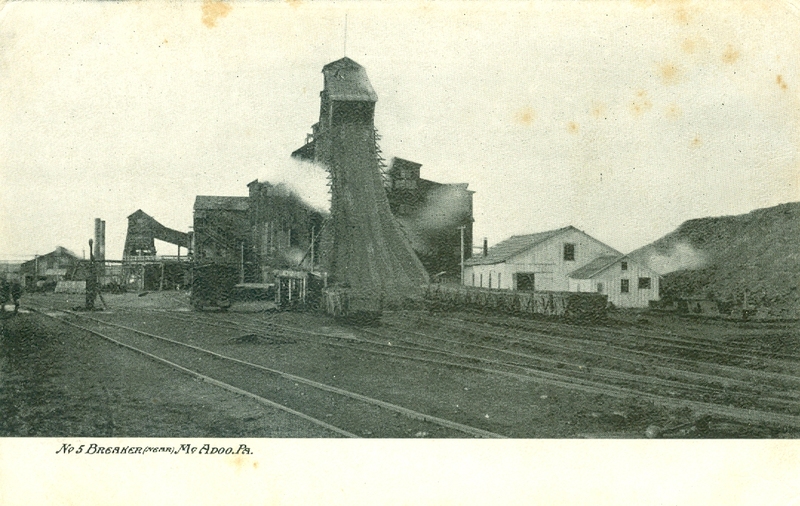 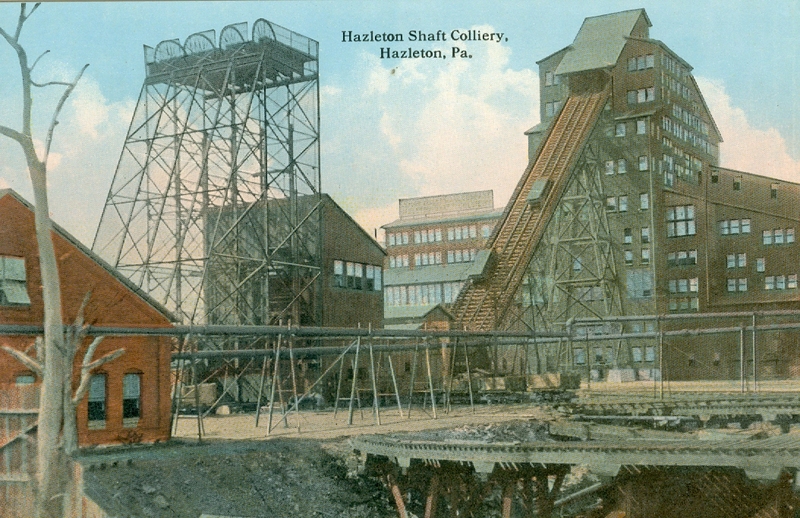 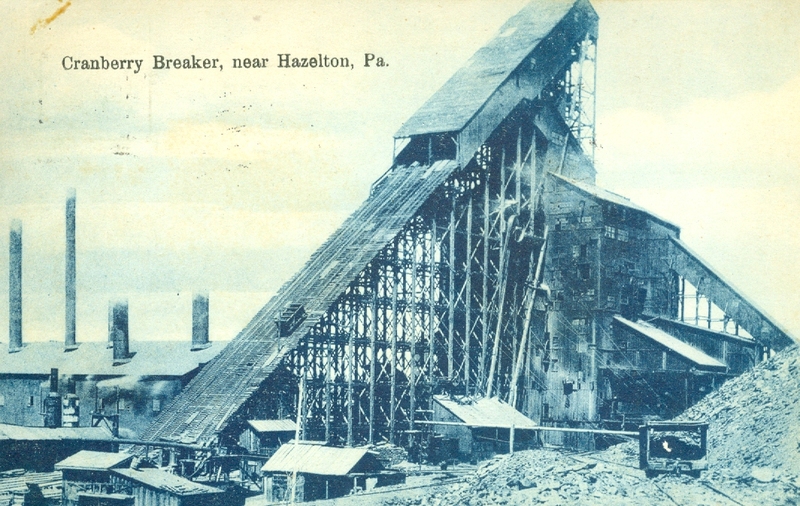 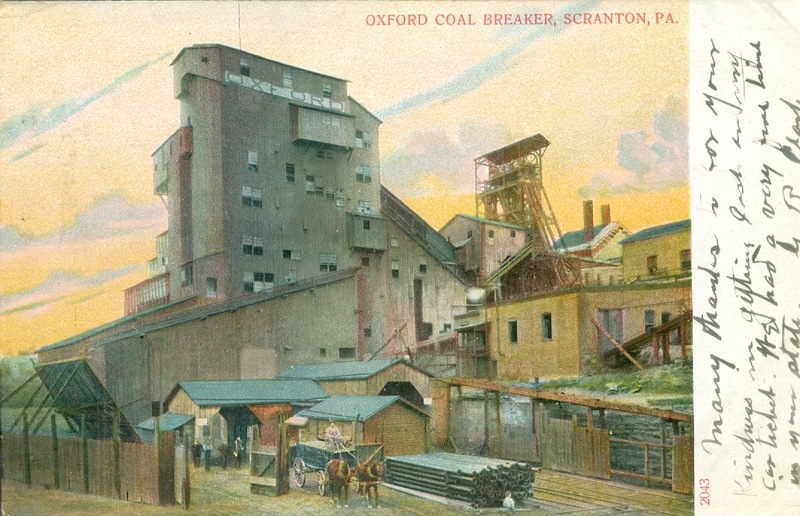 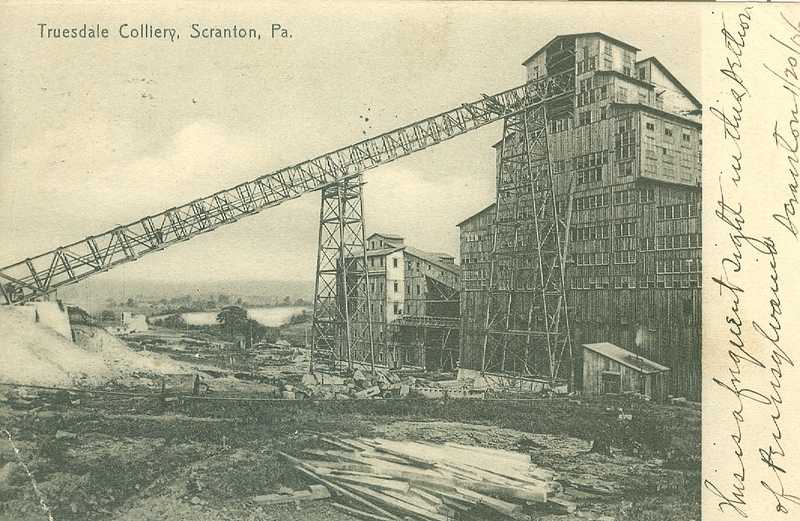 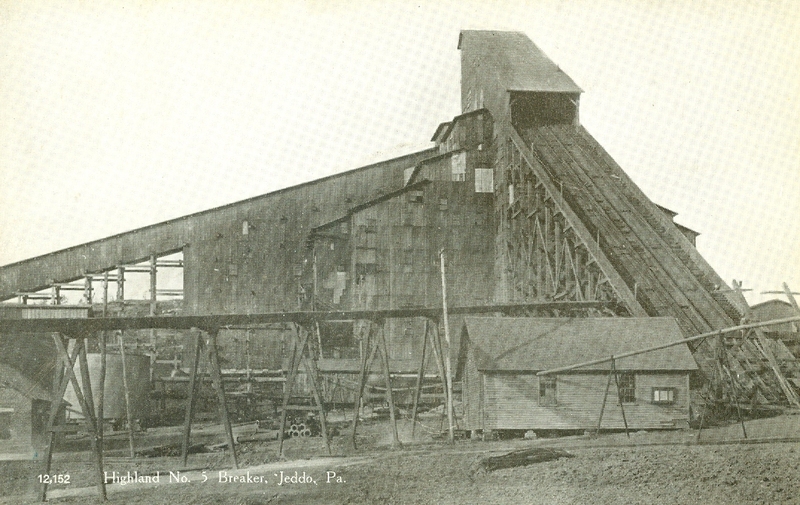 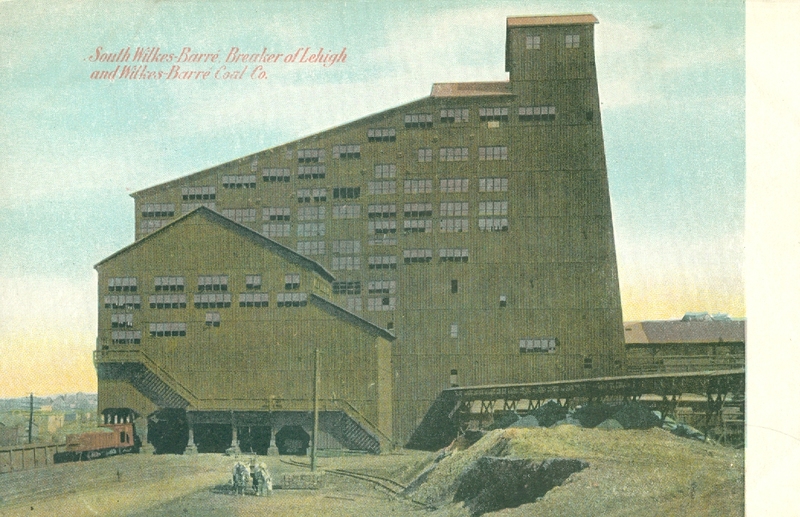 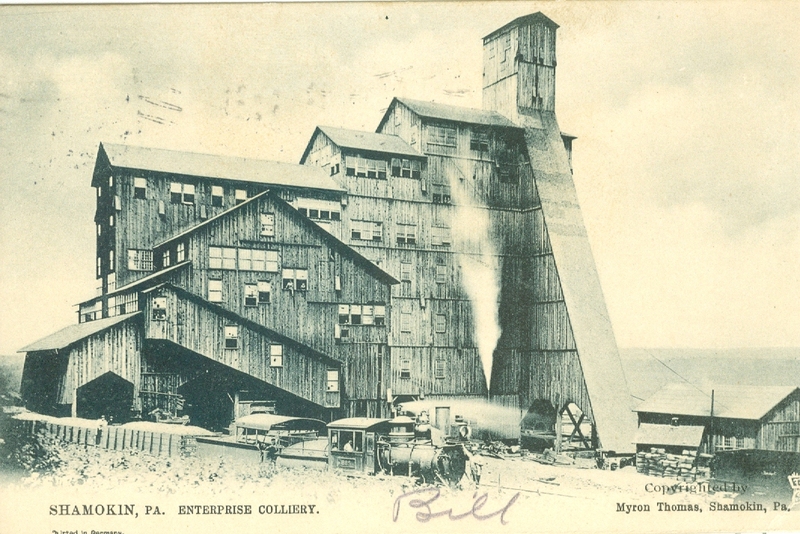 Crushers were then used to break up the coal to fall through the holes in the screen to chutes below that carried the coal into the heart of the breaker. 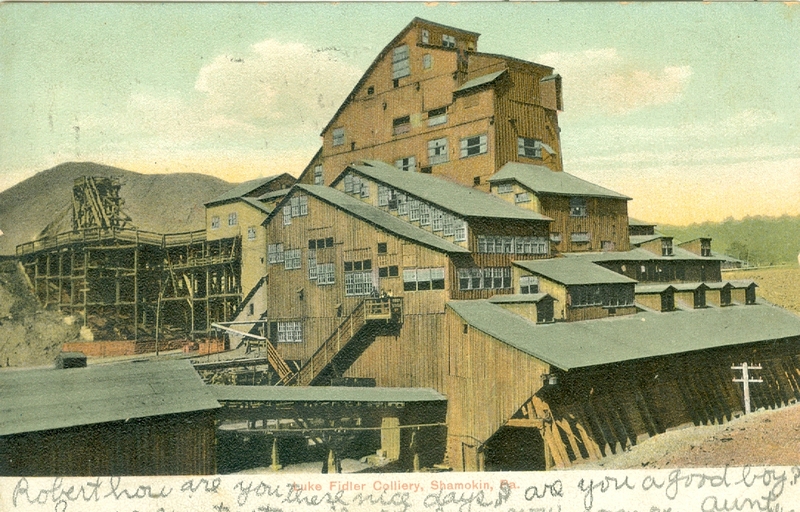 Here pre-teen boys sat hunched over the chutes. 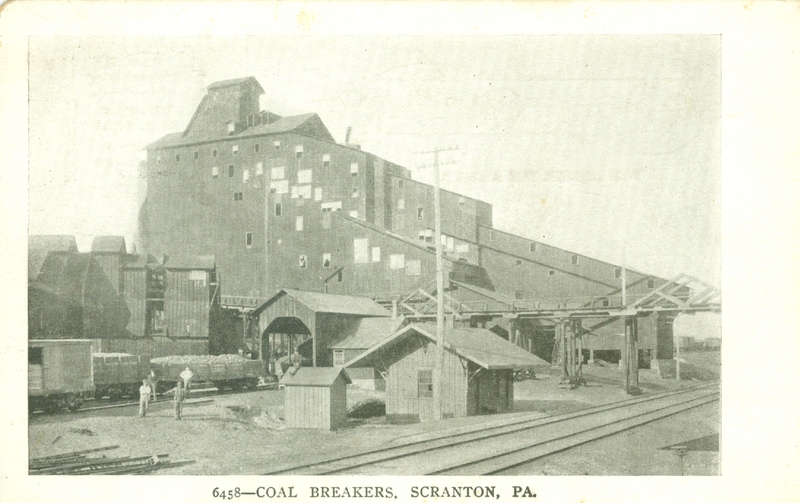 The breaker boys, as they were called, had the unenviable job of trying to pick slate and other impurities out of the passing coal moving below their legs. 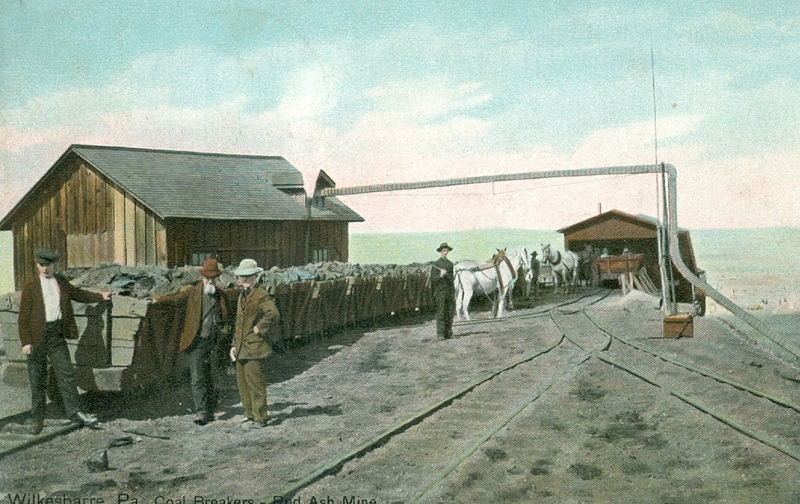 The dust was almost unbearable with little more than handkerchiefs or rags tied over the nose to permit breathing. 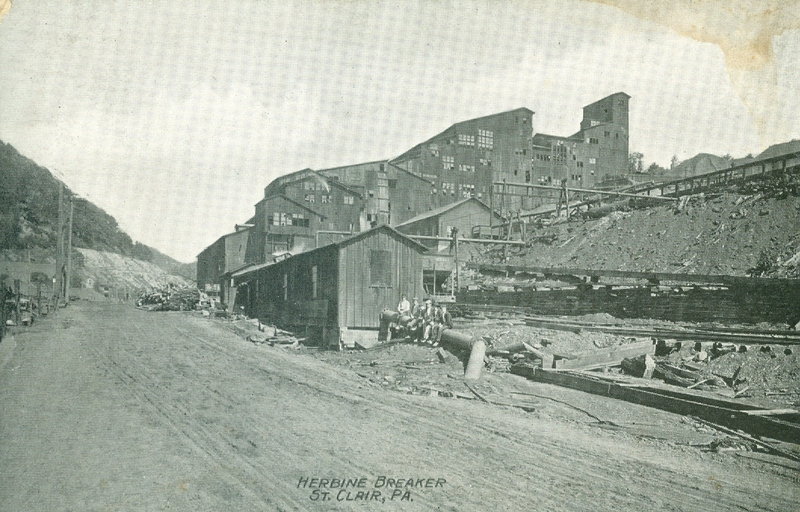 While the coal rumbled and shook and the dust and dirt rose about the breaker boys, foremen with clubs or straps were close at hand and not shy in hastily applying a sharp rap or slash to the backside or to the head for perceived slacking off or inattention to the task as hand. 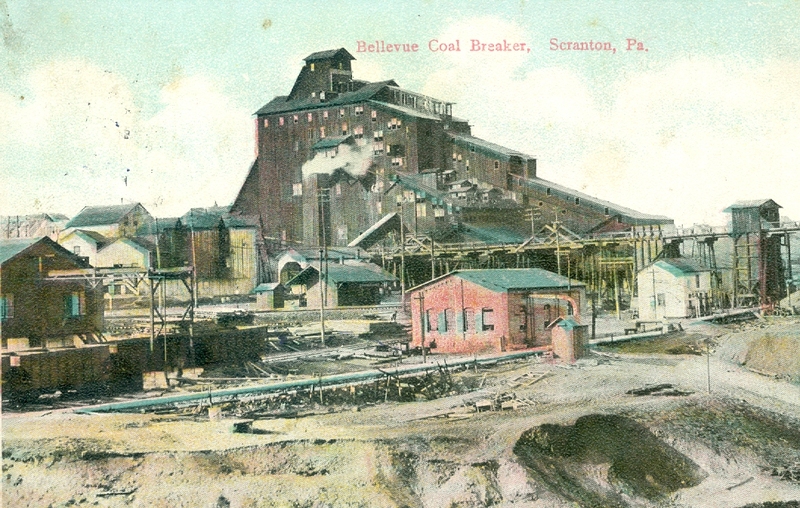 Injuries to breaker boys were commonplace as fingers and hands were often maimed by the sharp edges of the jagged slate mixed with the coal. 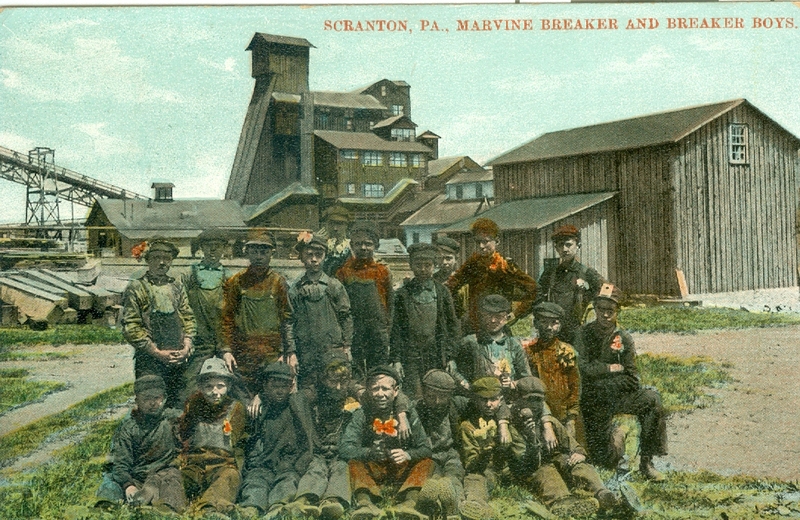 In fact, it was said that breaker boys could often easily be identified by checking scarred and mutilated hands that were minus one or more fingers. 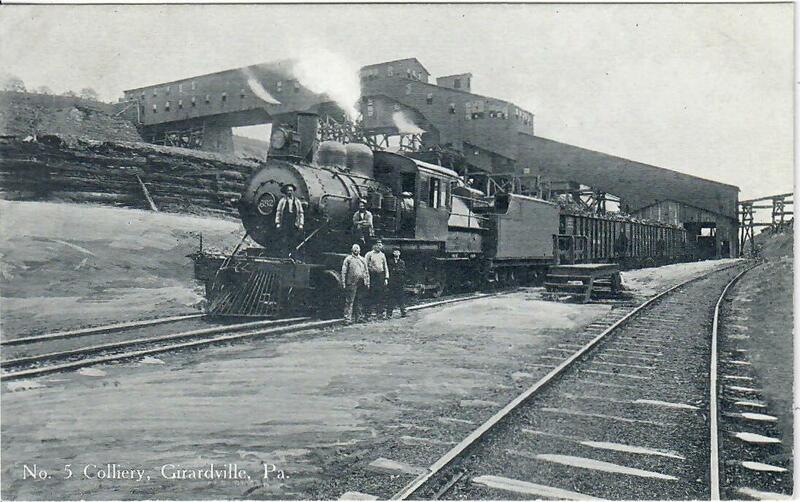 Coupled with the dirt and discipline was the constant noise of moving machinery and tumbling coal. 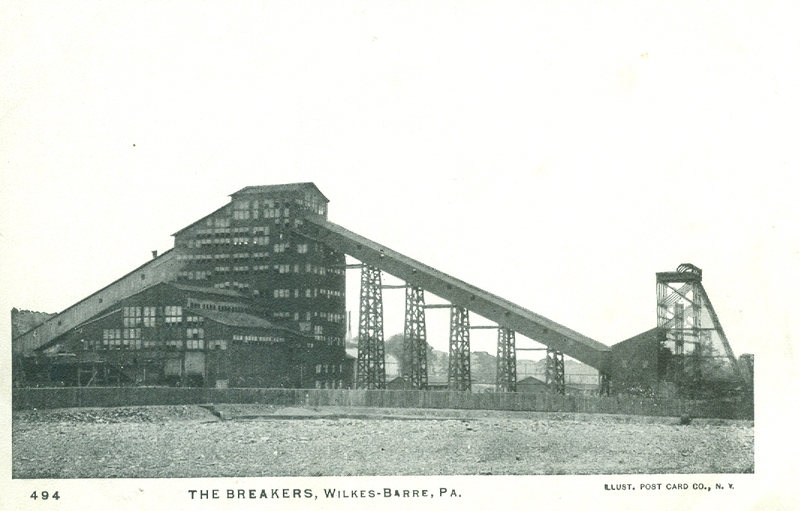 Additionally the breakers were poorly ventilated. 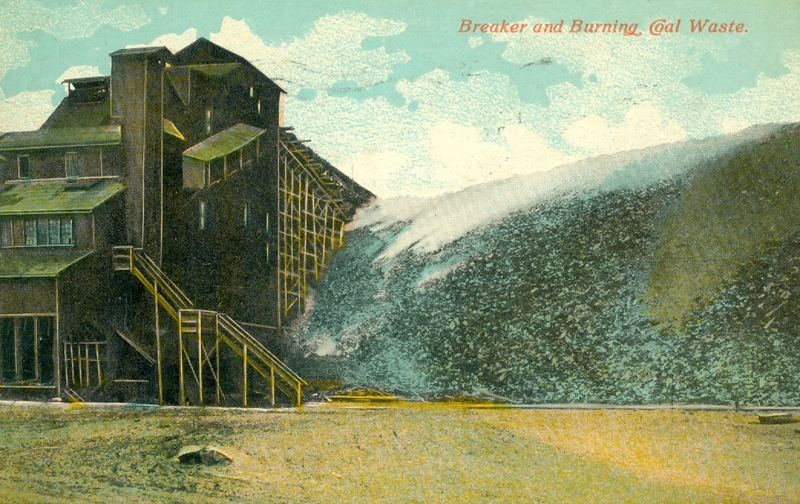 The summer time heat was often next to unbearable while winter brought bone chilling cold. 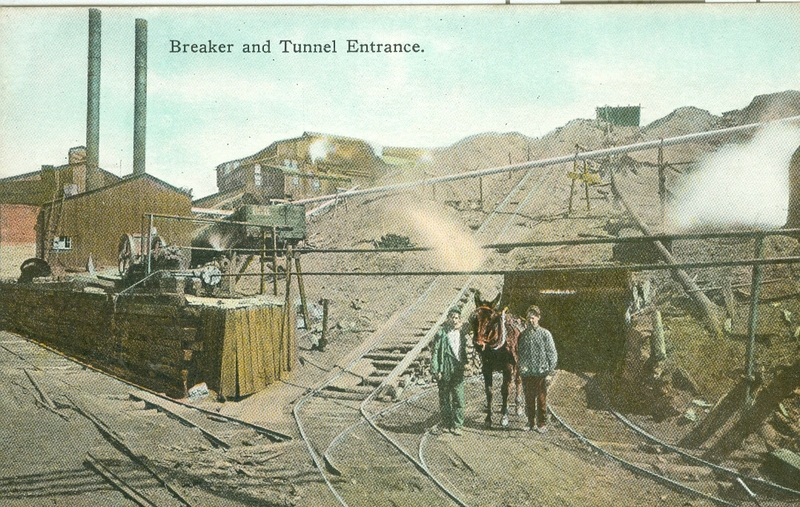 No wonder if any boy survived a few years of this menial torture that promotion to mule driver or nipper in the mines was viewed with relief and salvation. 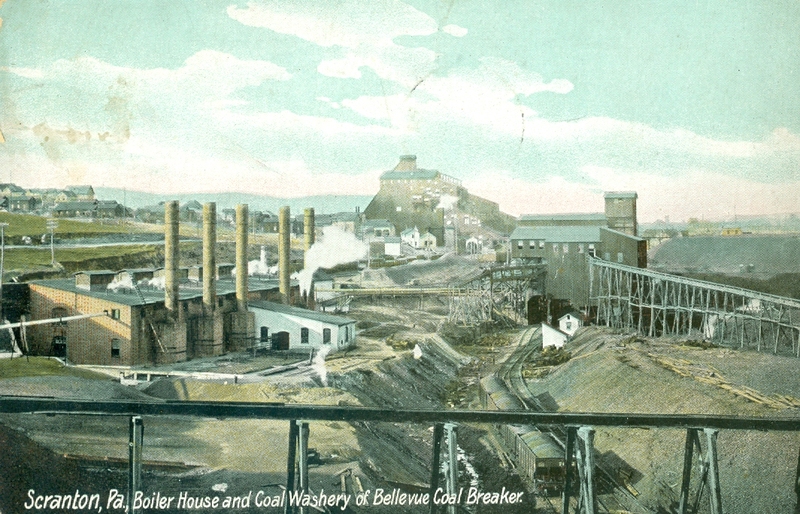 Once the coal was cleaned and sized as best as possible, the remaining dirt, slate and other impurities were dumped outside the breaker in a large refuse pile known as the culm bank. 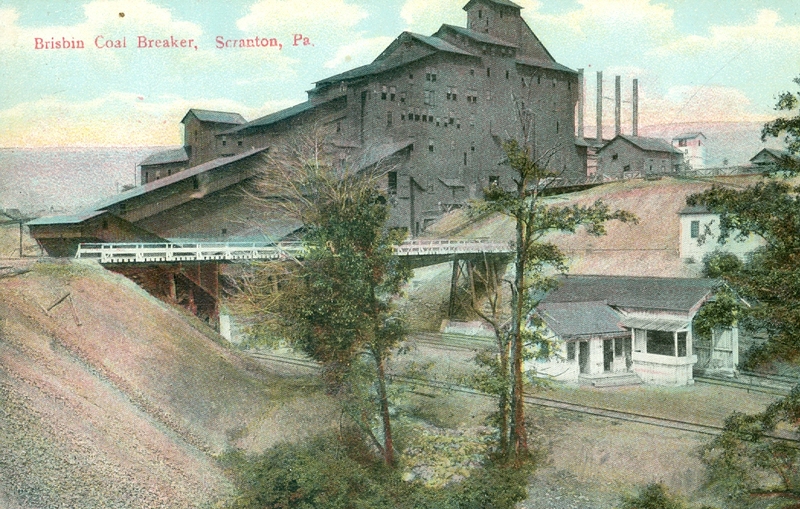 Often these culm banks in time grew in size to dwarf the adjacent coal breaker. 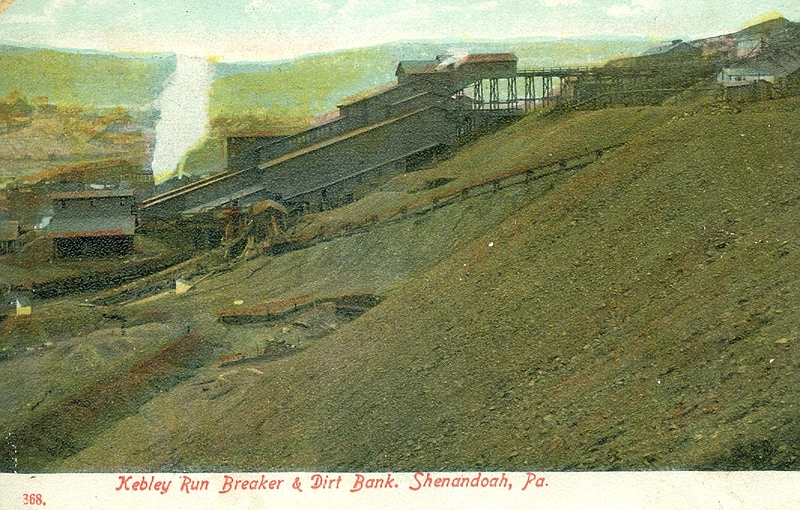 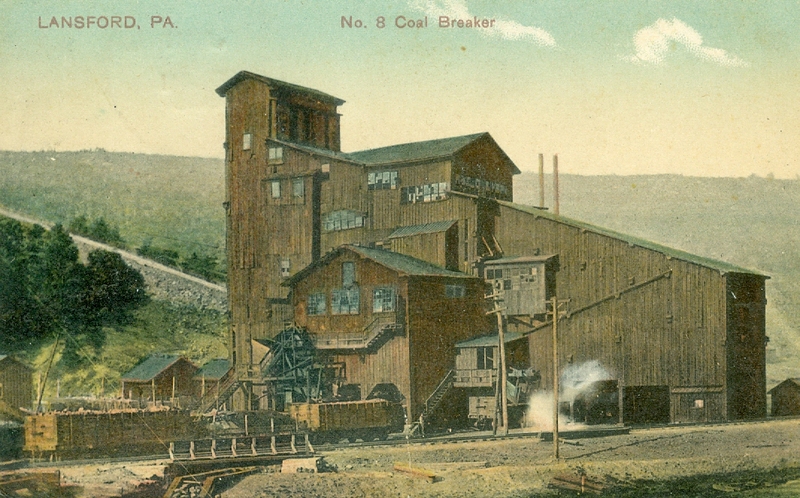 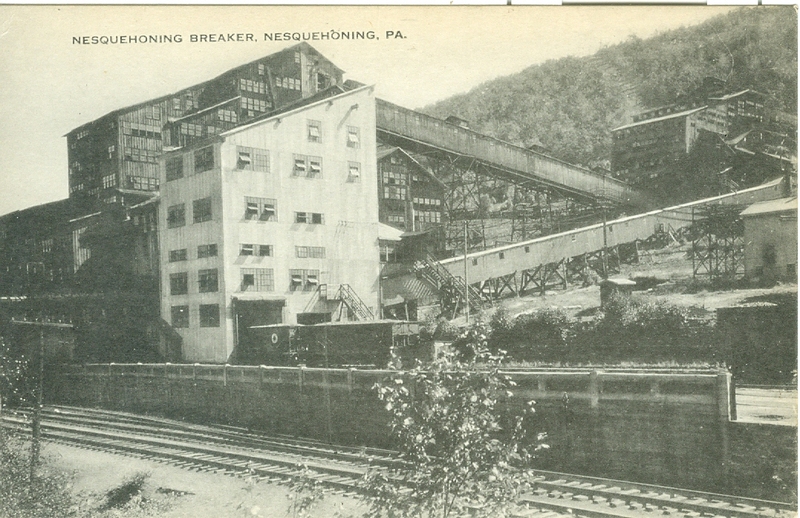 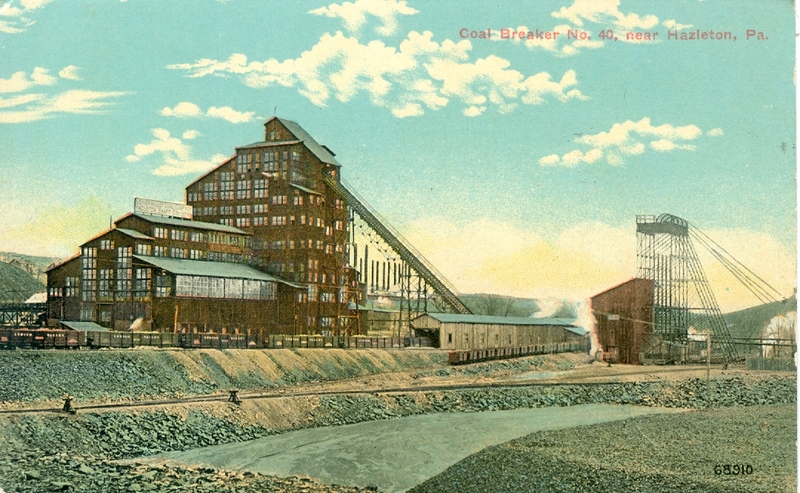 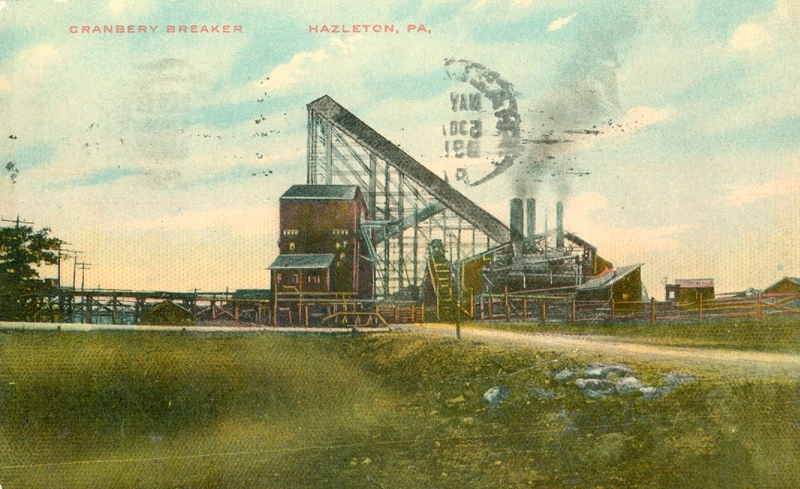 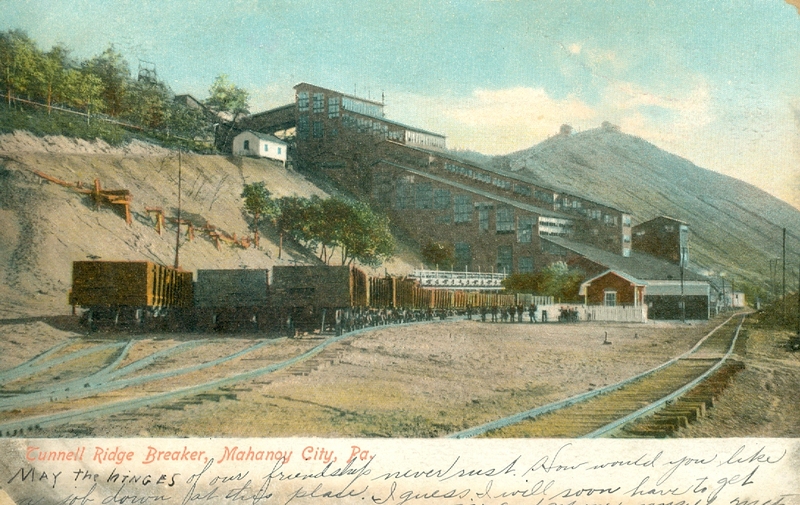 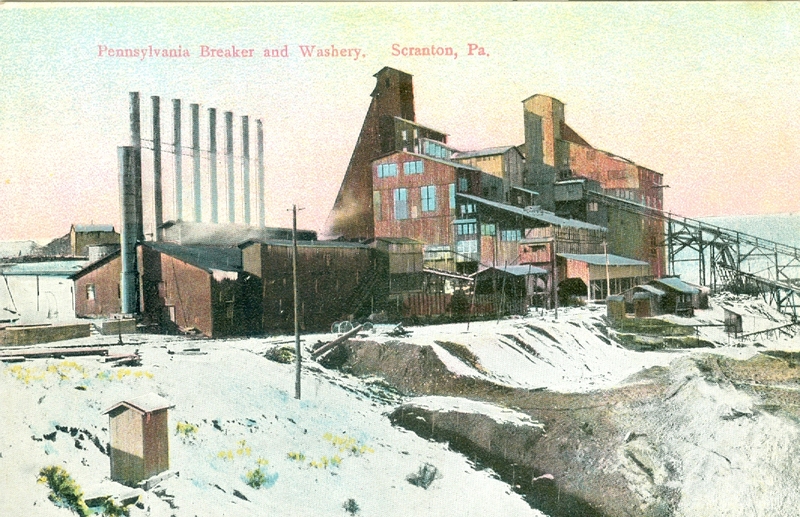 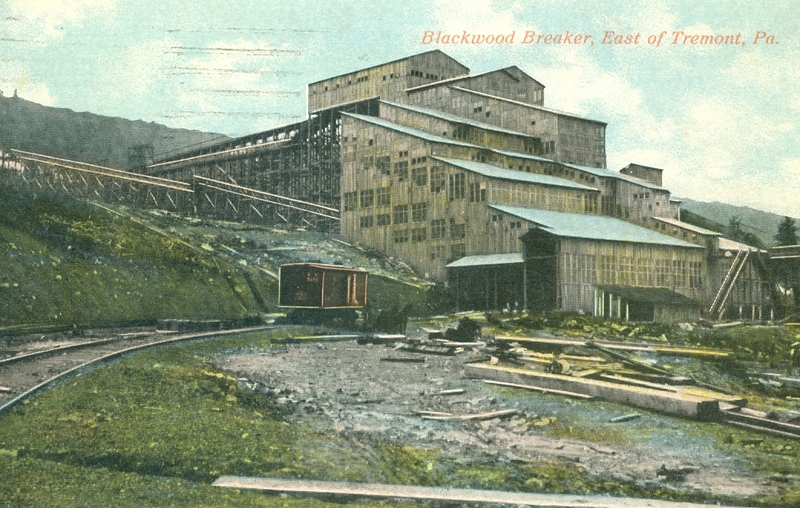 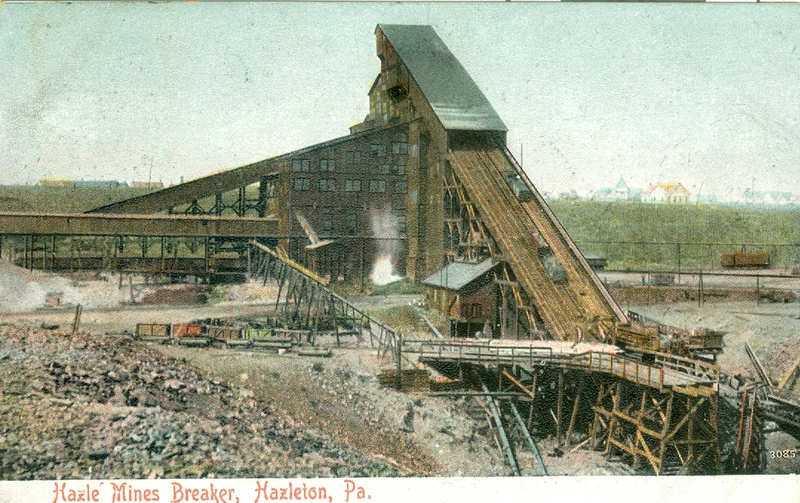 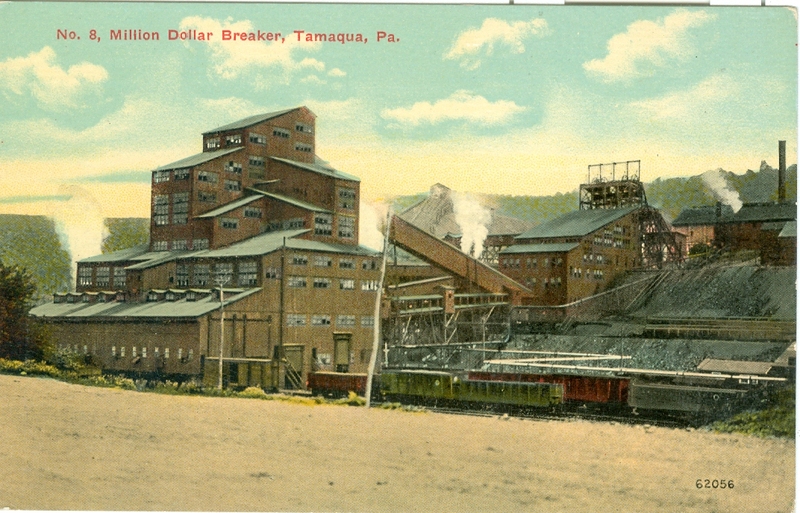 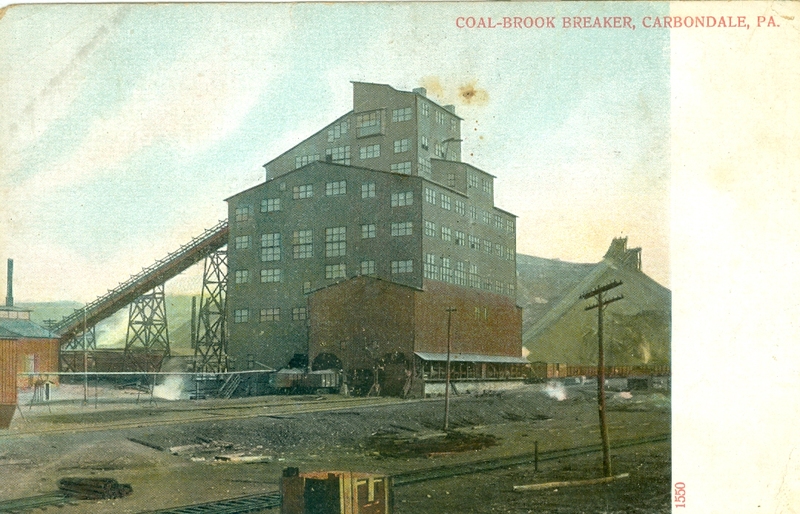 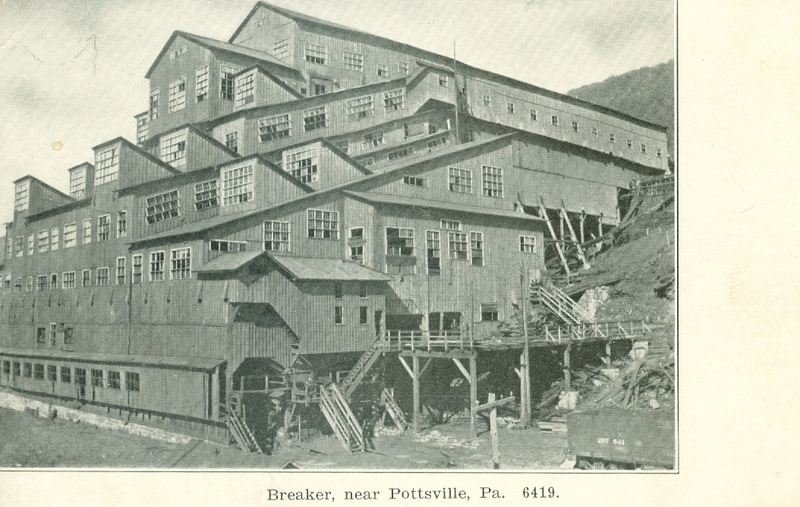 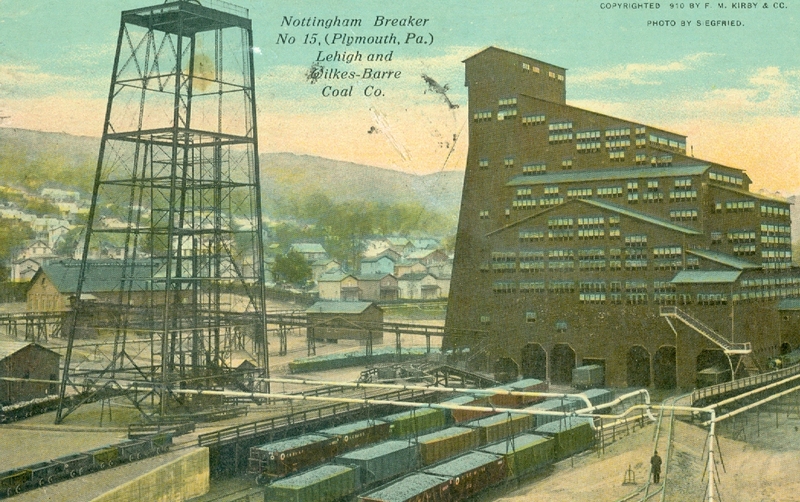 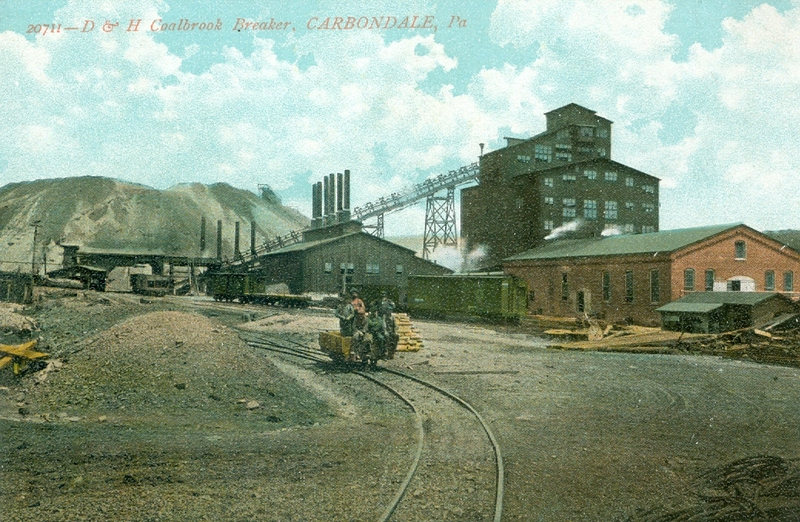 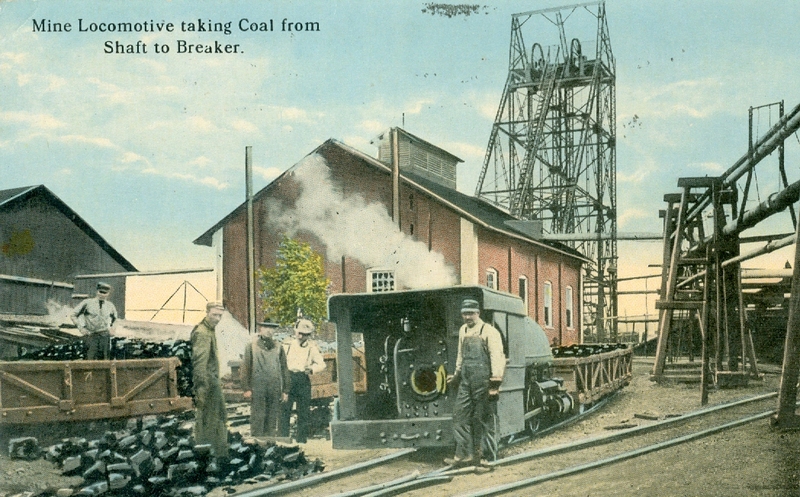 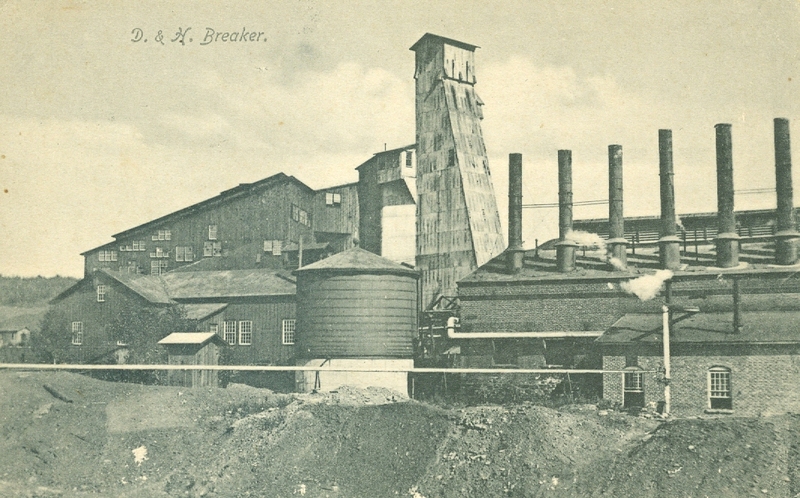 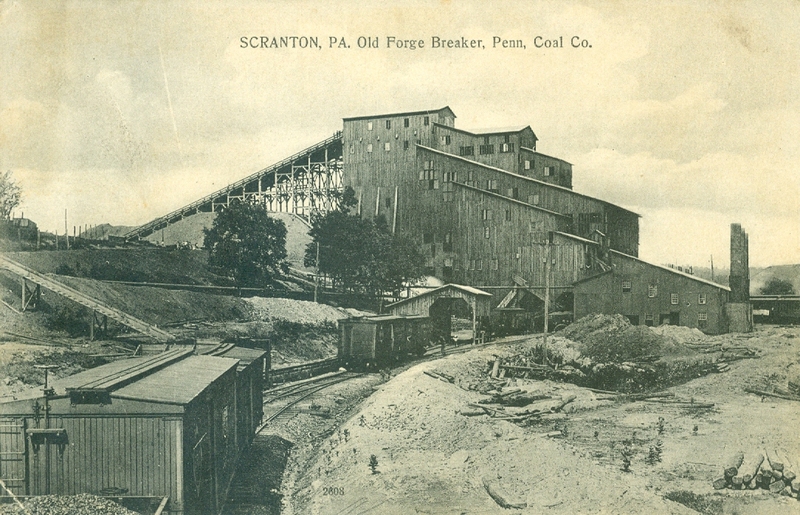 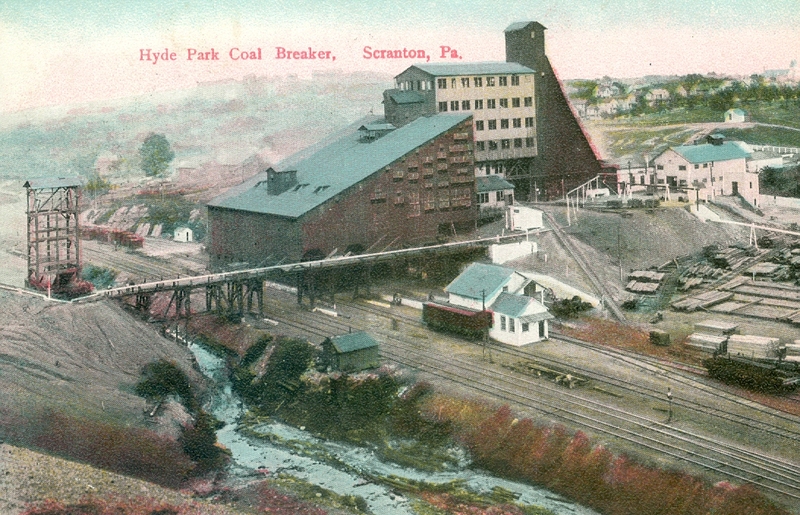 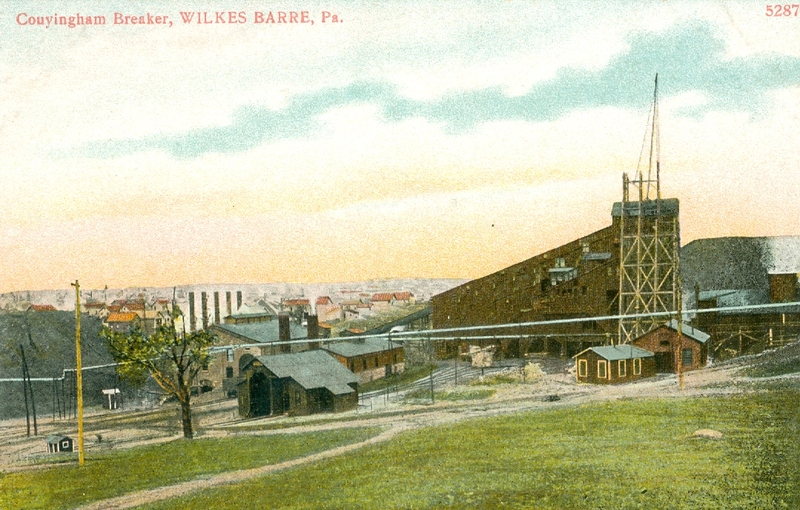 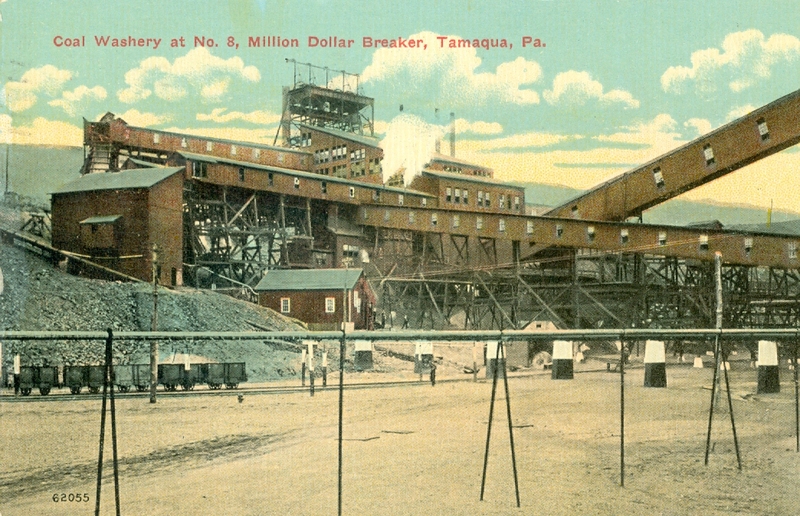 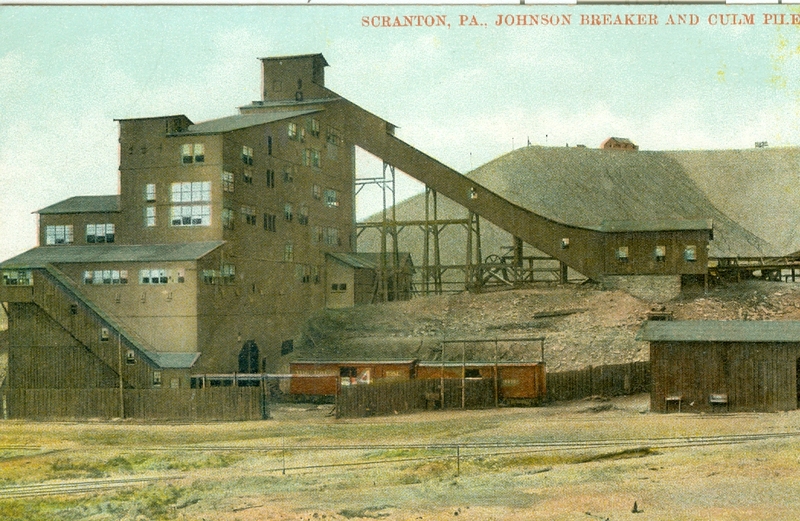 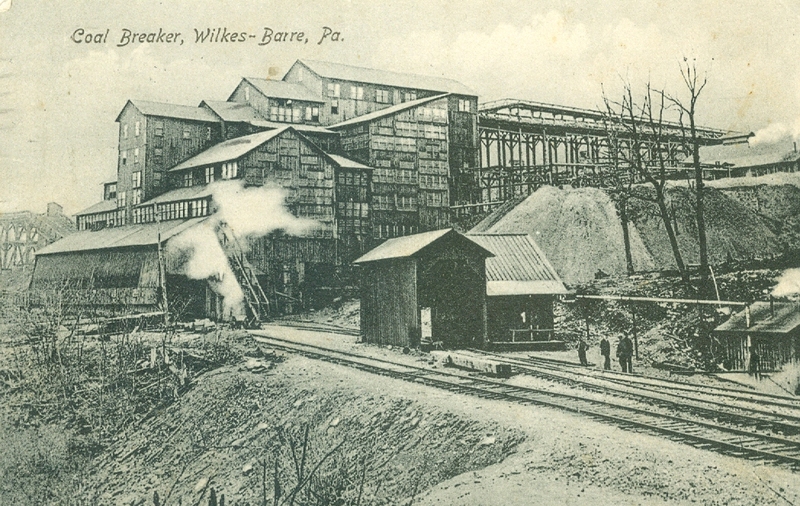 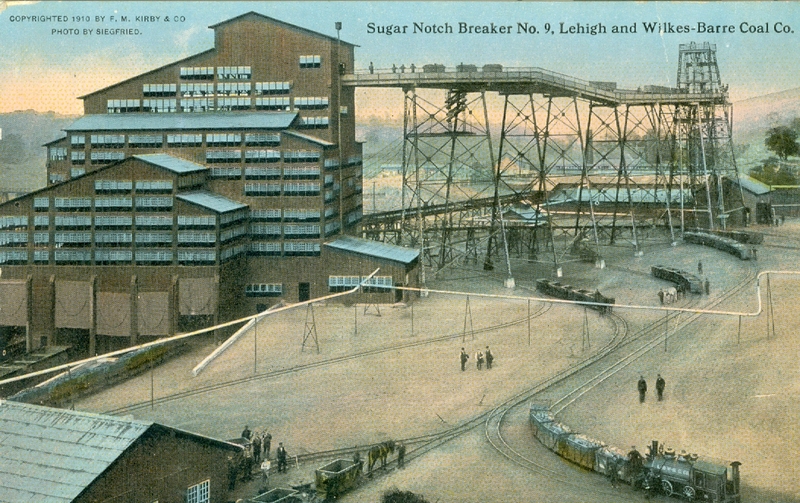 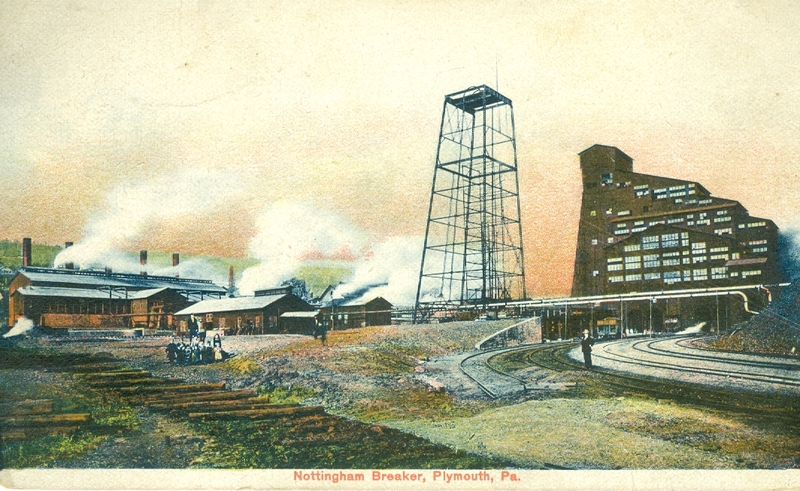 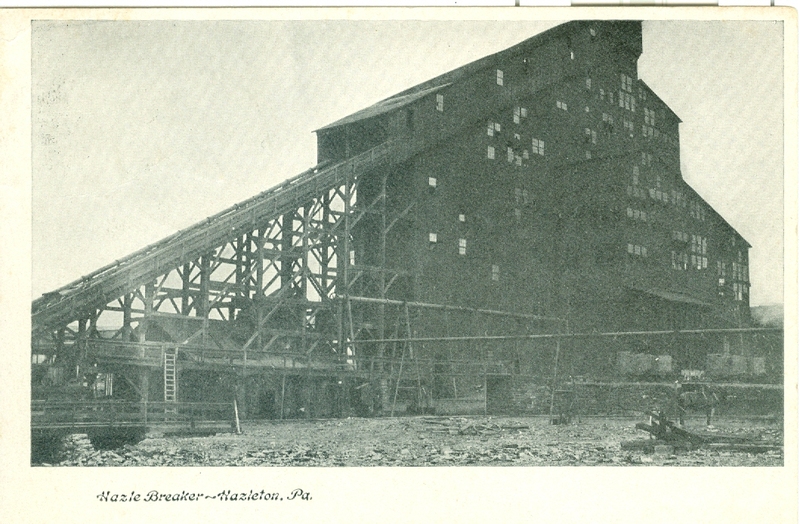 The breaker process was far from perfect with much coal crushed beyond practical use. 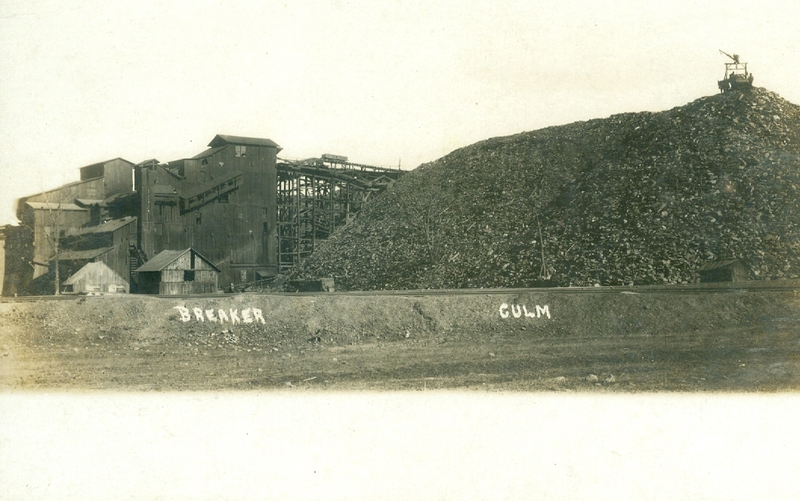 This considerable coal waste often headed to the culm bank with the rock, slate and other impurities. 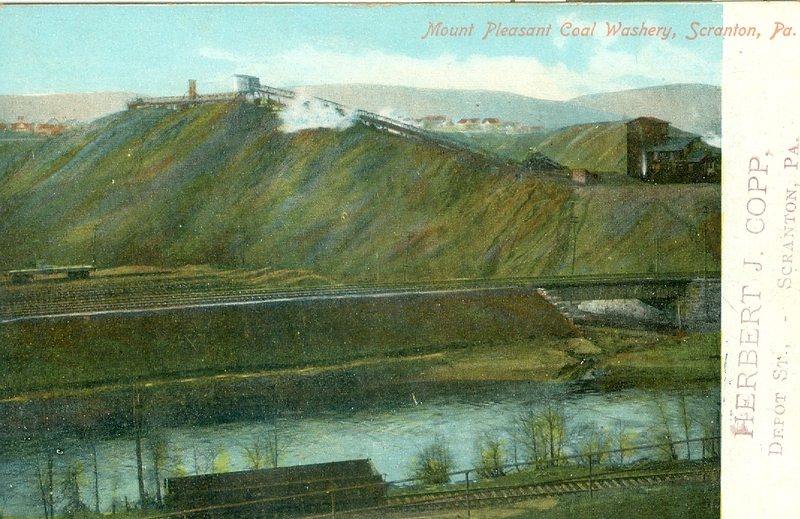 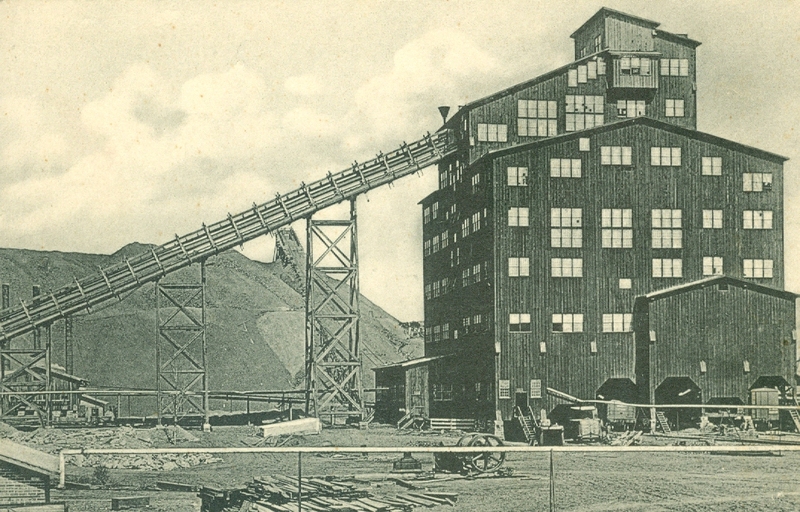 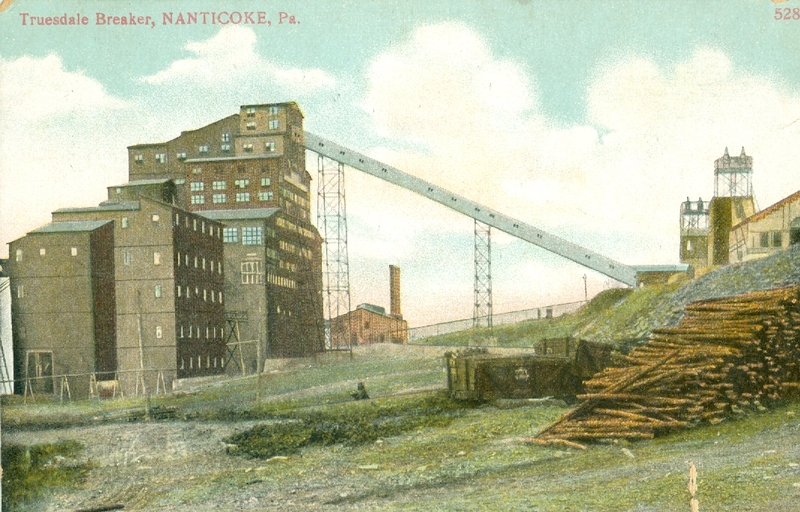 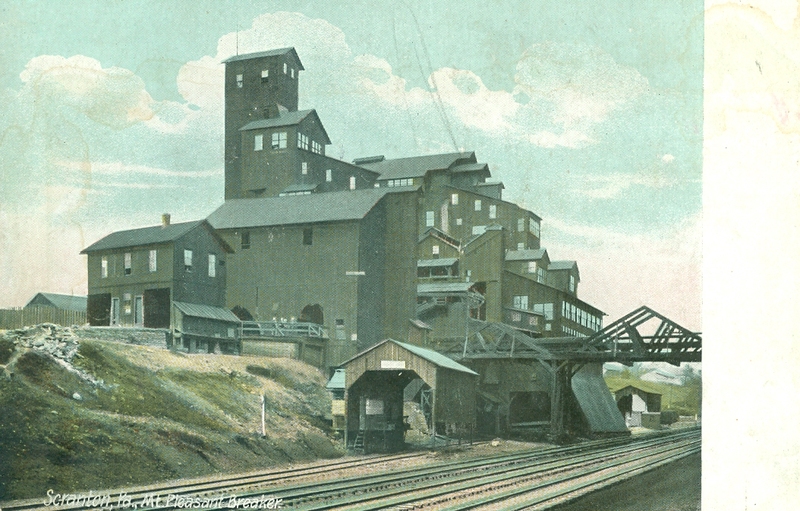 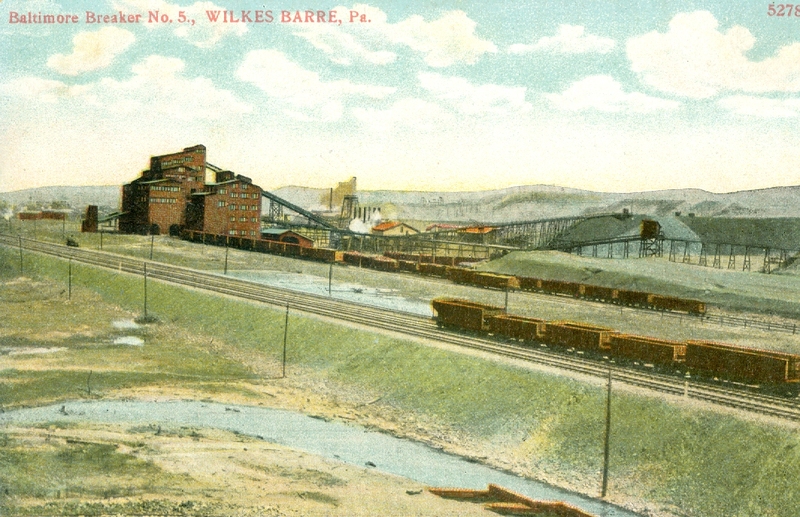 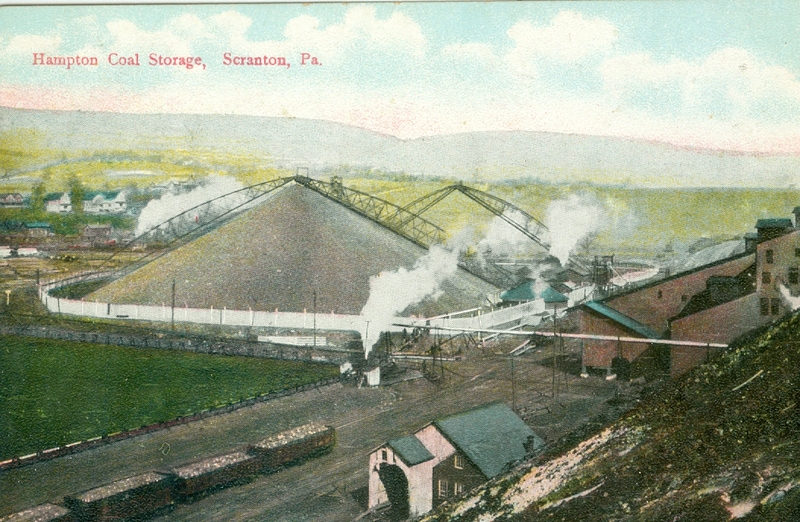 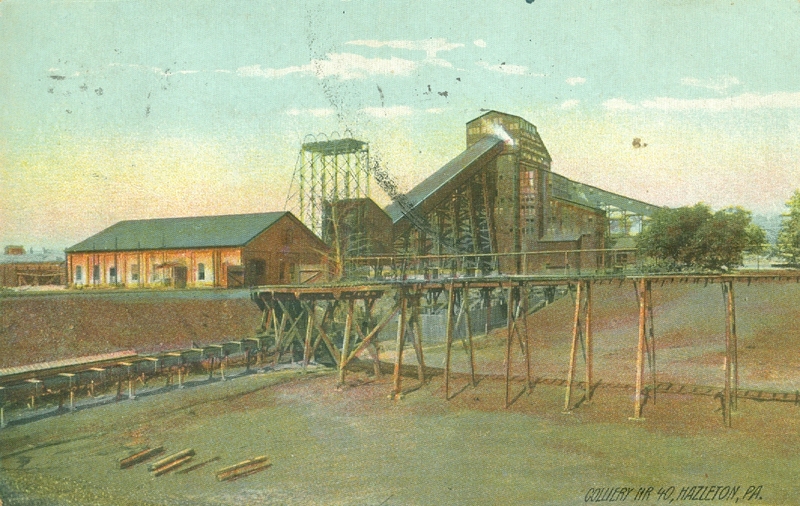 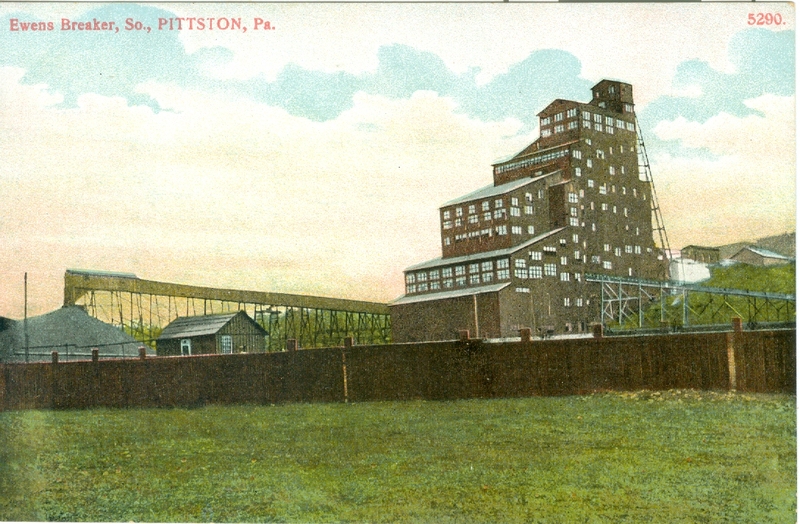 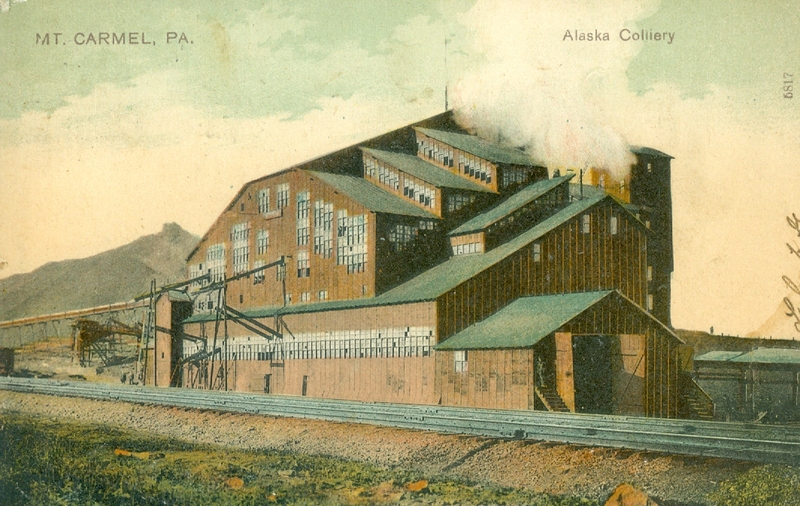 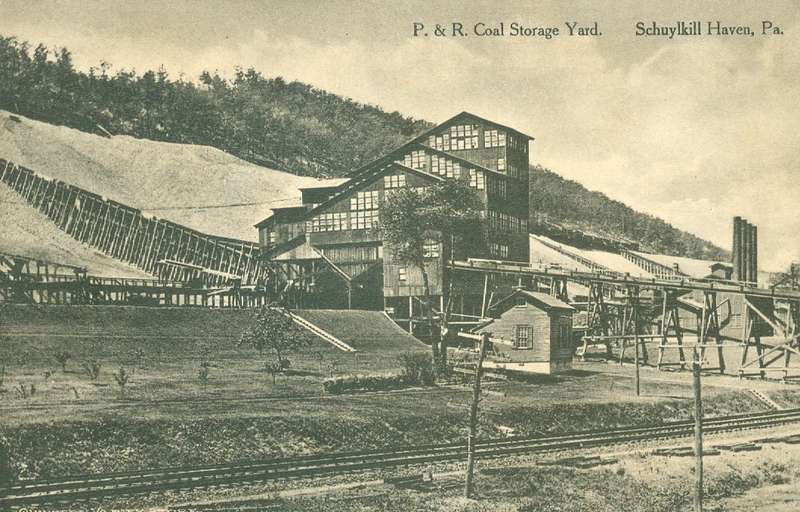 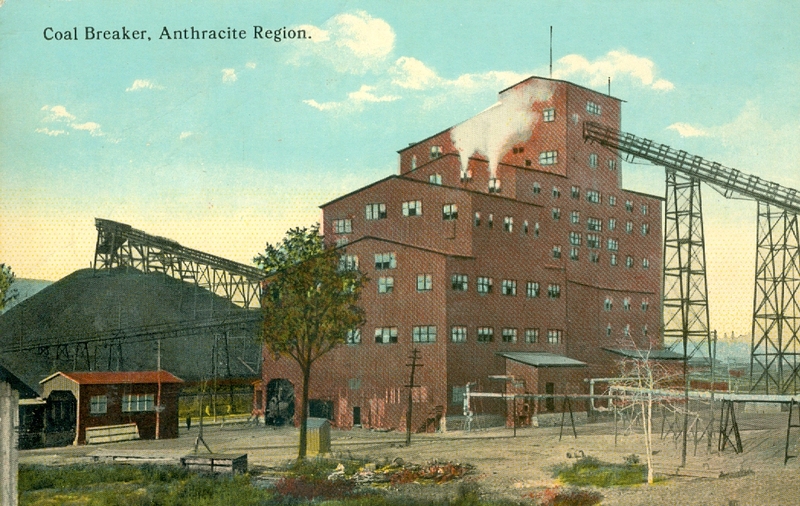 In later years, with the cleaning and sizing process still not perfected, this small sized coal waste was now called by additional grading names such as pea, rice or buckwheat. 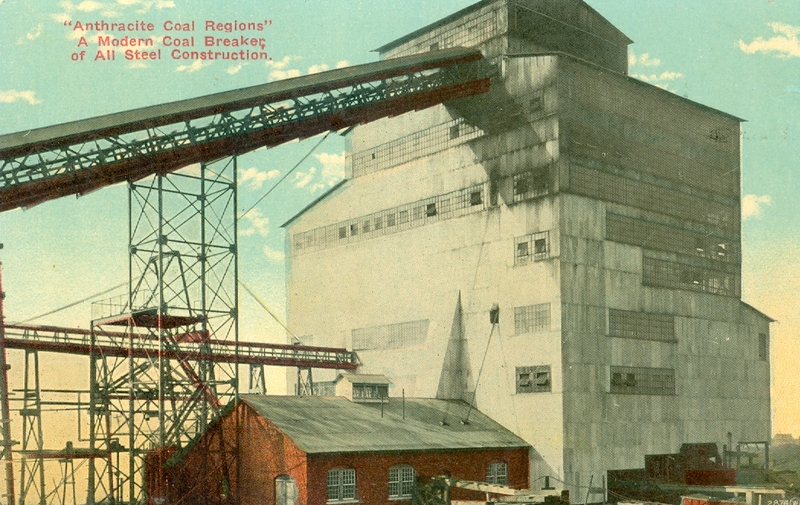 Coal companies expended considerable money developing alternative markets for these undersized coals that could be moved by augers and worm-driven feeds in power plant and furnace applications. 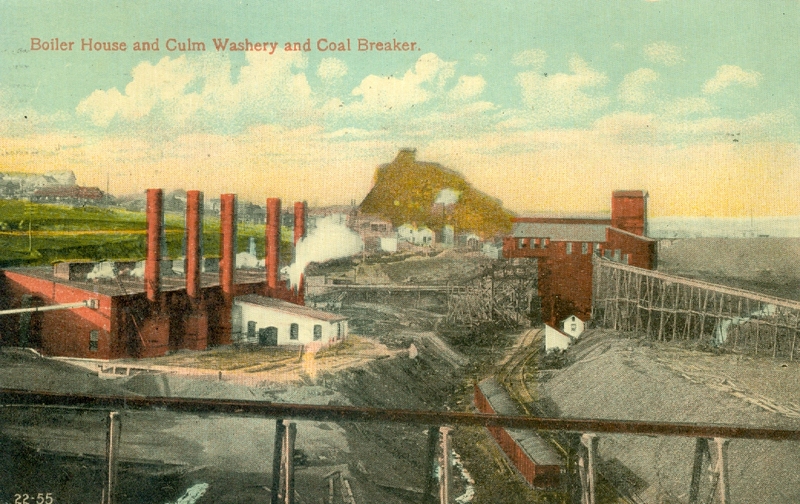 There remains considerable coal waste to this day in existing culm banks but most often is not economically feasible for recovery beyond an isolated test for possible electrical generation. 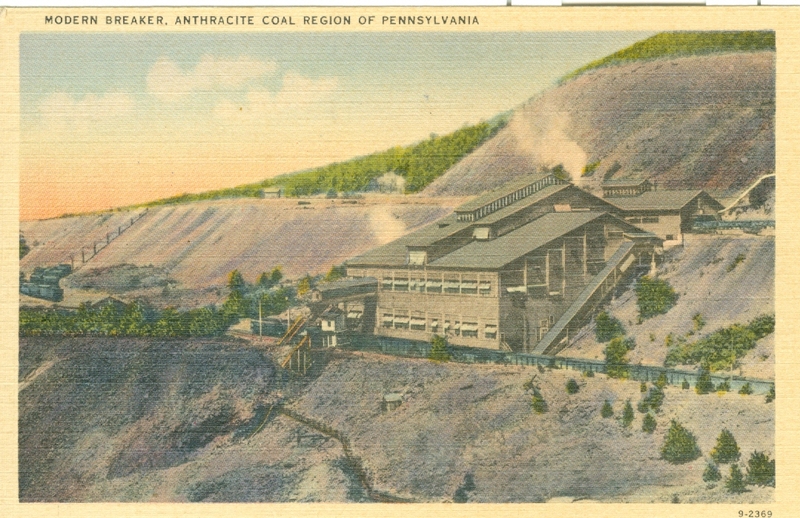 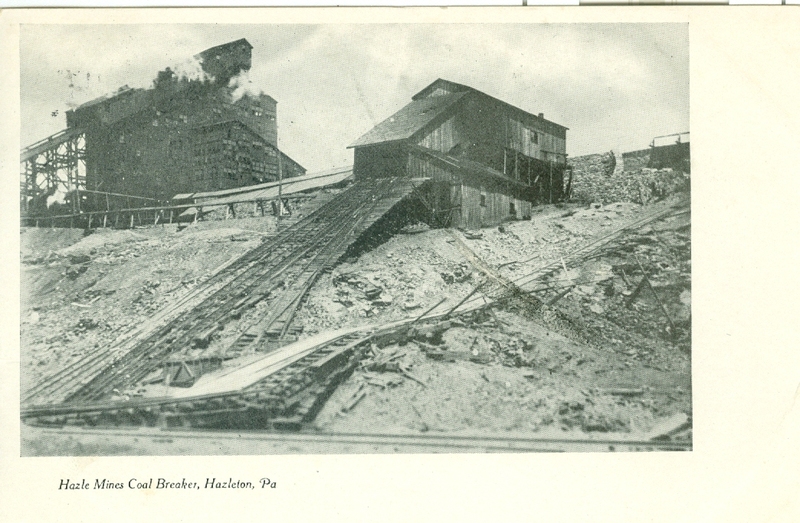 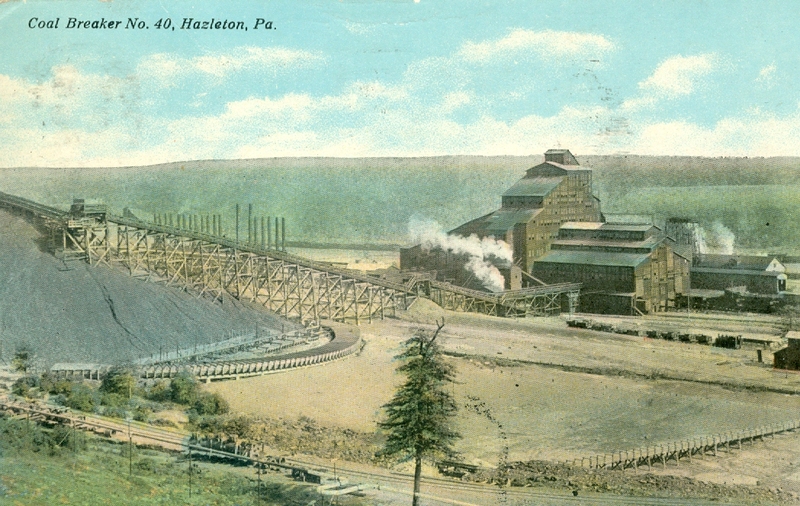 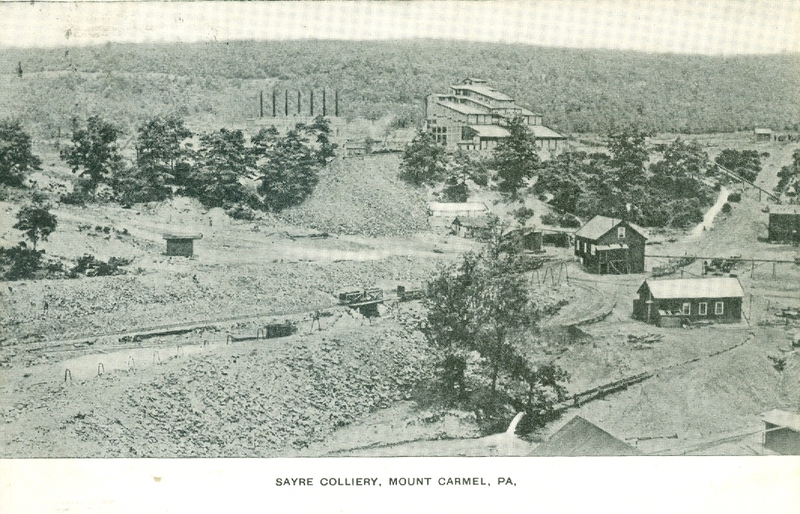 Certainly the heyday of the anthracite industry saw coal mining families try to salvage some of this coal waste for the heating of their own coal patch houses. 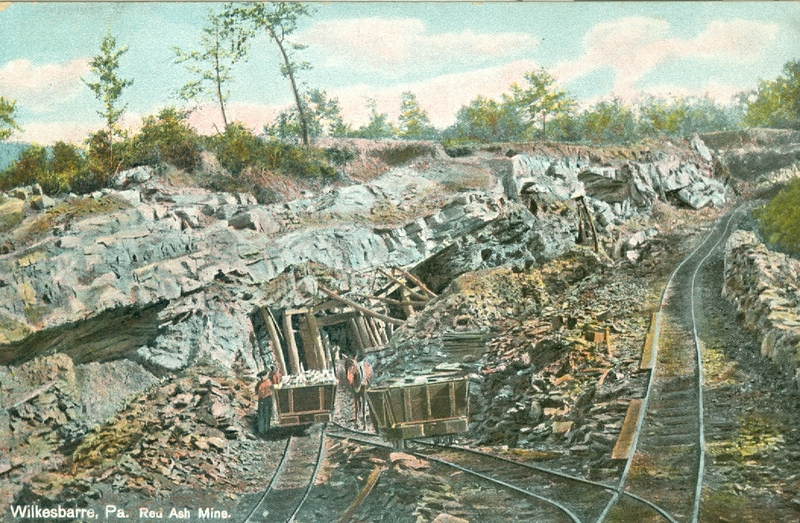 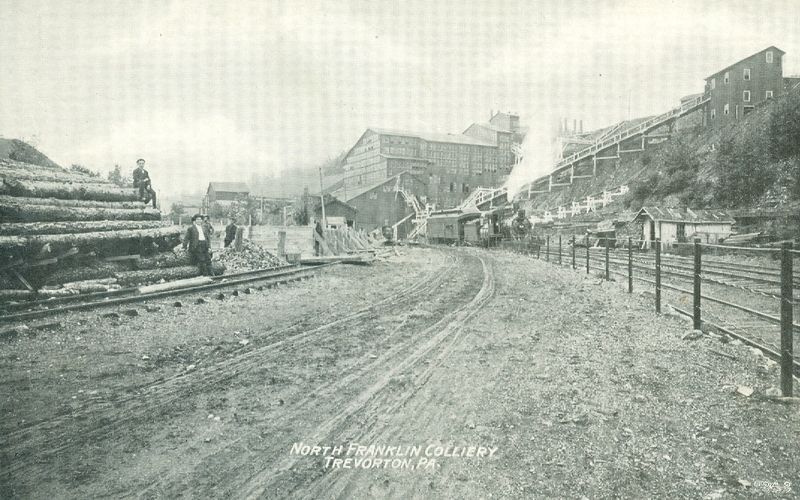 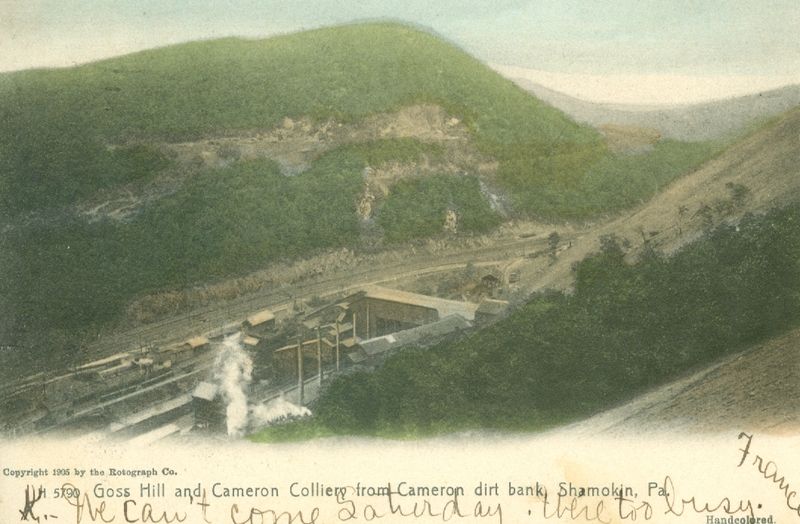 While the coal contained in the culm bank was the property of the coal mining company and taking it was viewed as theft, it was difficult to prohibit or enforce staying off the culm banks and it often became a common sight to see wives and children of miners scavenging for small but useable pieces of anthracite. 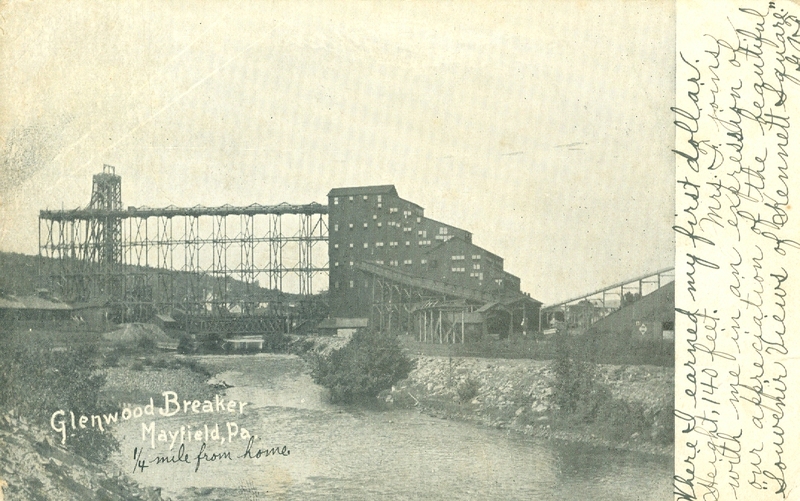 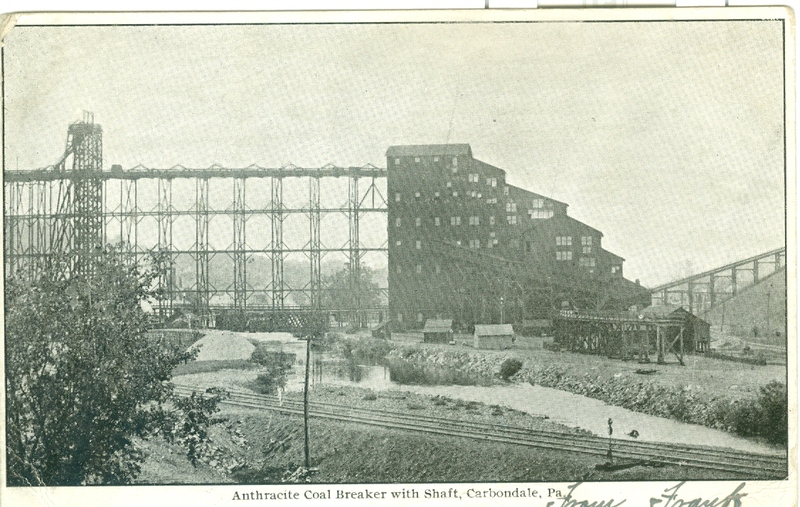 Today the anthracite industry is basically gone from the landscape and few remnants of the many breakers still survive. 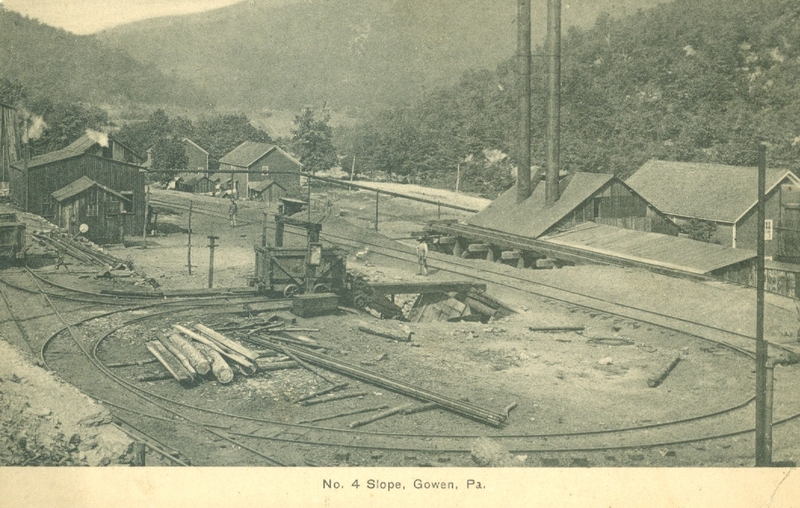 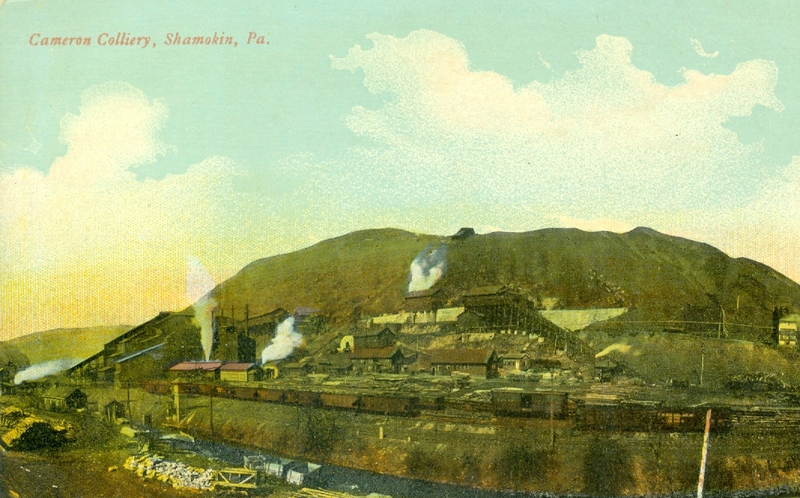 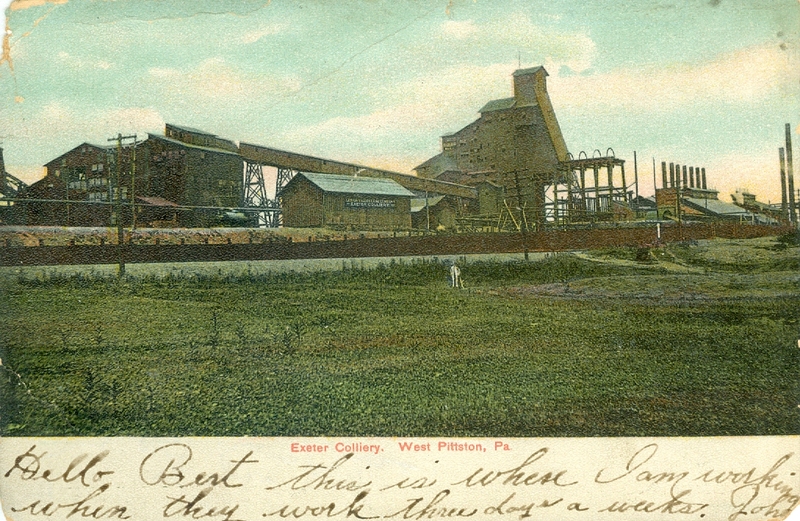 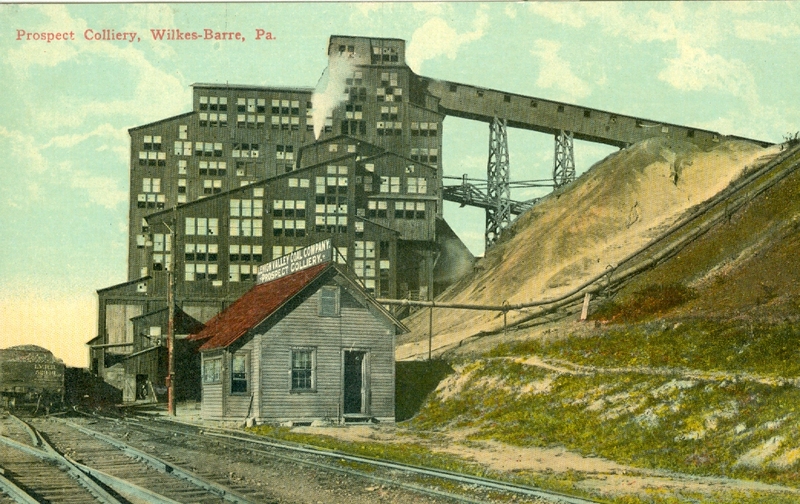 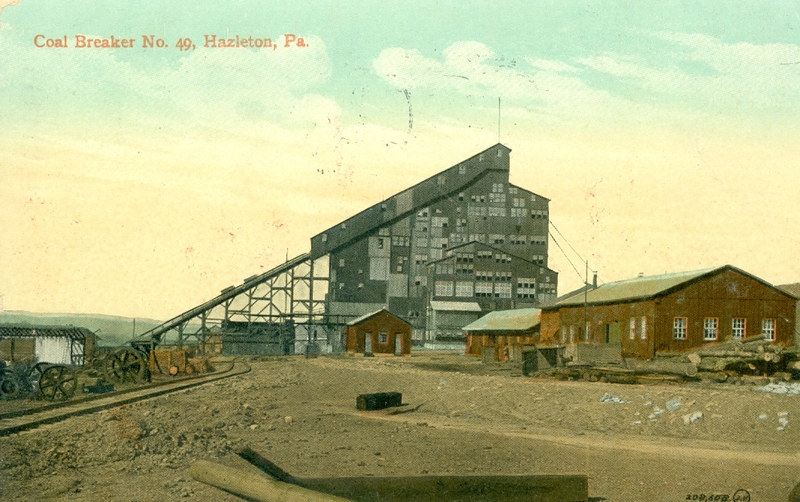 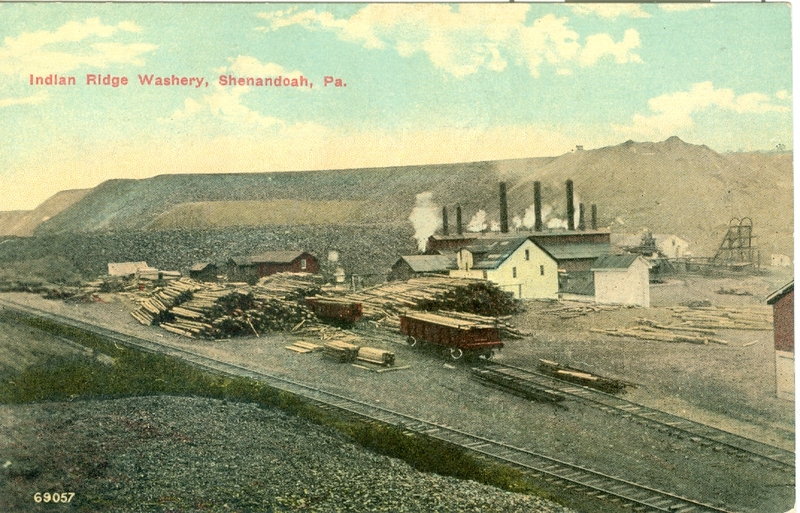 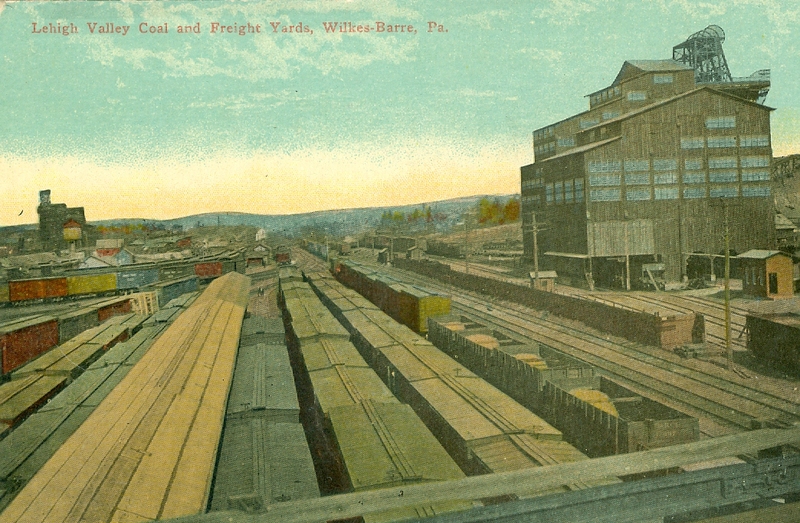 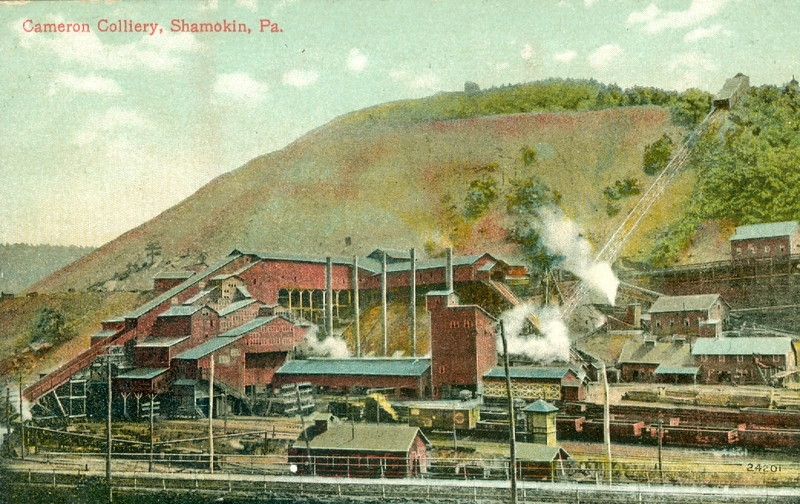 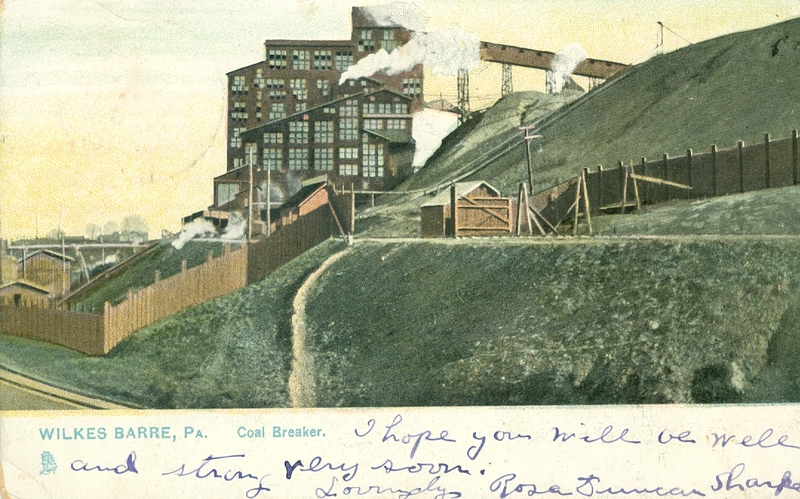 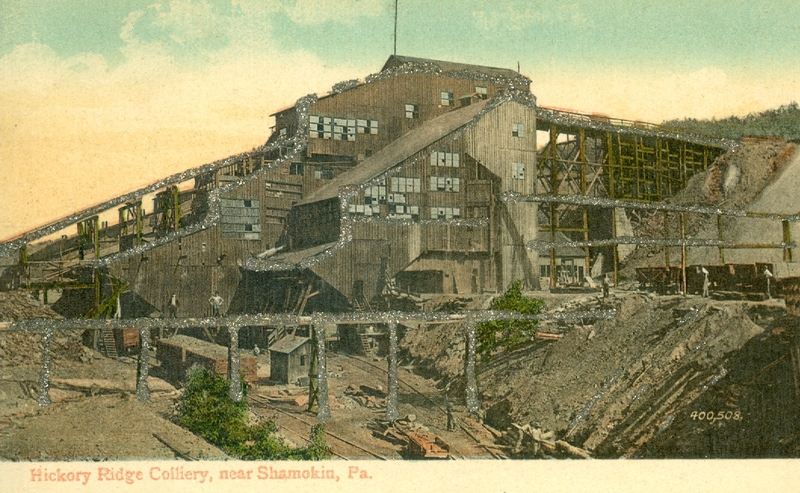 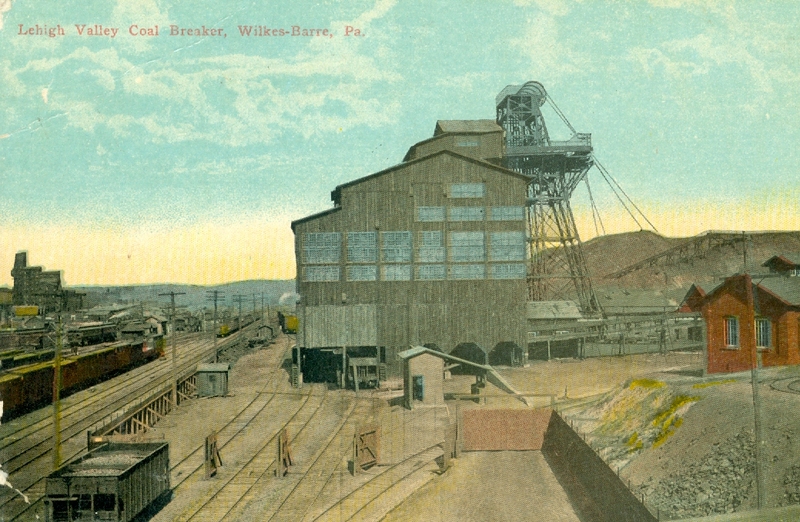 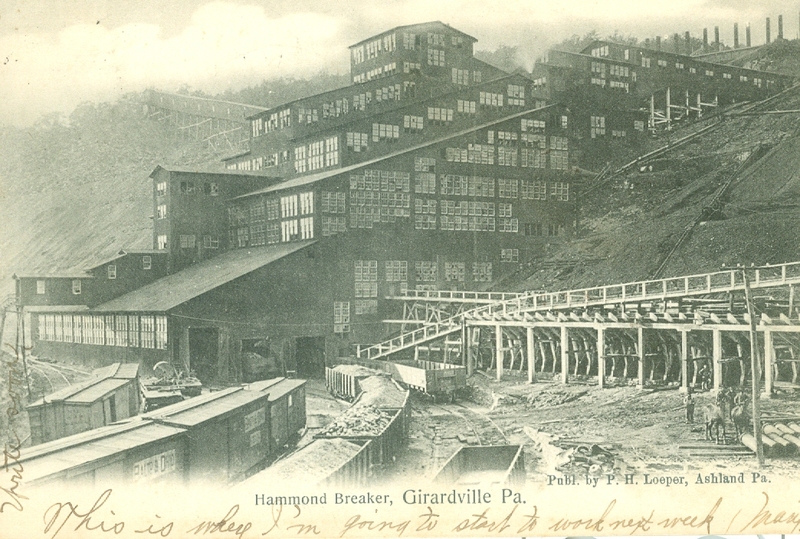 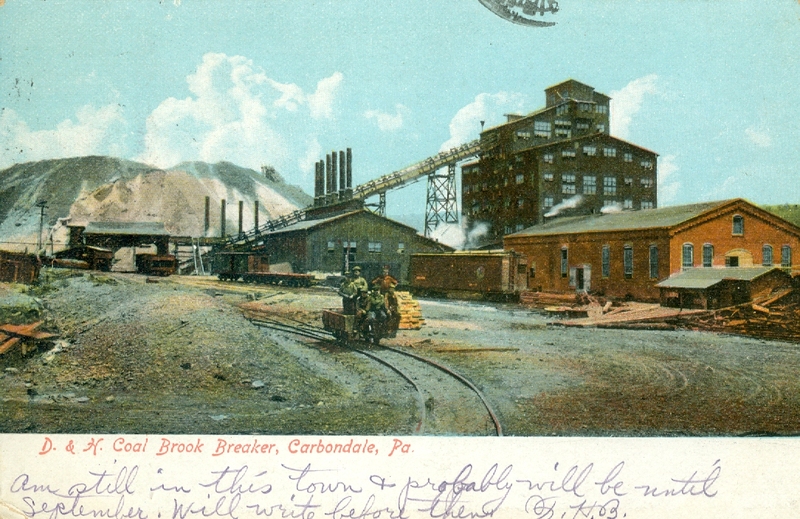 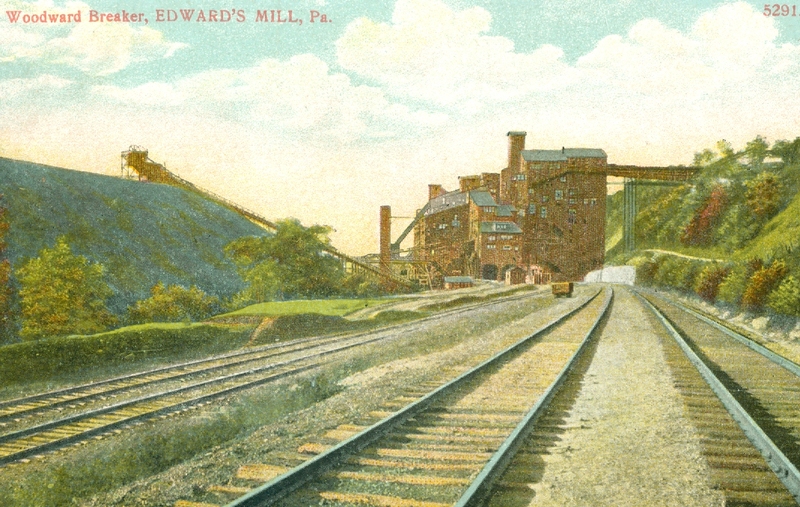 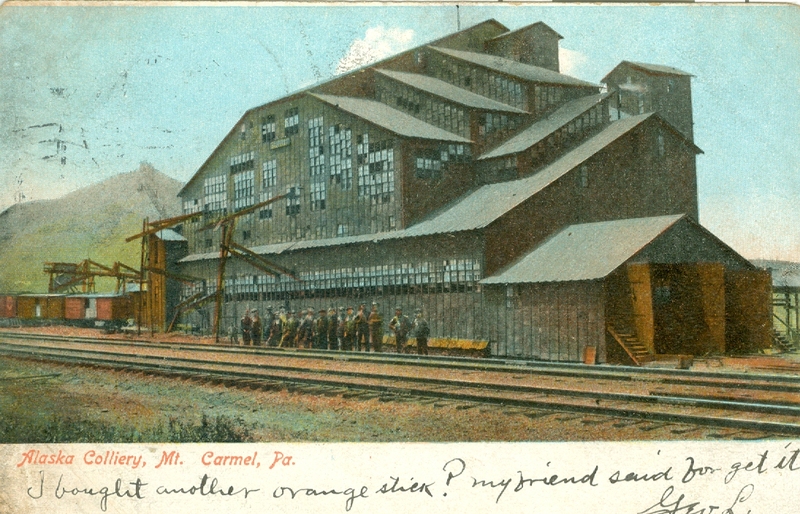 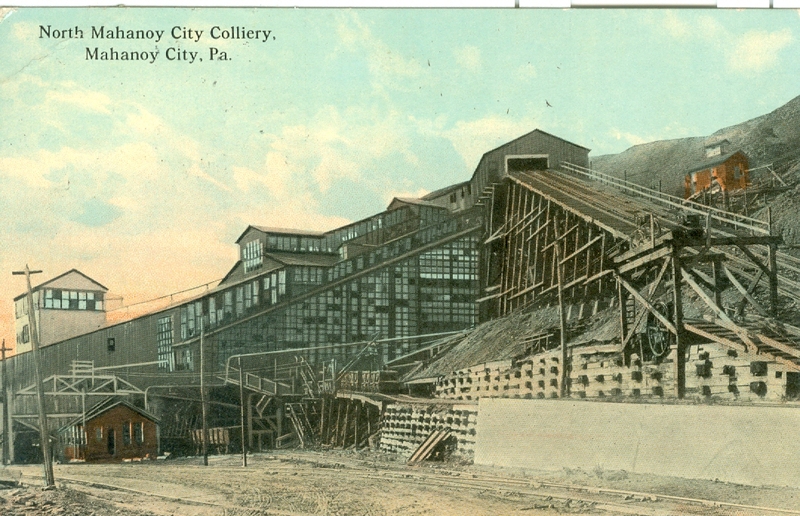 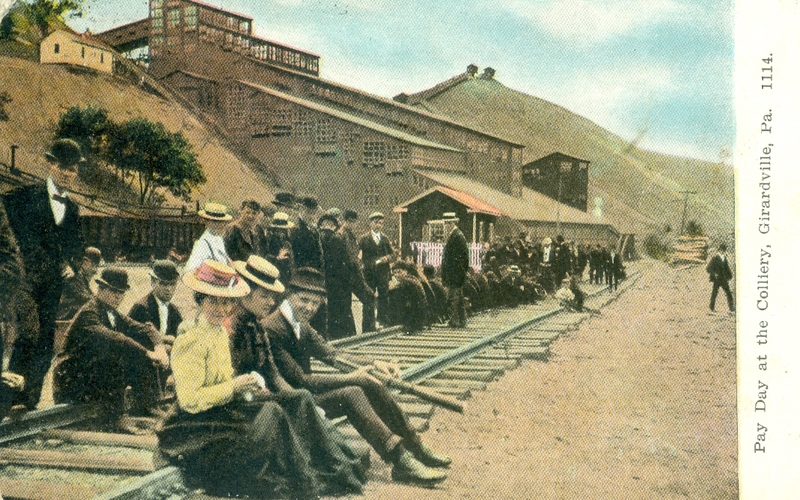 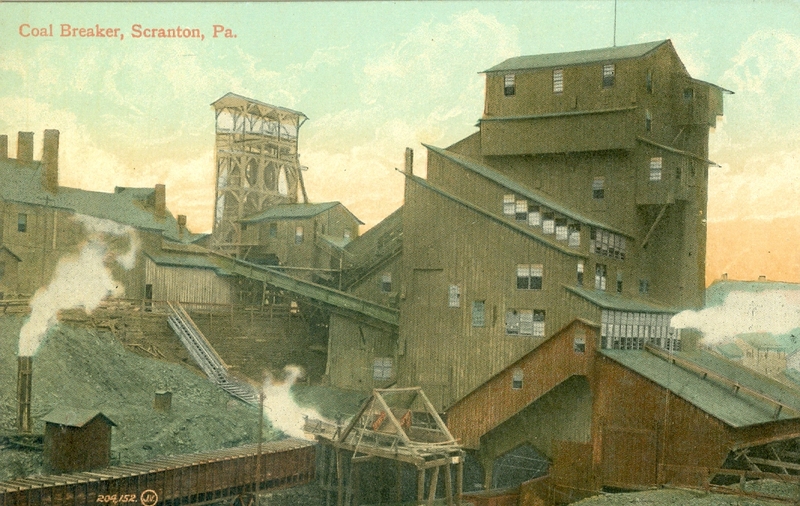 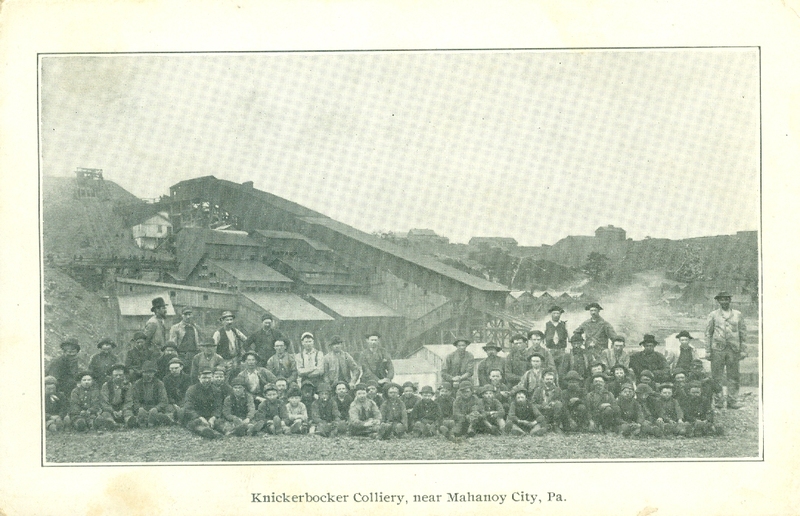 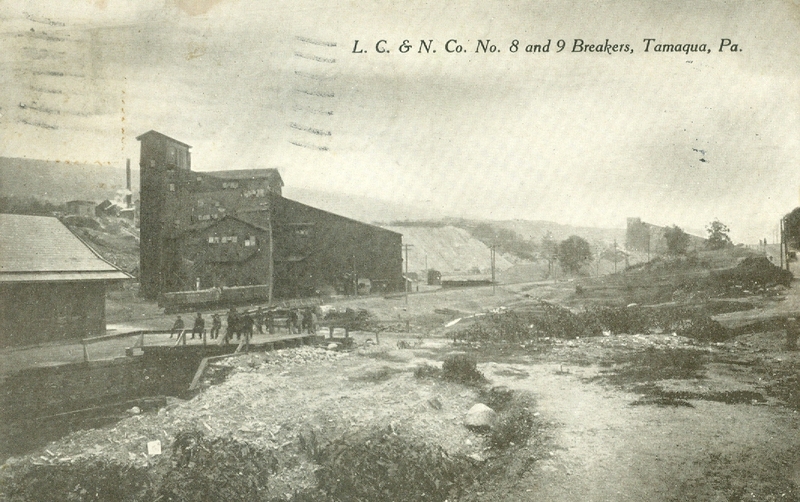 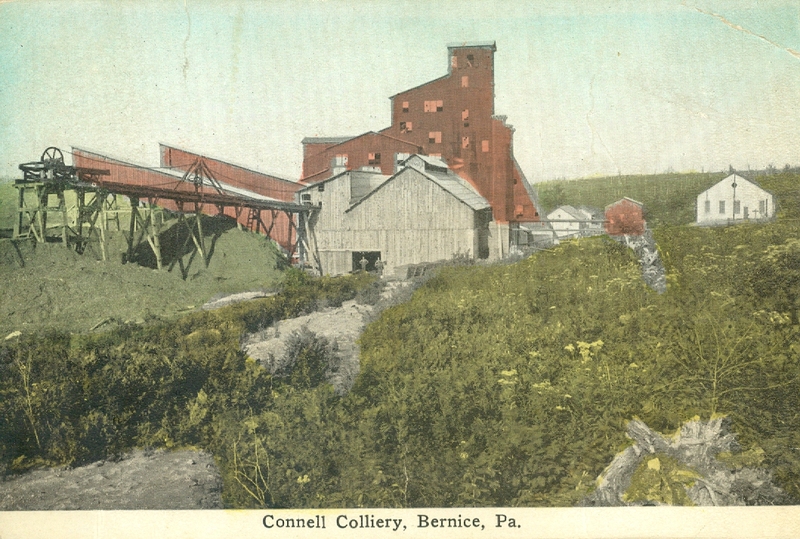 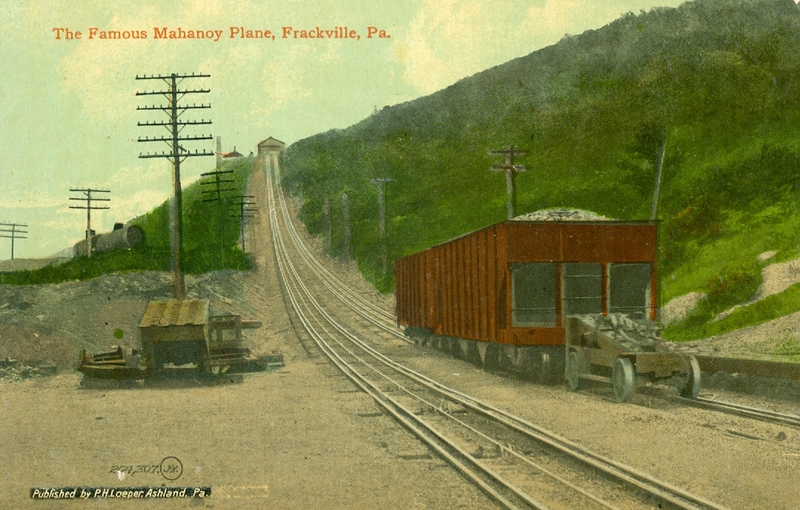 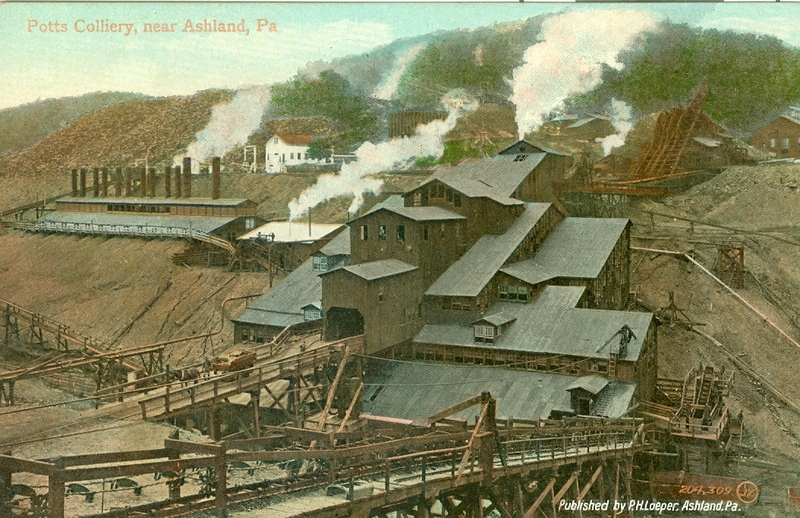 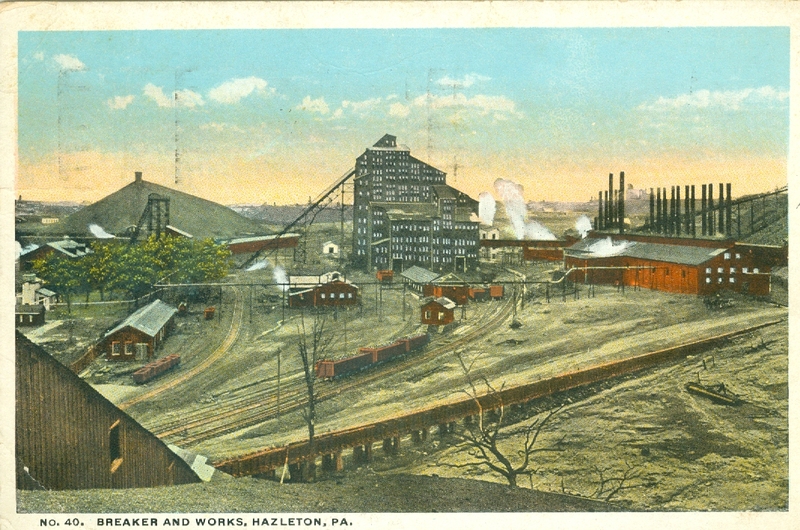 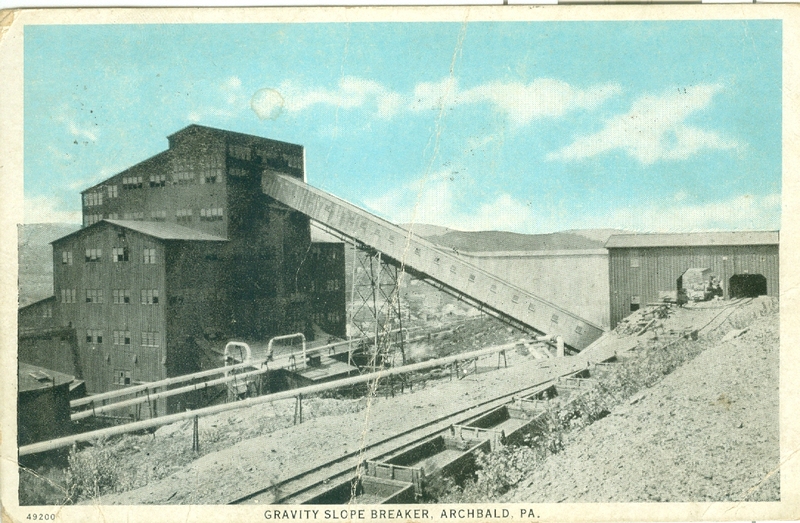 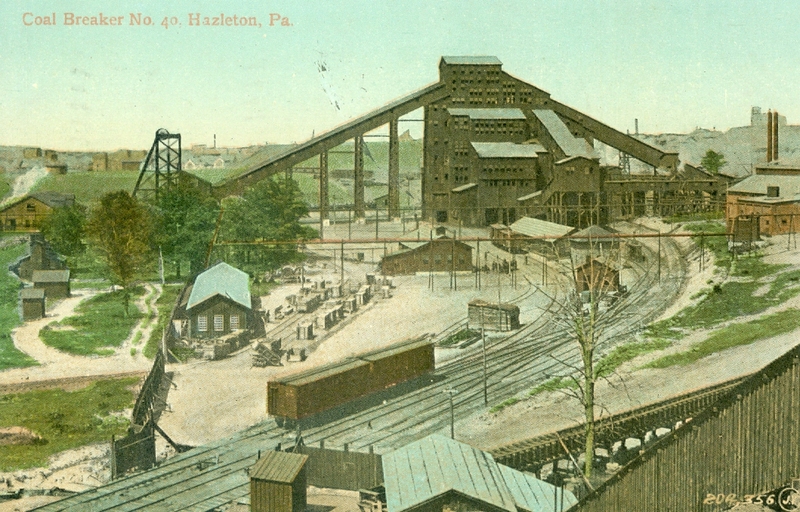 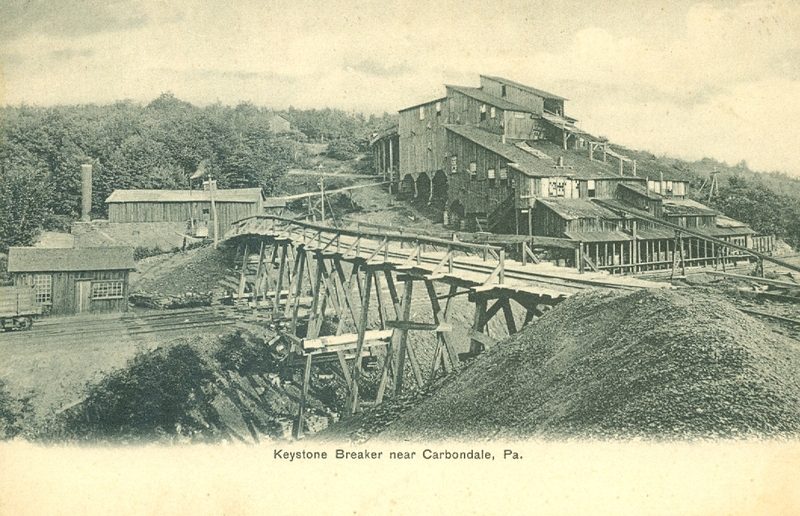 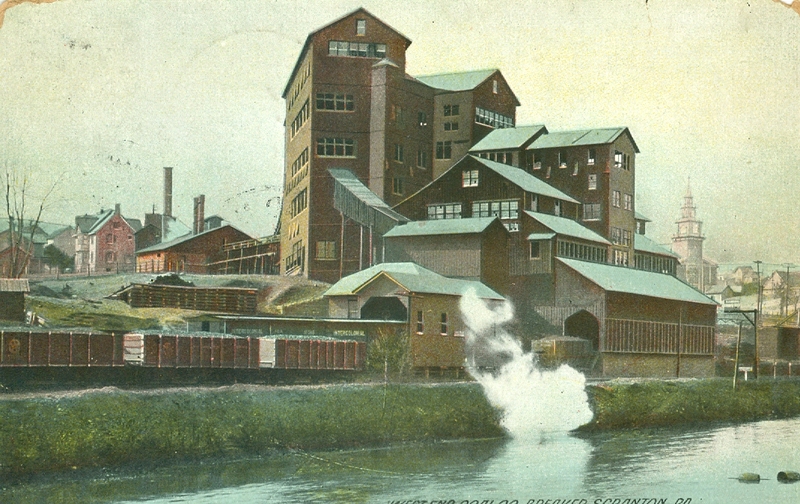 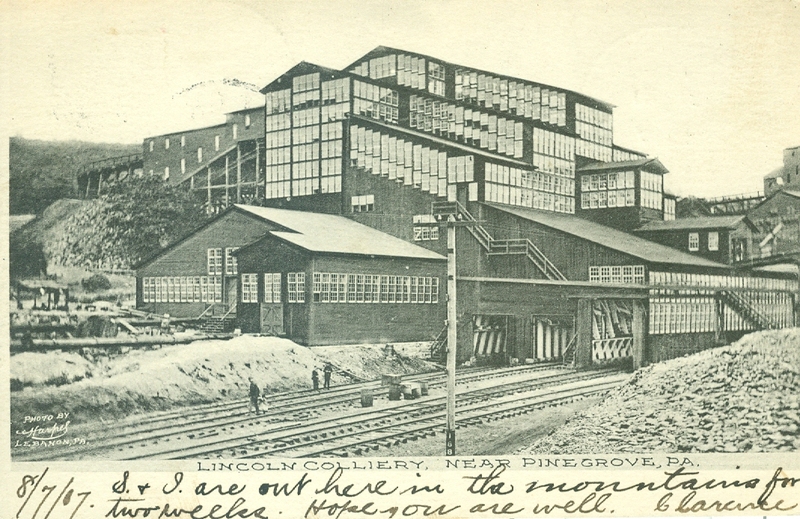 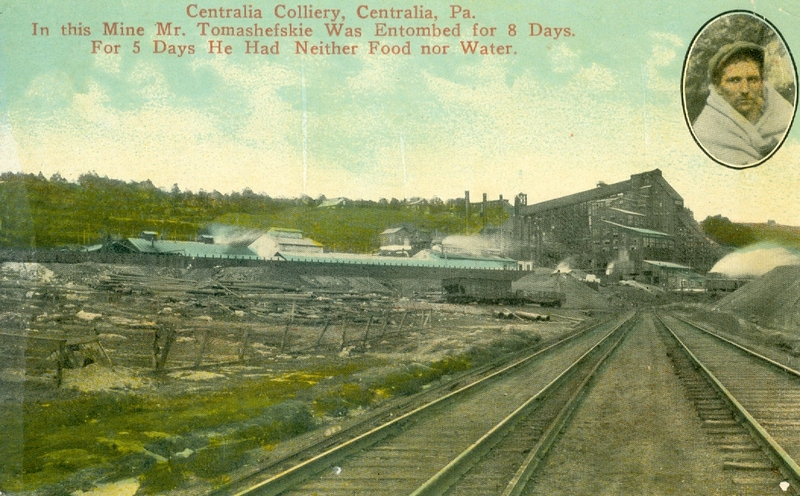 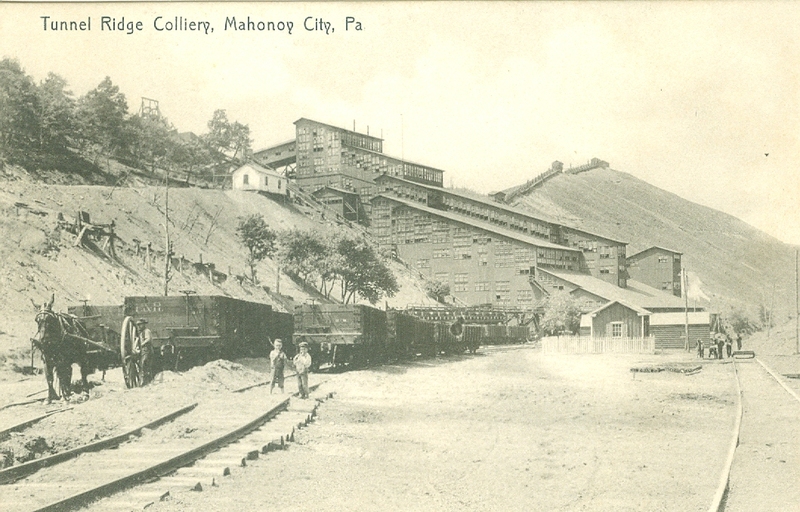 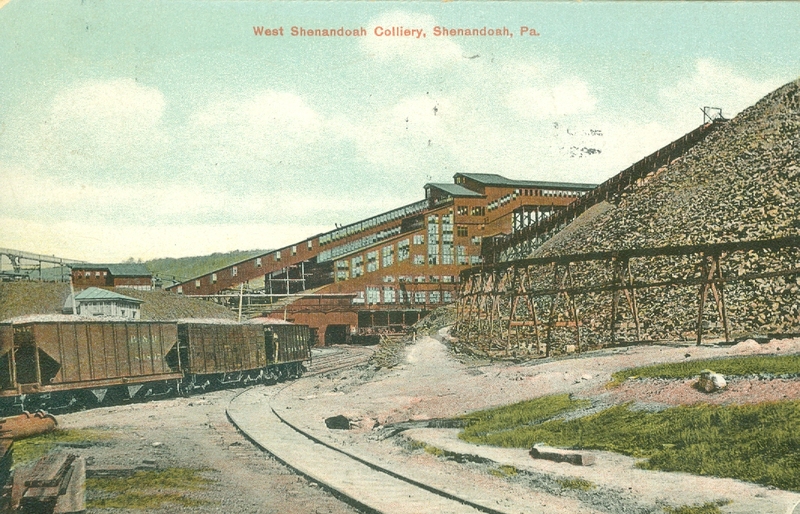 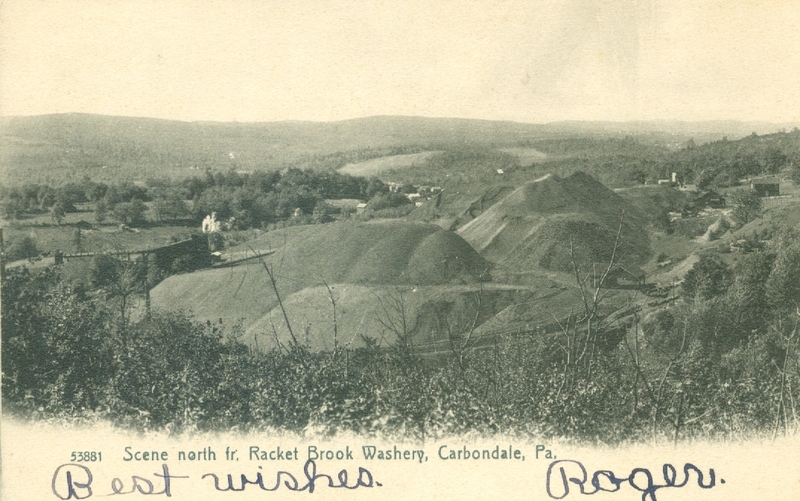 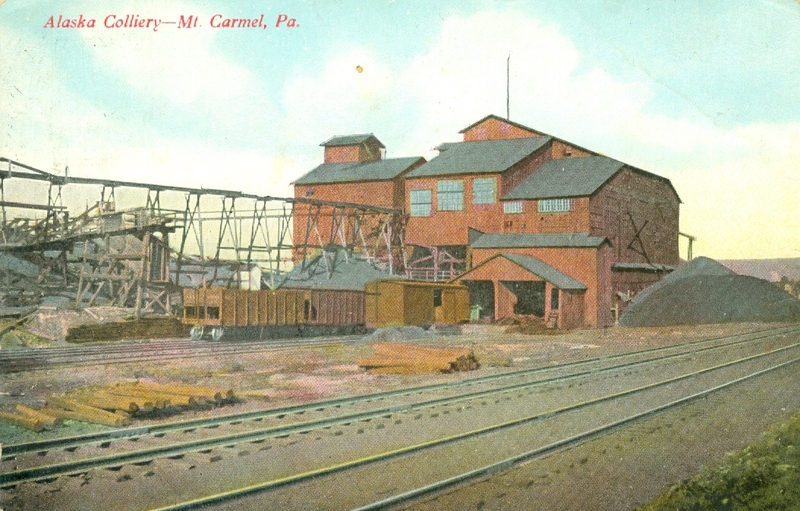 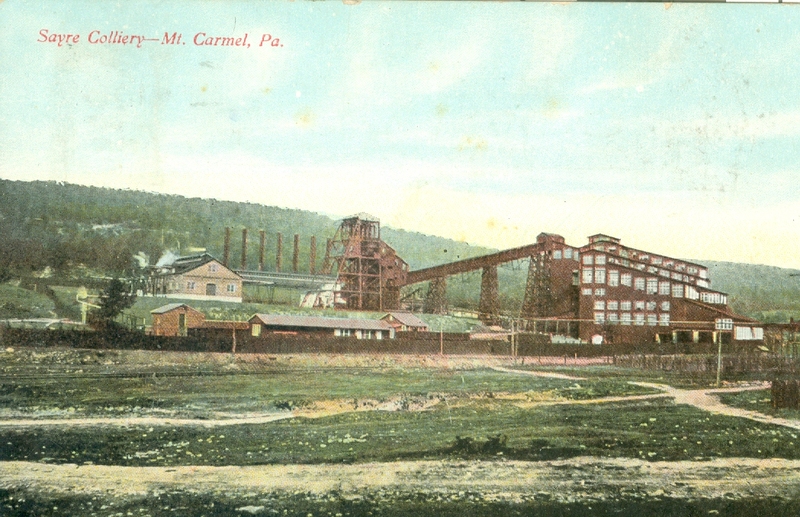 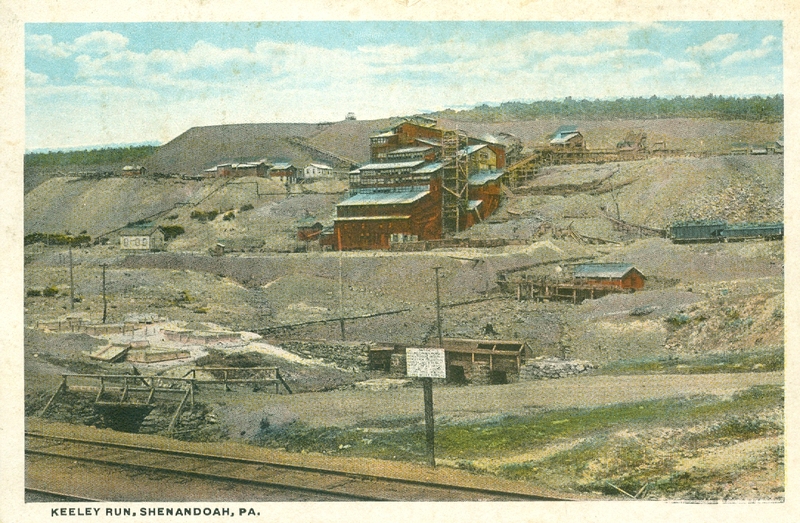 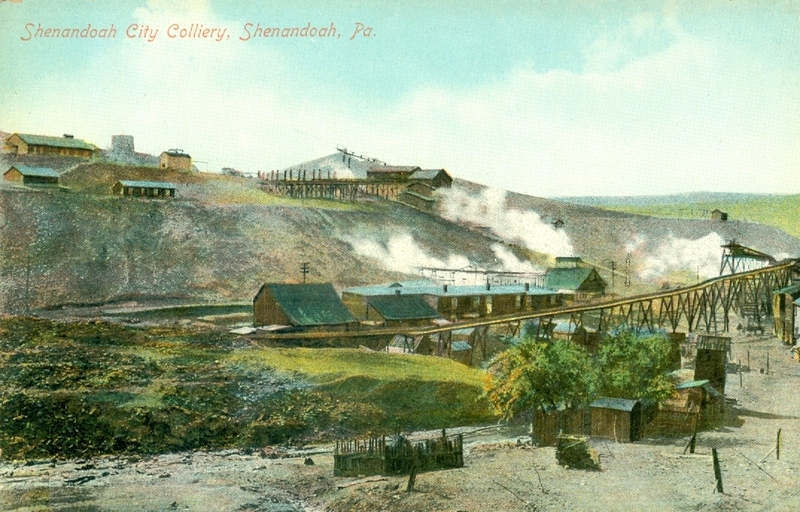 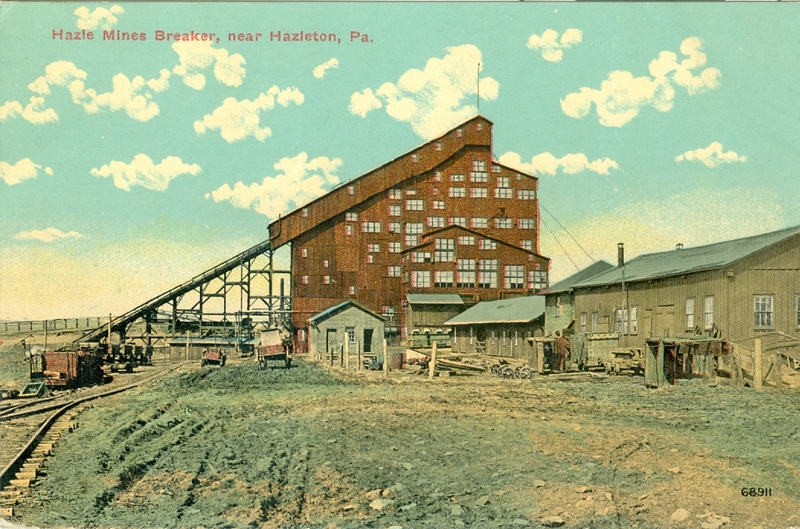 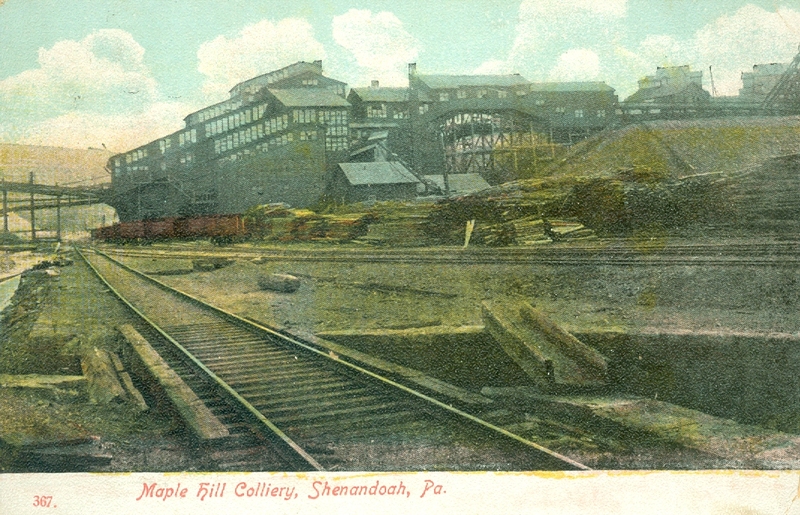 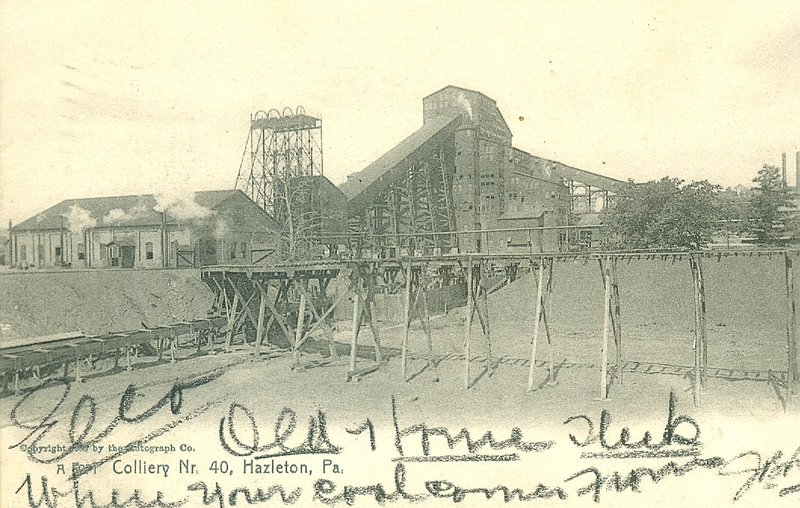 In the early 1900’s they were so common and so much a part of the daily life of the anthracite region that they frequently become subjects for local postcard vendors documenting the daily life of their towns. 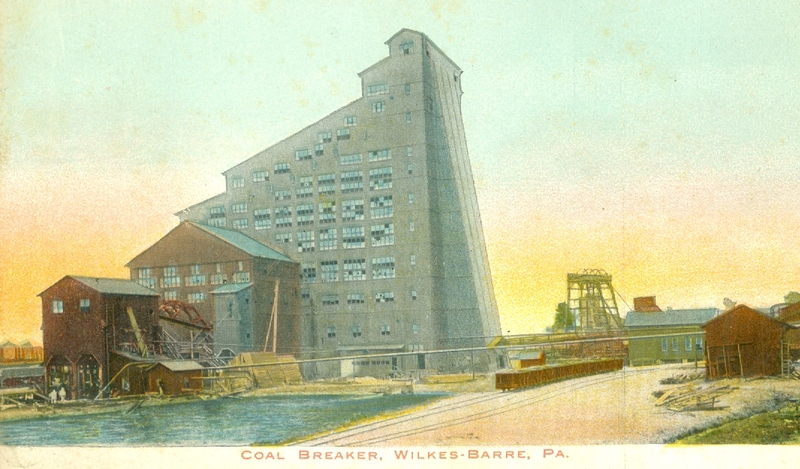 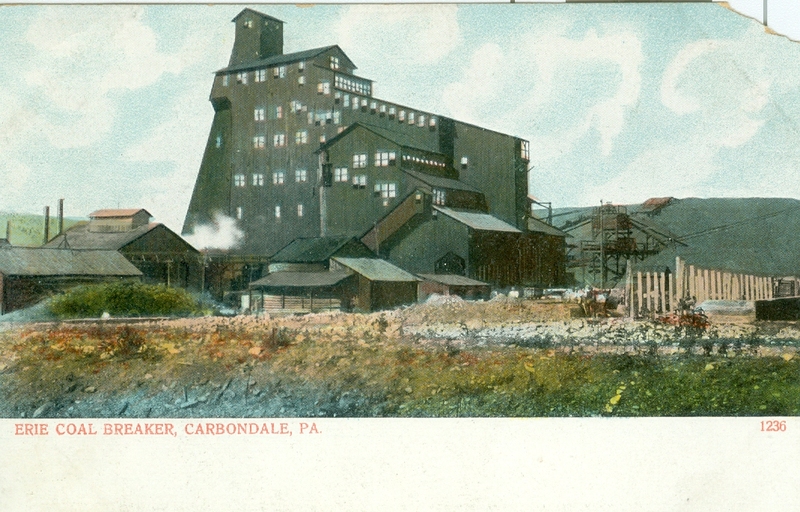 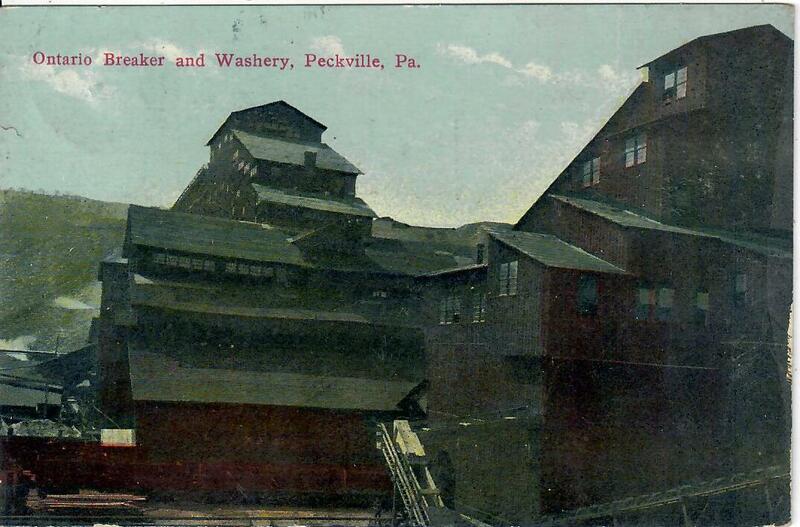 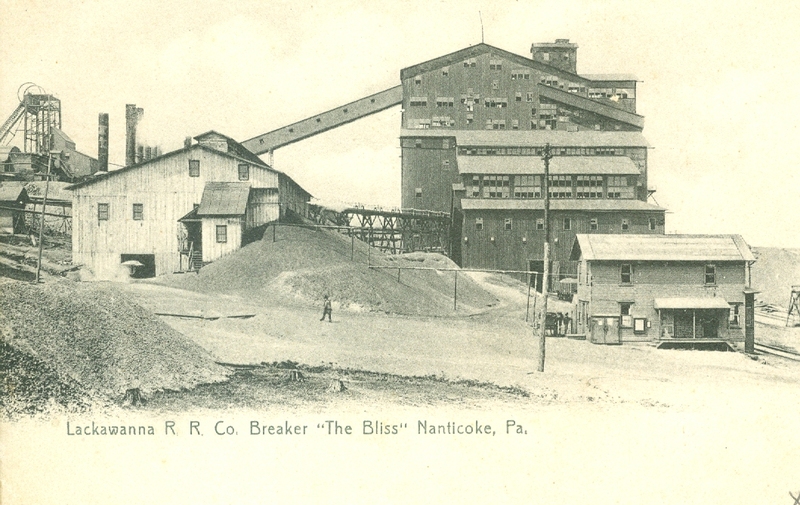 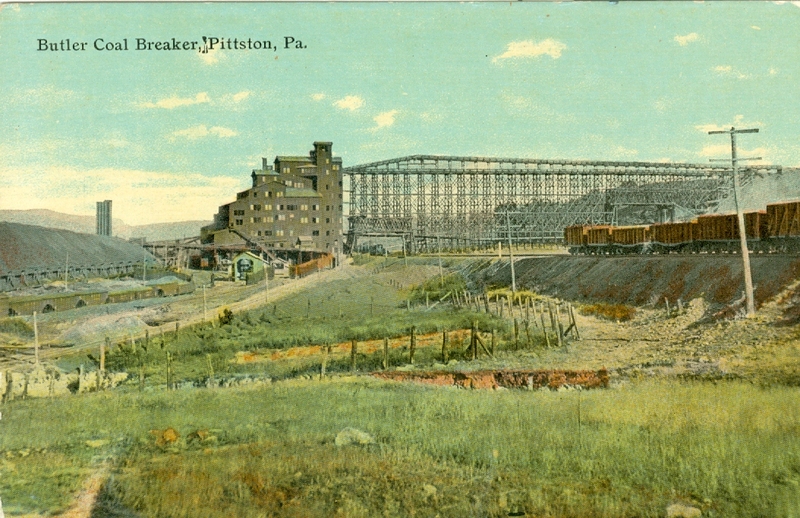 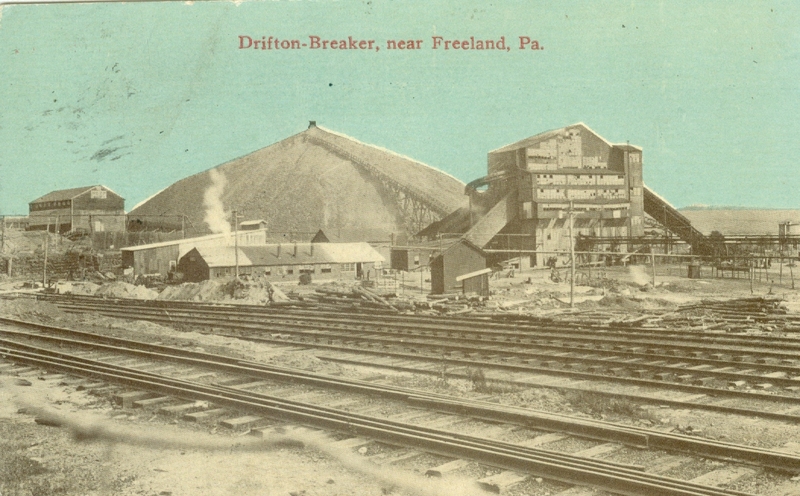 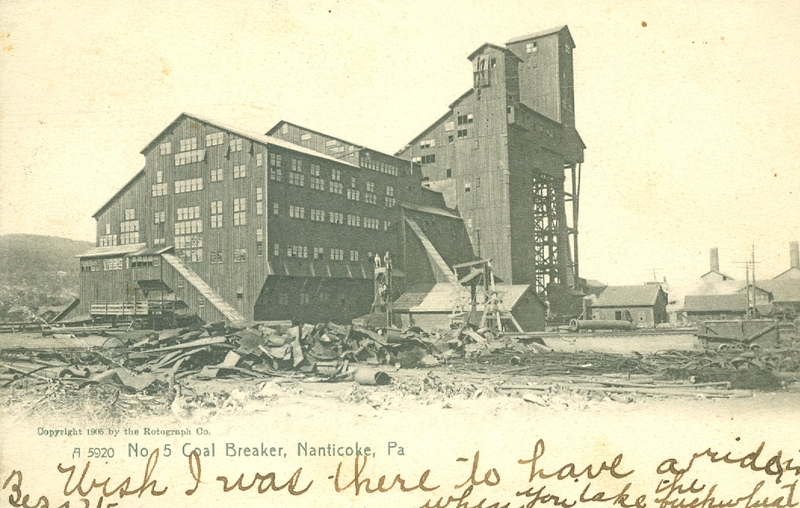 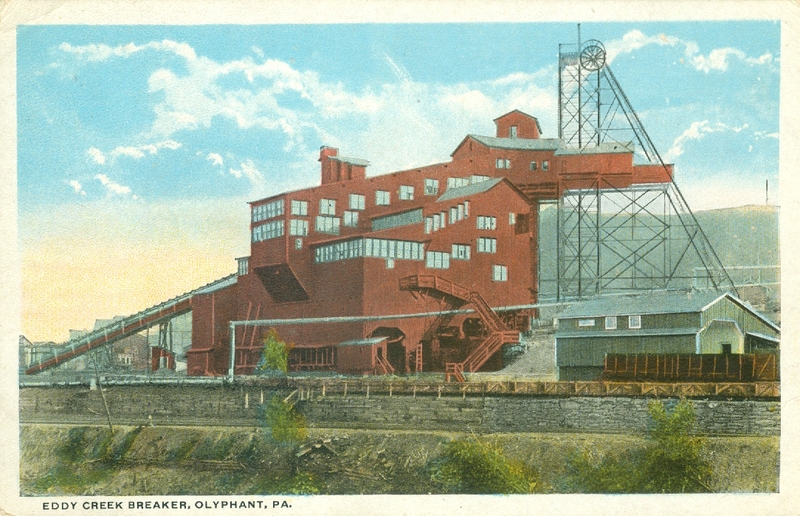 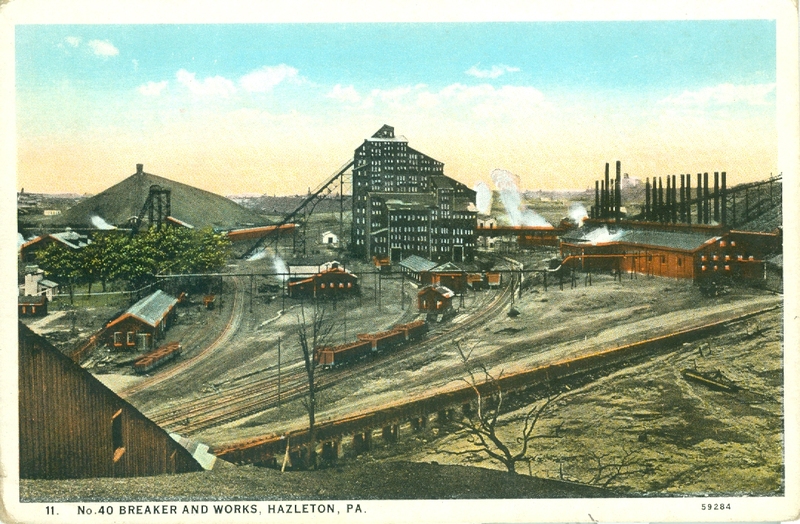 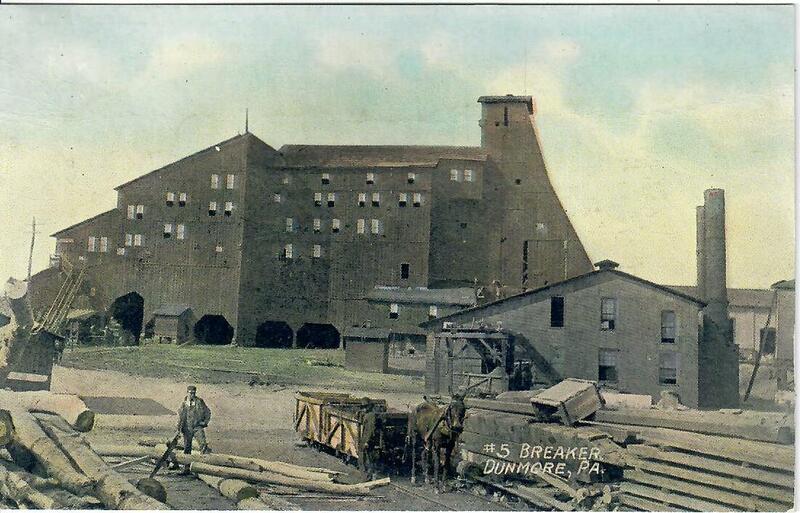 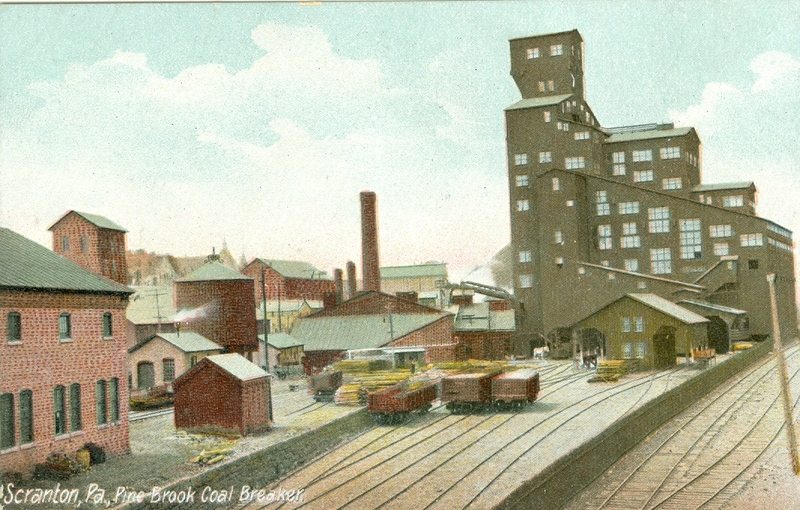 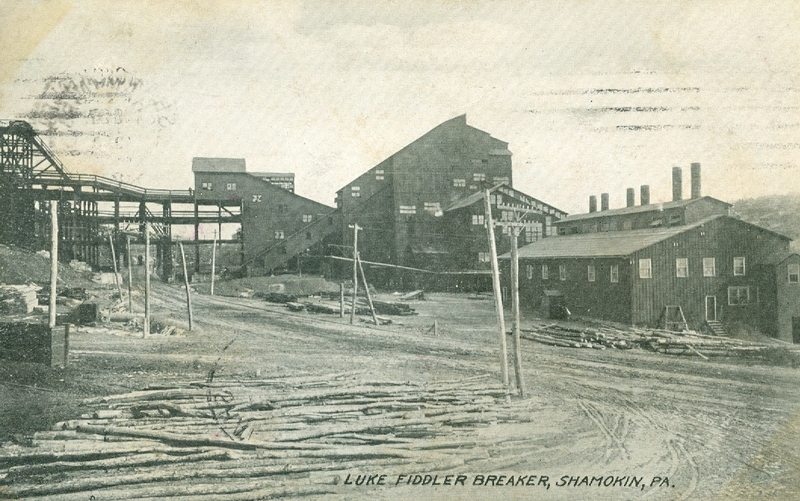 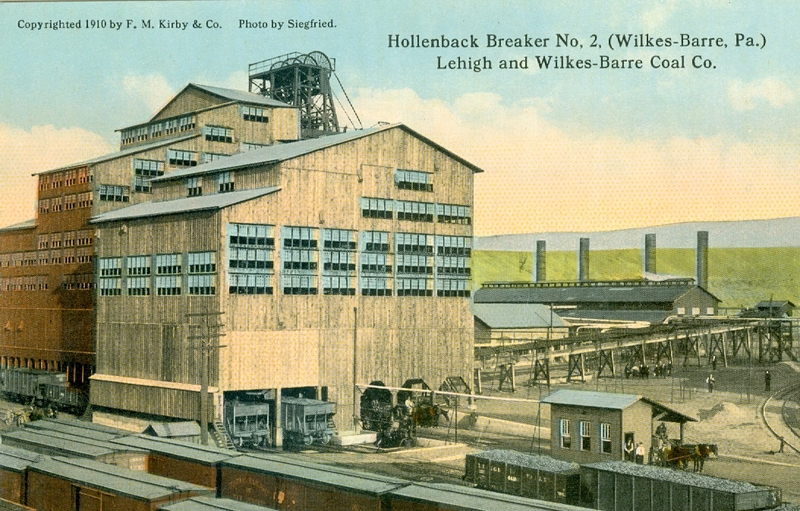 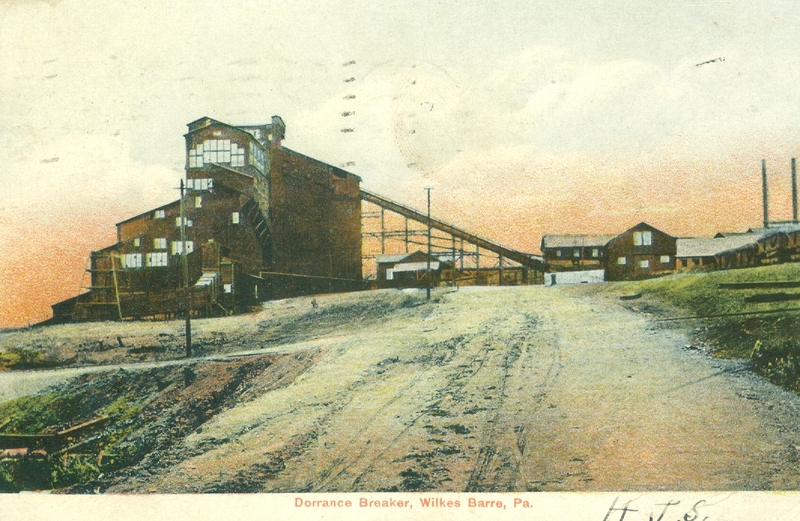 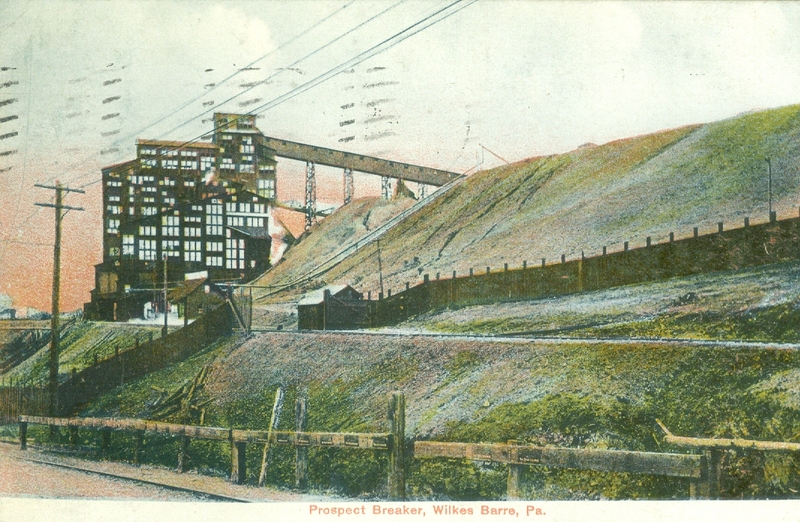 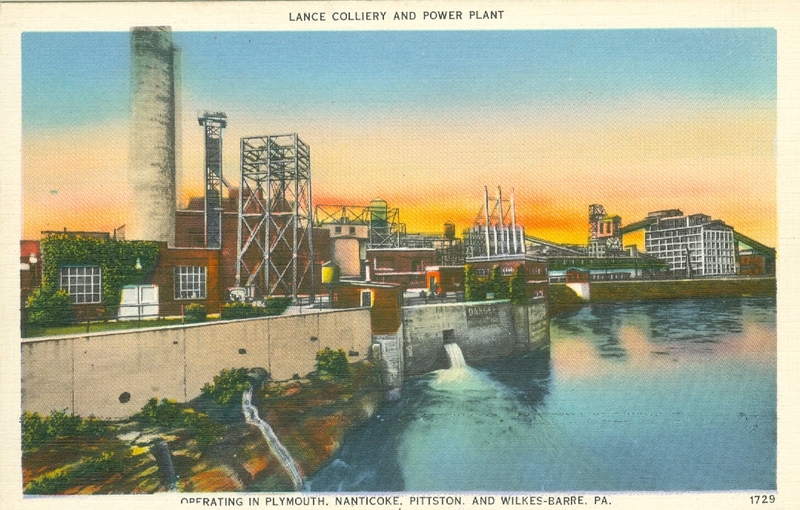 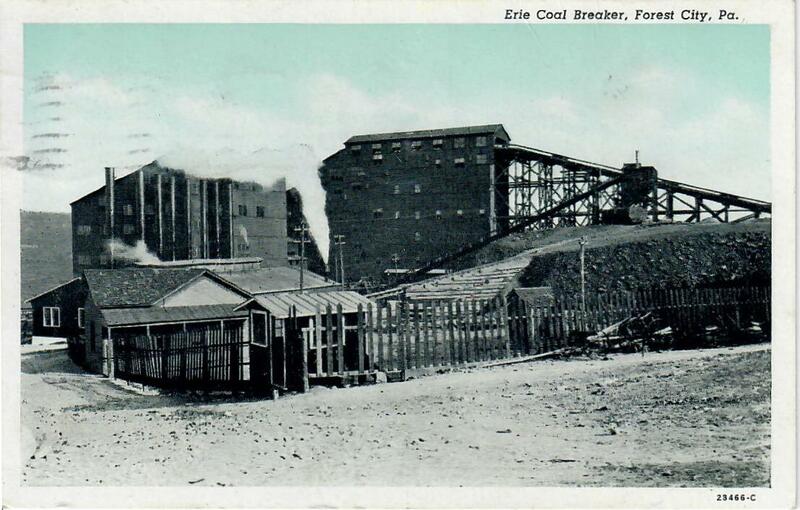 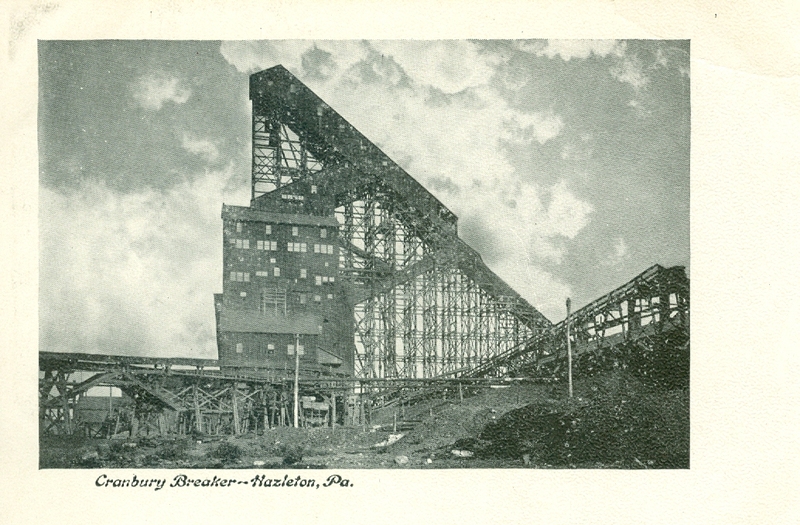 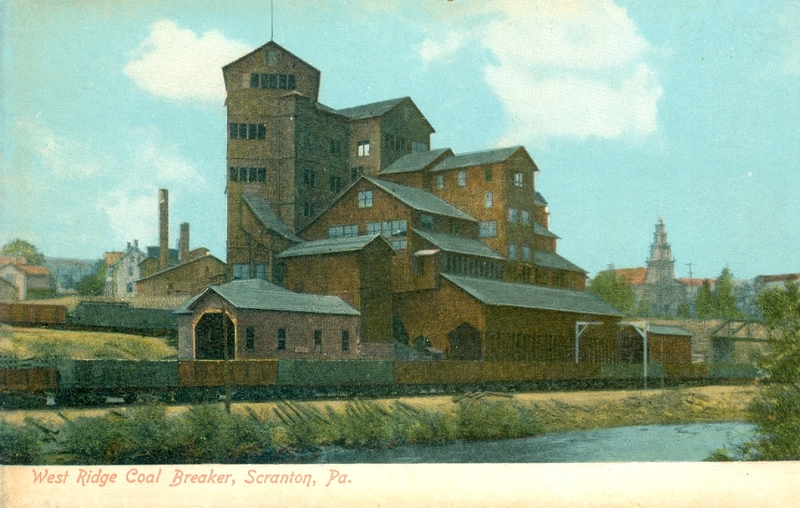 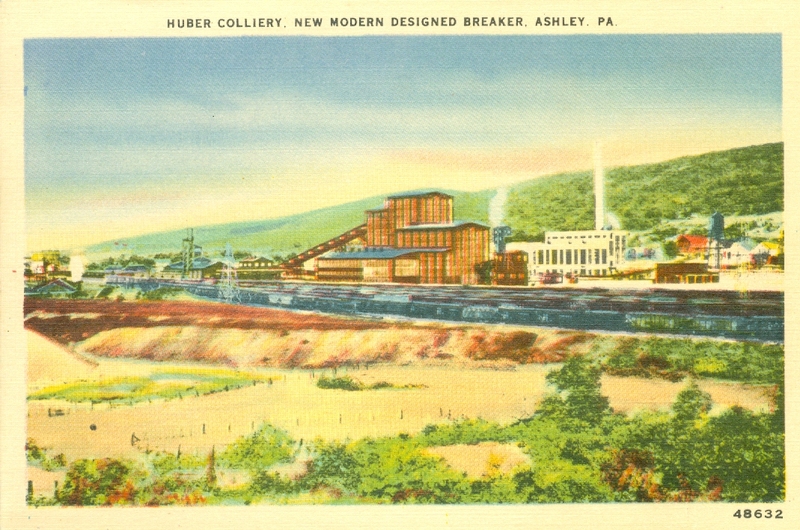 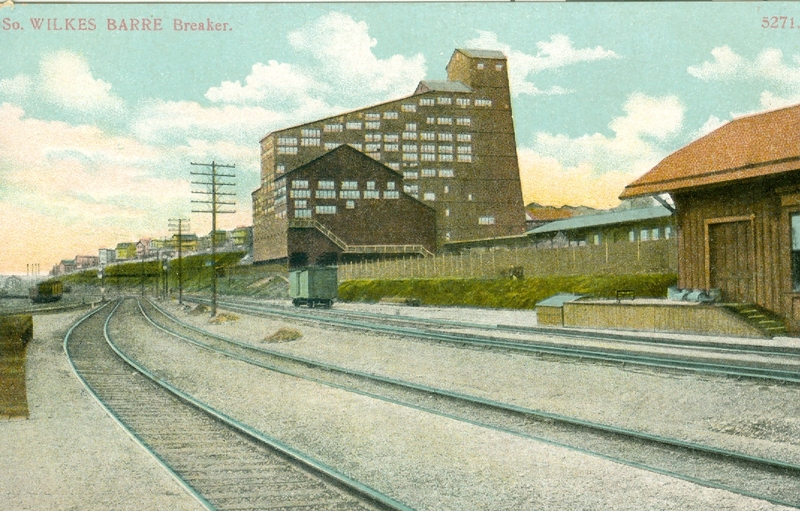 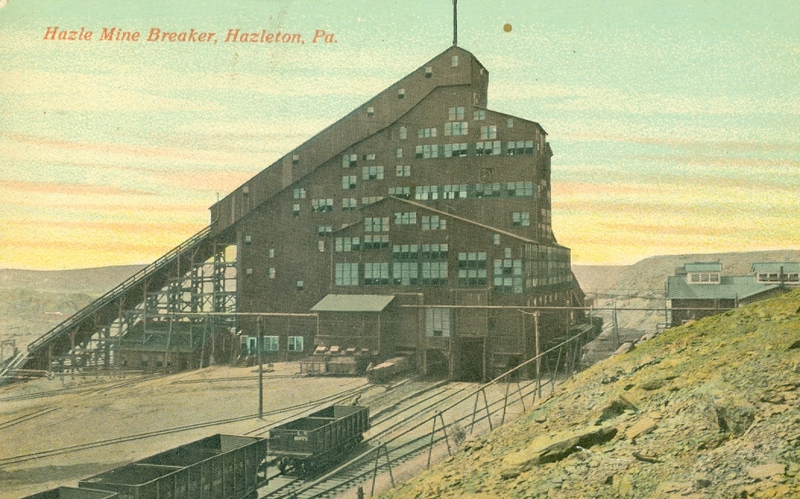 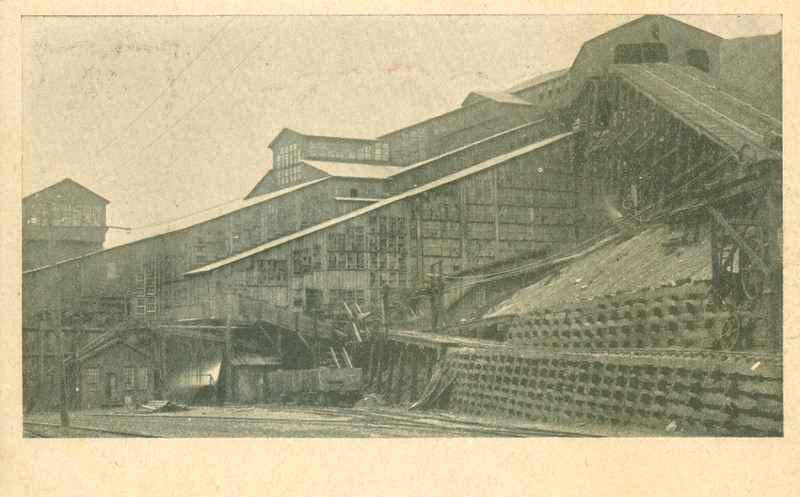 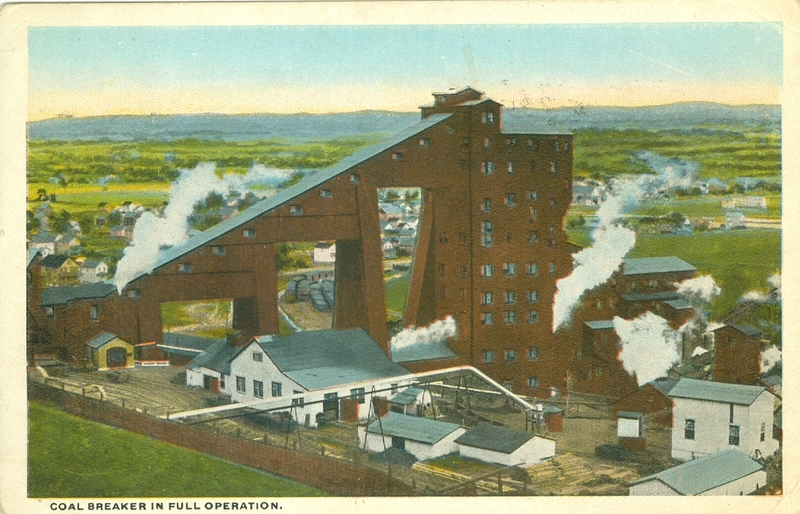 What follows is a gallery of postcard views of breakers arranged by counties from my own collection. 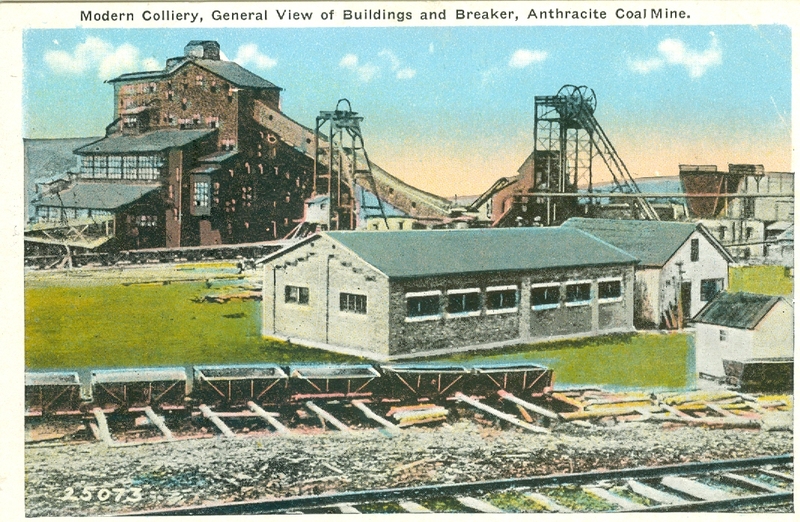 Following is a partial list of anthracite coal breakers and collieries by name, county and location. 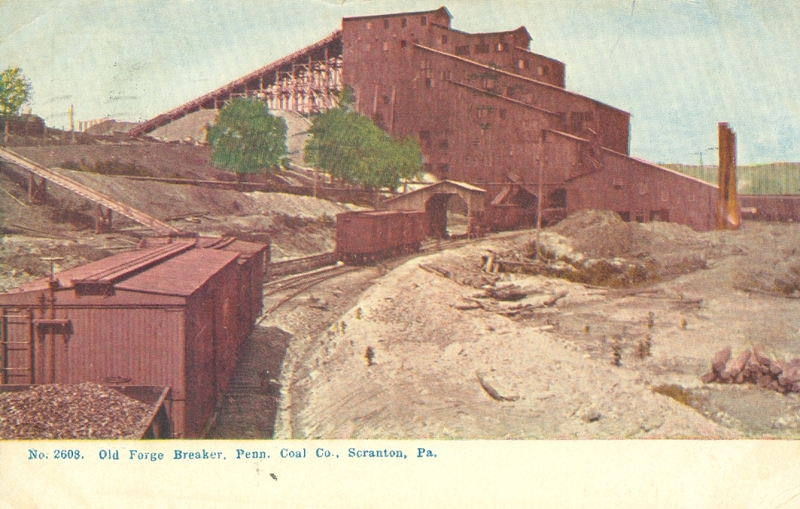 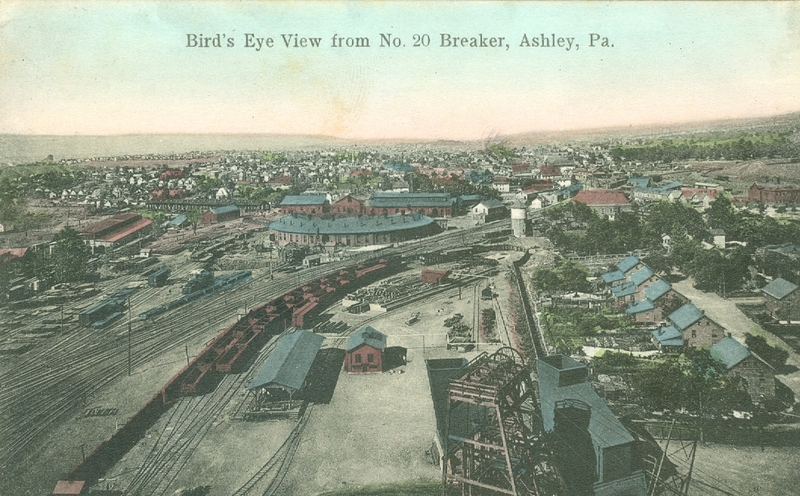 It will probably never be known as to exactly how many breakers and collieries existed in the coal fields throughout the entire history of the industry. 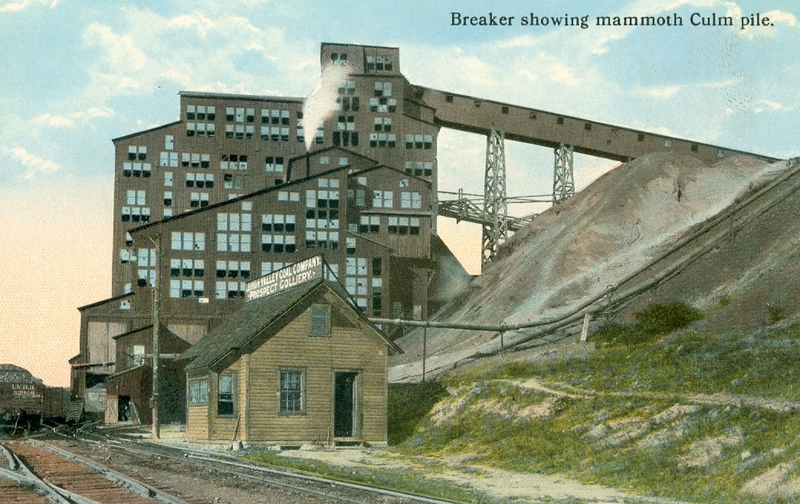 My list is far from complete but is a simple start. 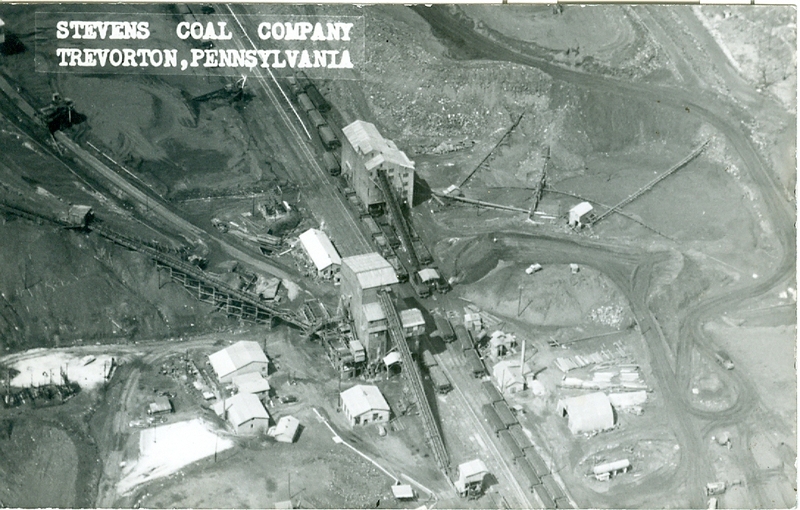 Perhaps in time the list can be expanded to include names of operators and dates of operation. 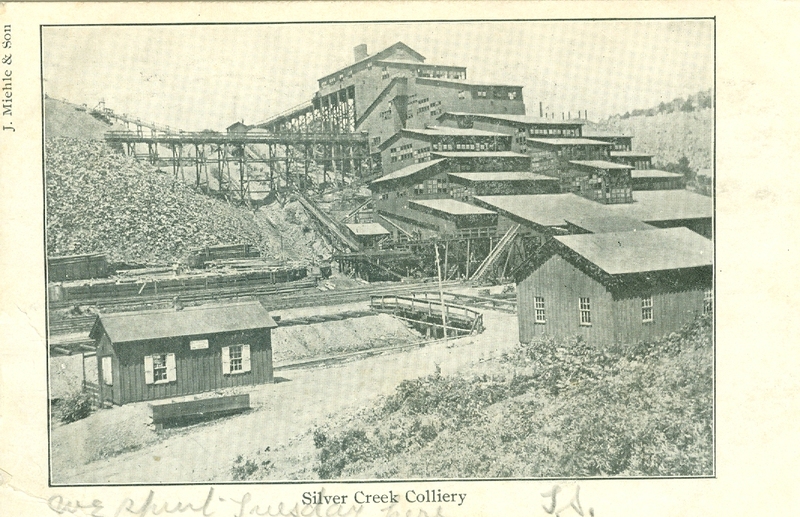 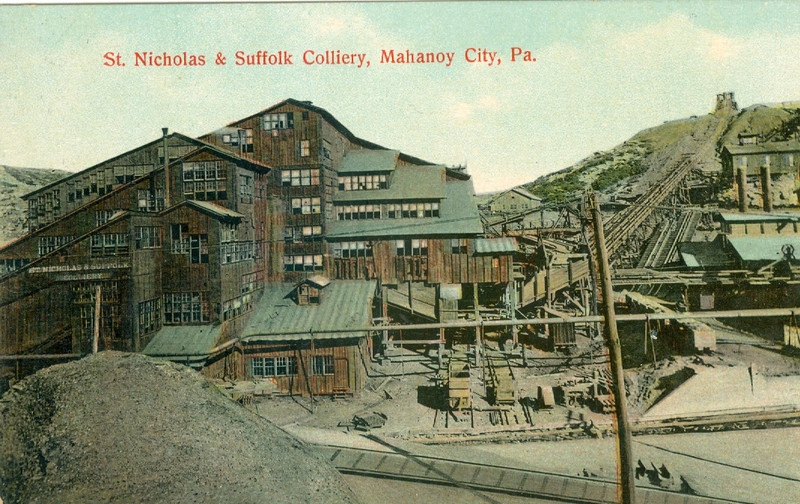 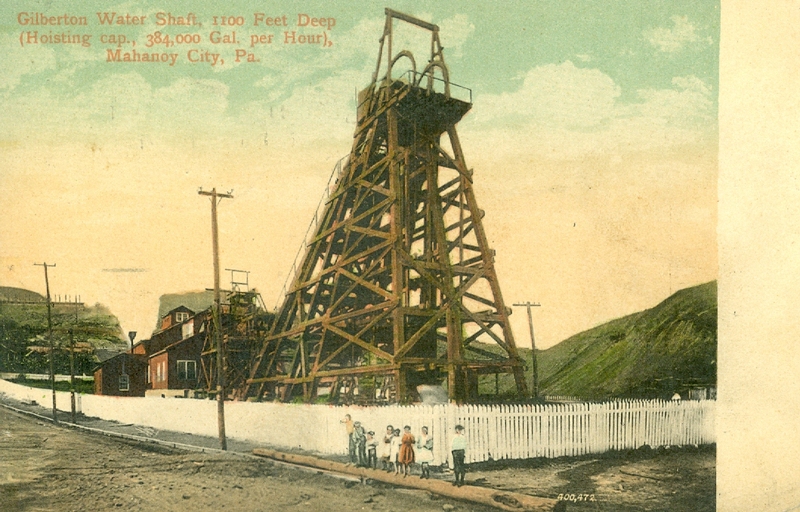 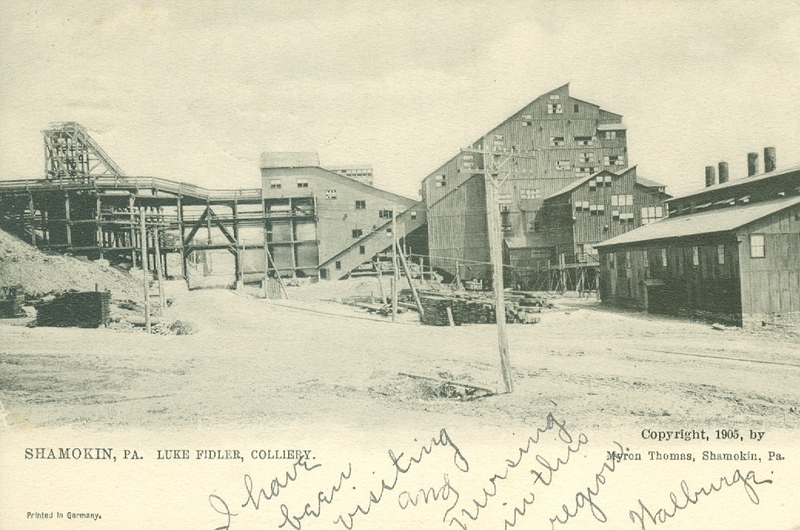 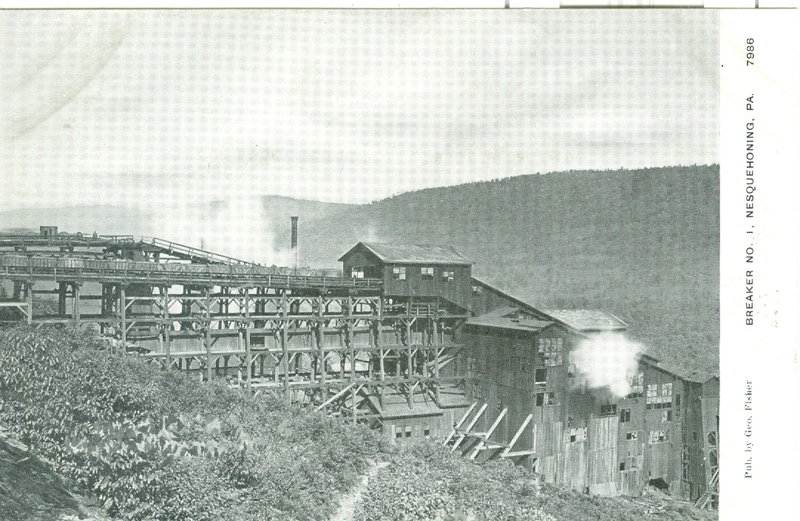 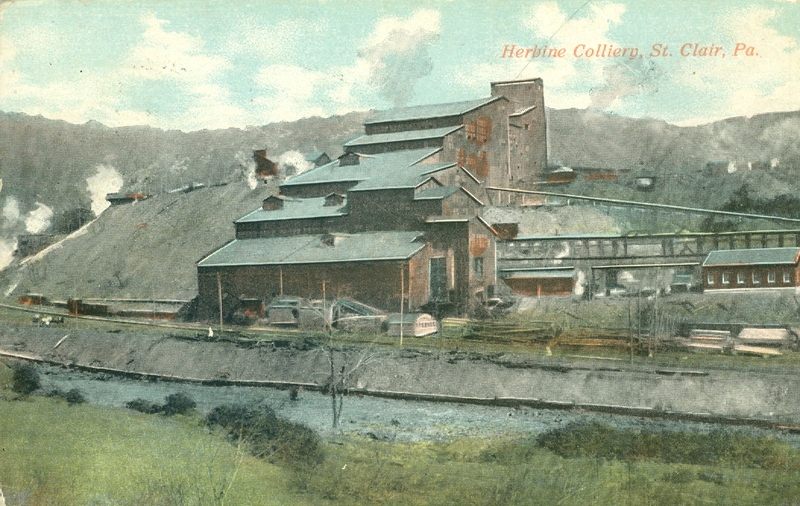 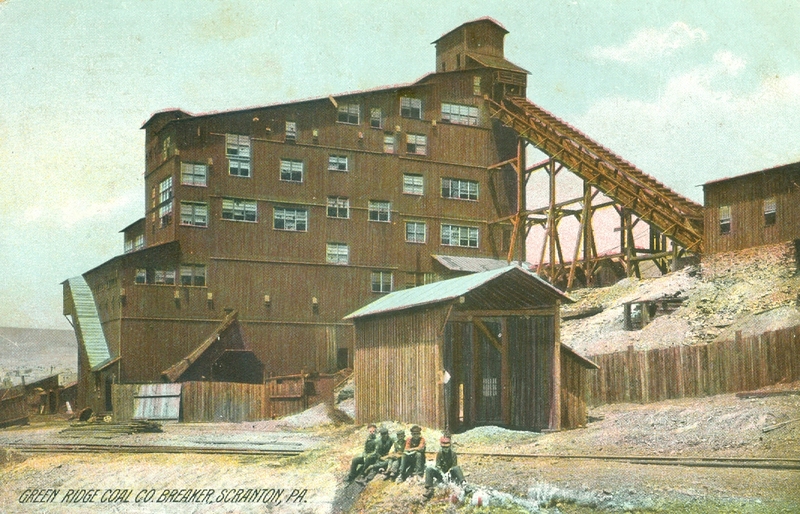 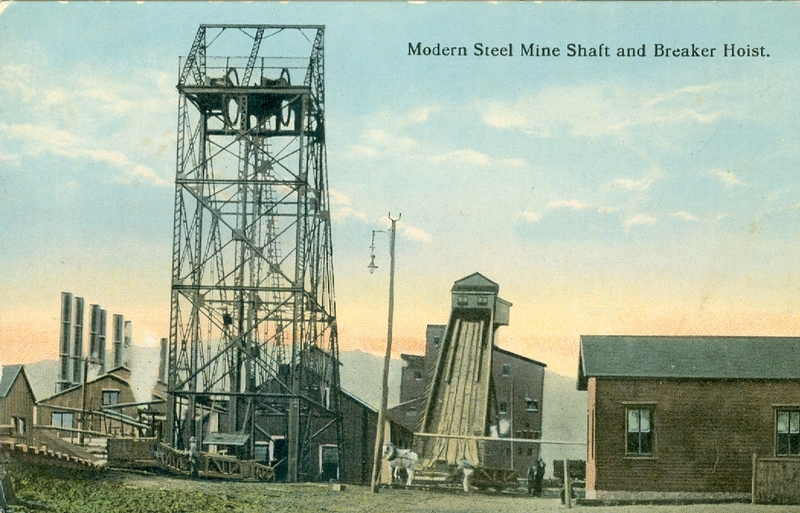 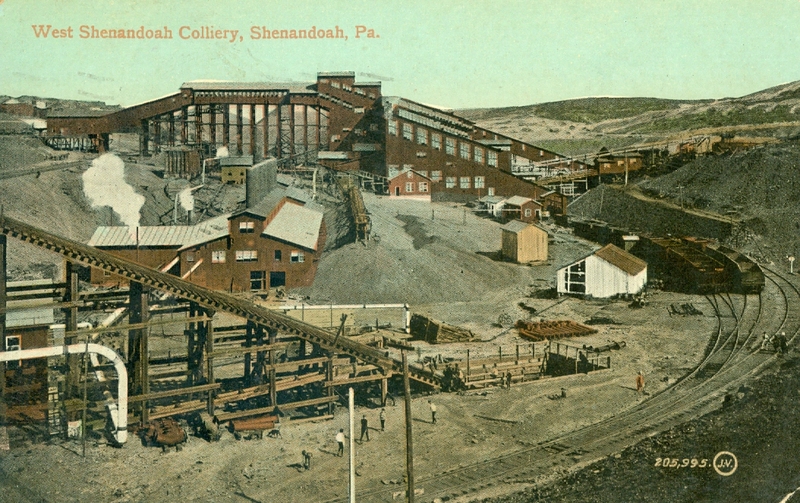 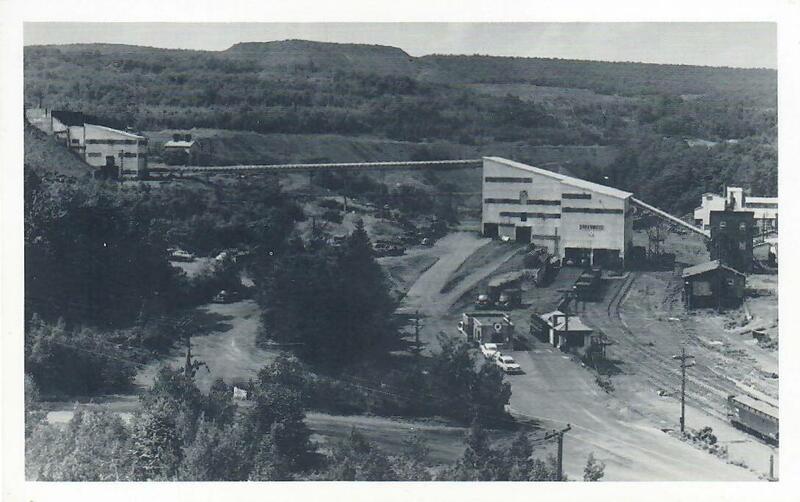 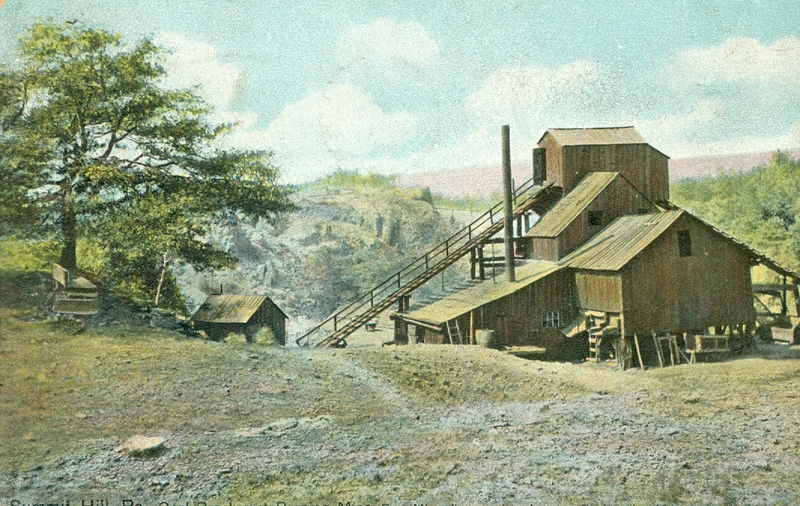 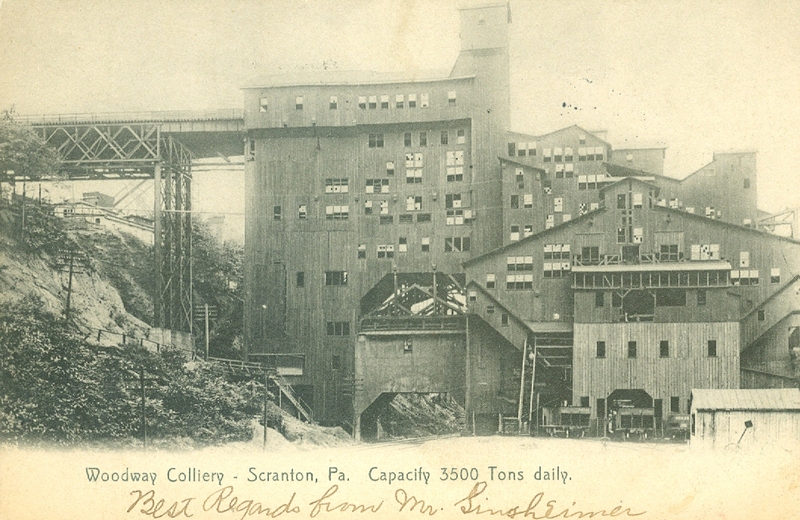 The building of this list has been ongoing over the past few years with specific names being located in print media and on-line, in annual state mine reports, and from photograph and/or postcard collections. 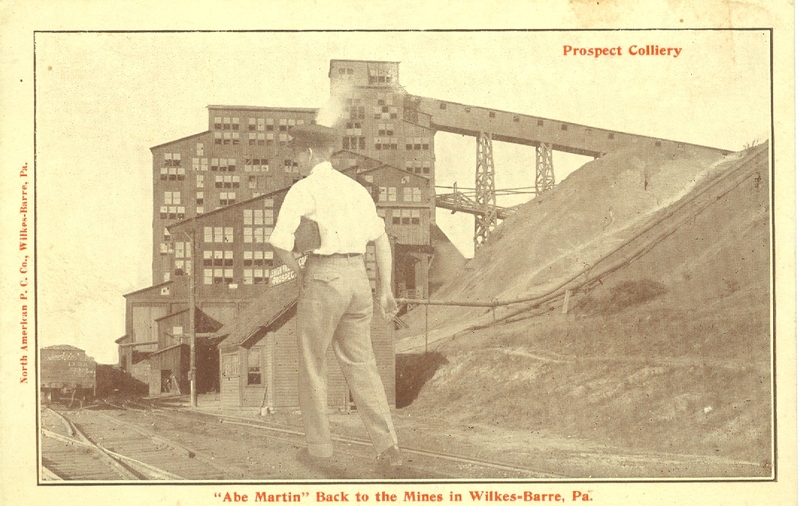 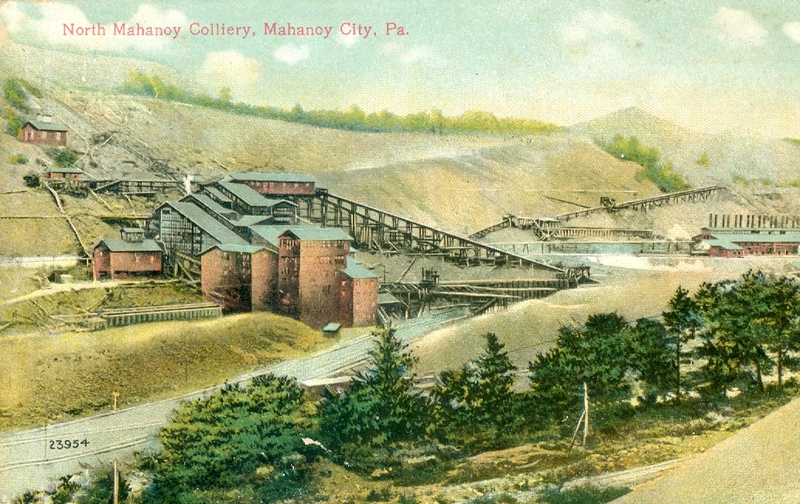 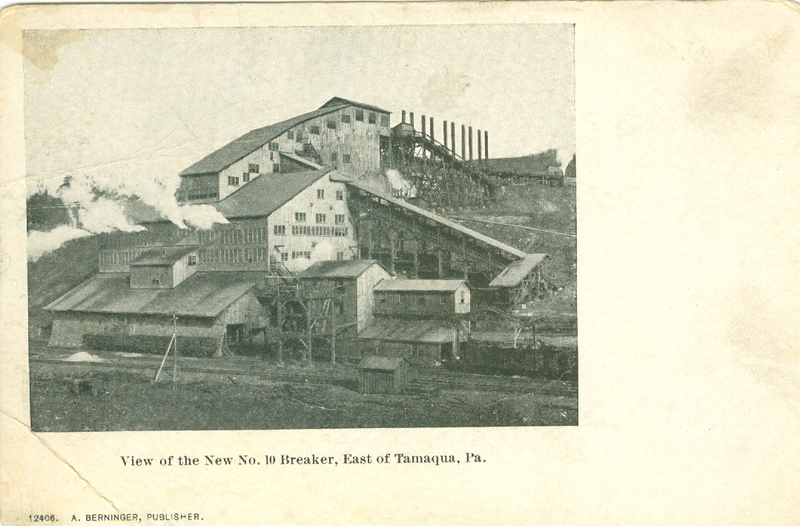 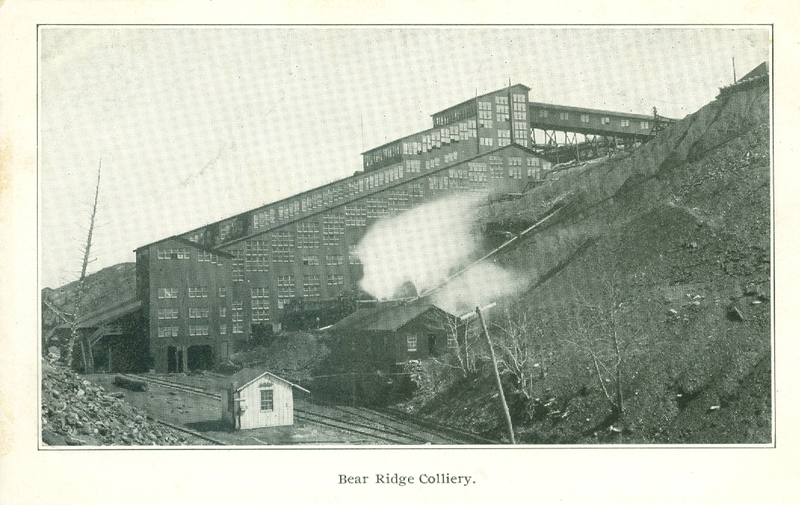 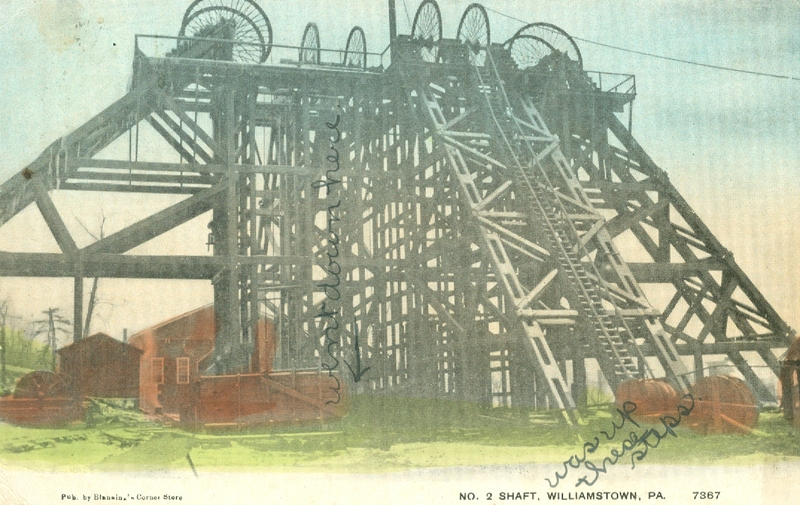 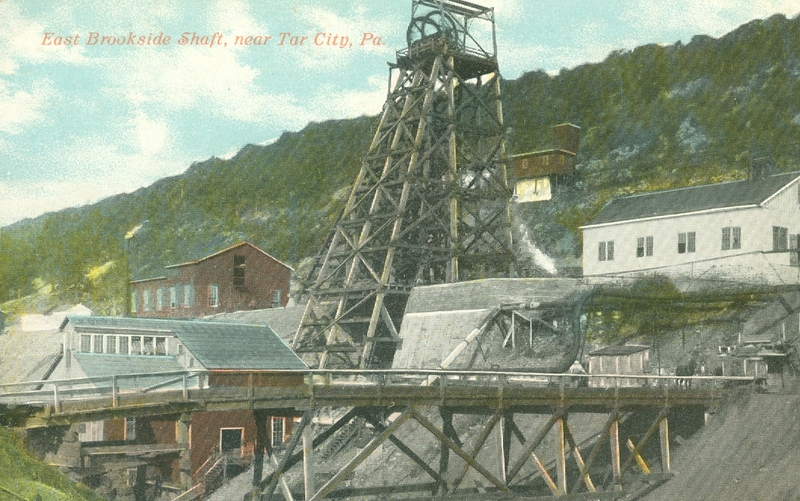 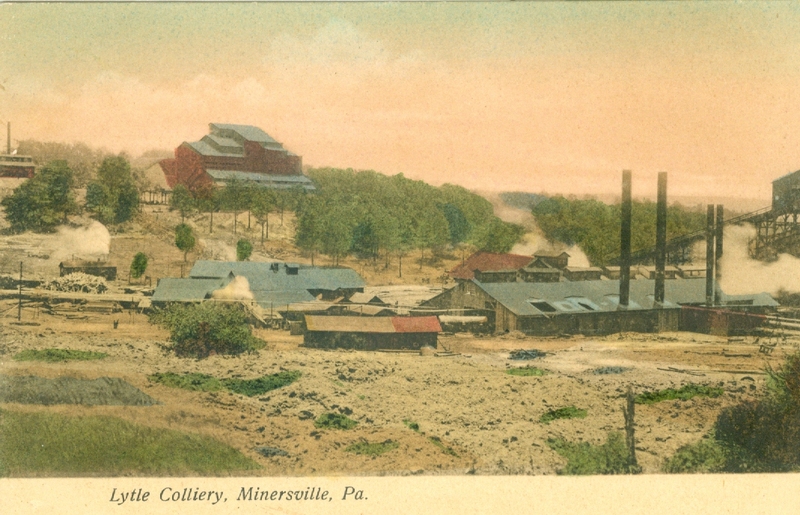 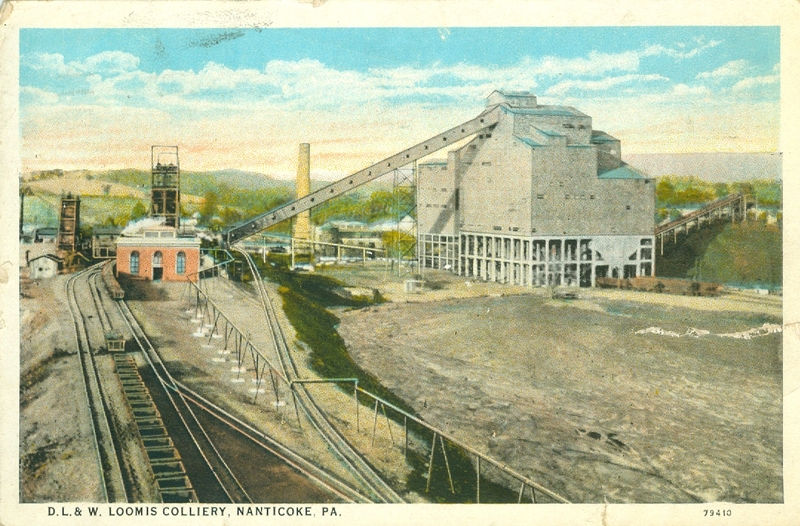 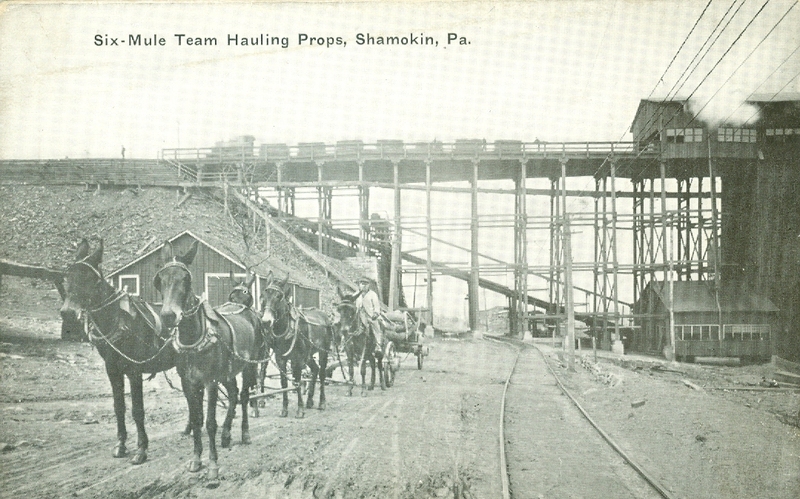 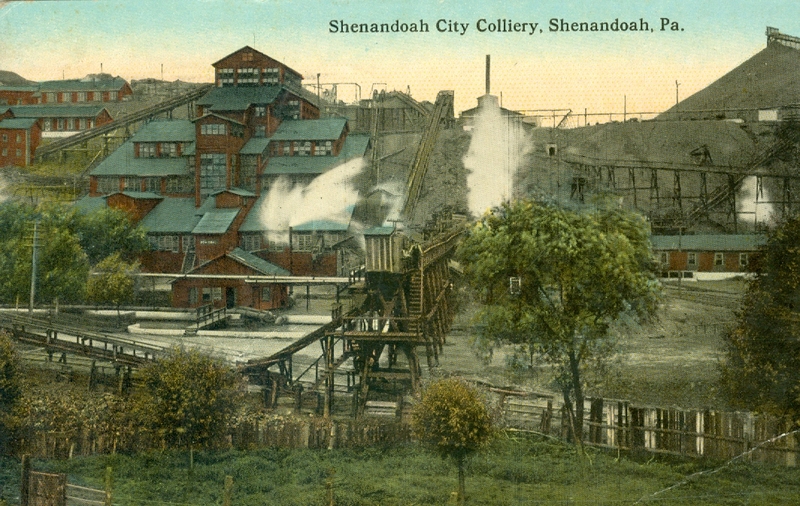 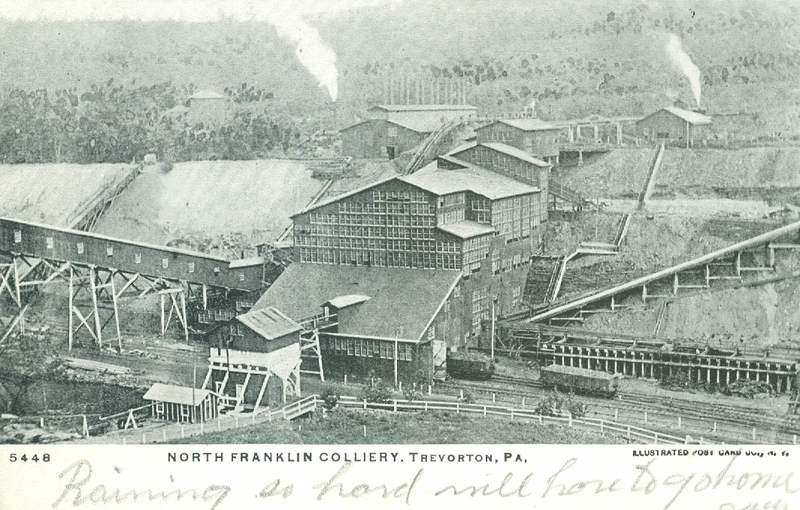 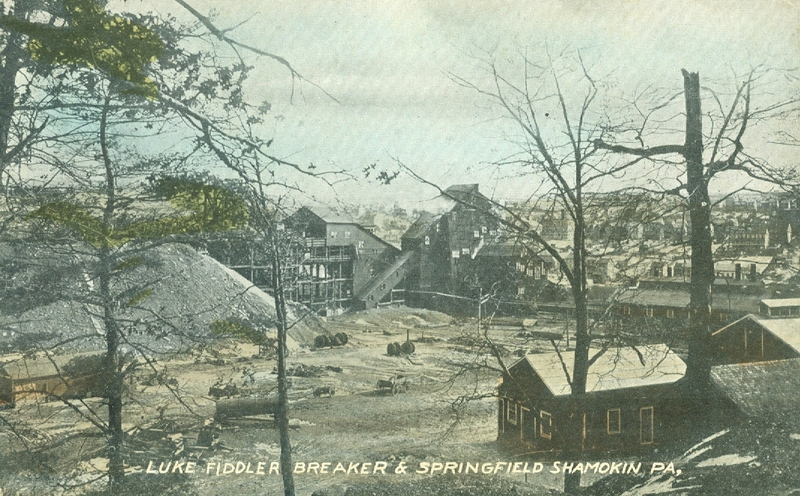 Misspellings were common, especially in the annual mine reports, and locations given were often a mix of specific towns, coal patches or townships. 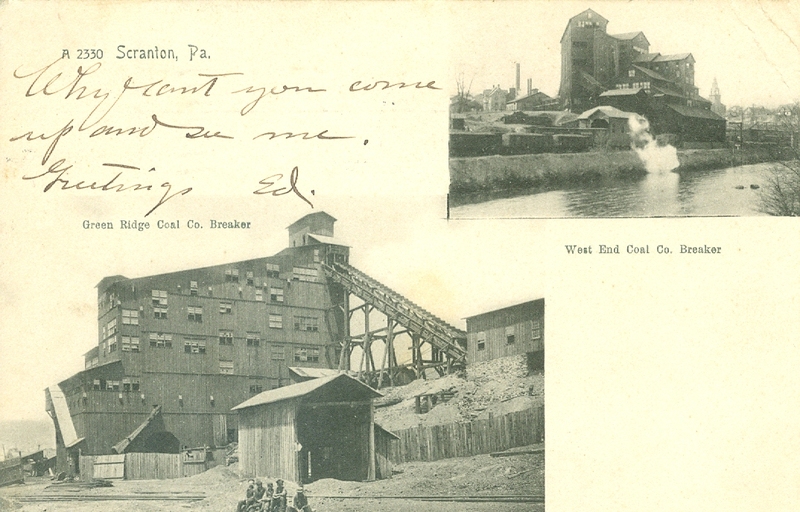 I have made my best effort to correctly identify specific names and locations and have corrected the spelling where necessary. 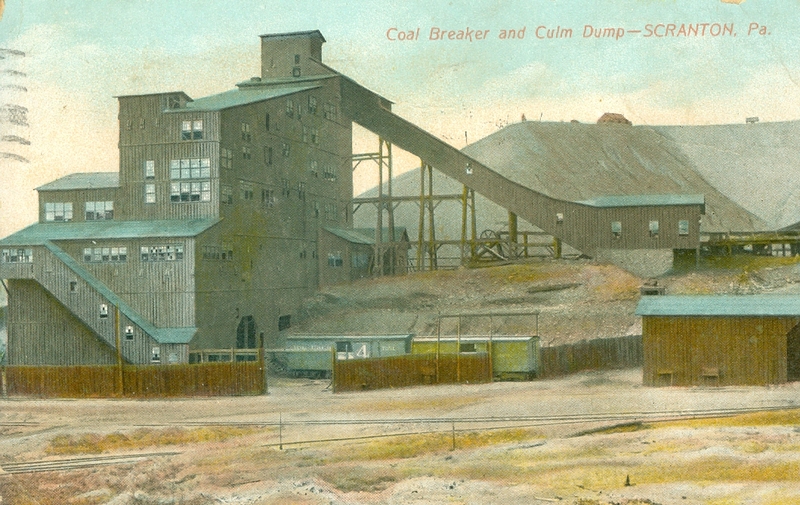 Since specific diggings often changed ownership or were at some point closed down or abandoned and subsequently reopened under a new name, it should also be understood in using the list that two and sometimes three names could refer to the same breaker or colliery. 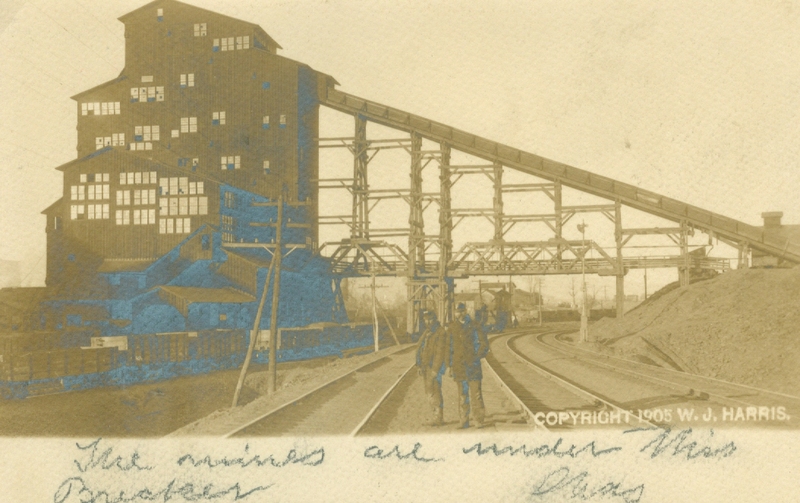 The list also contains some blank entries identified by use of ????? 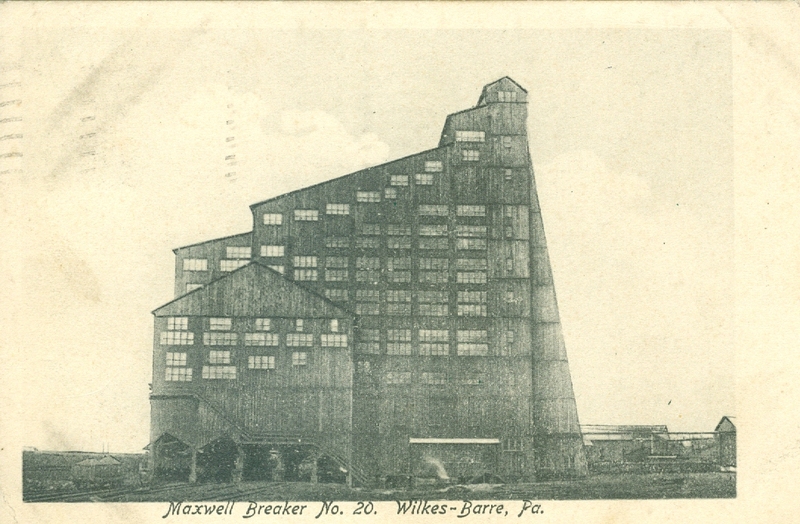 when a county is identified but not specific location or in a handful of instances when a name surfaced that has not yet been connected to both a specific county and location. 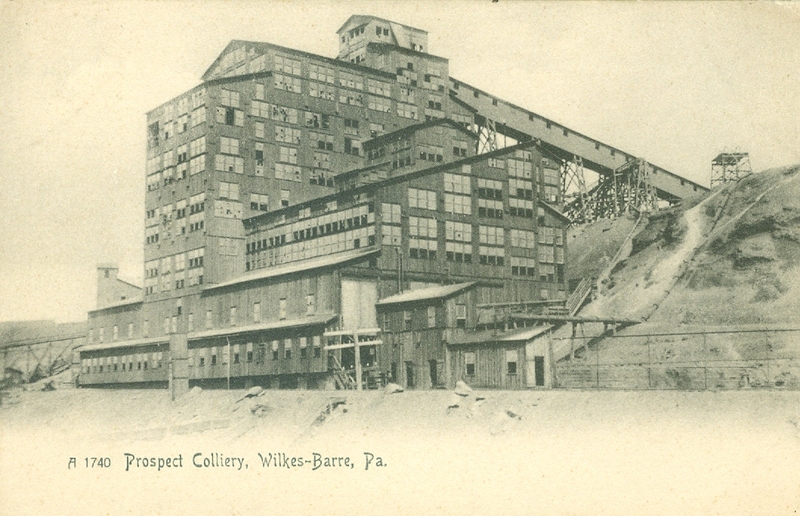 The search has slowed but will continue as time and energies permit. 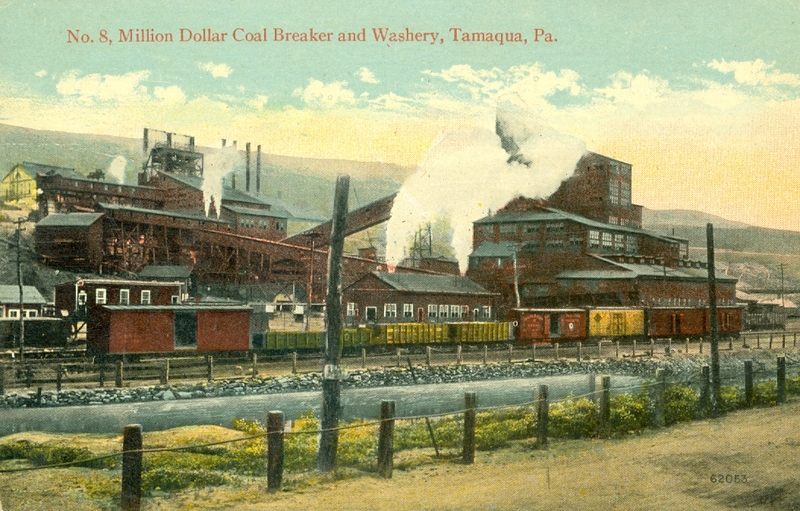 Yet to be explored are special collections in libraries and historical societies as well as state agencies and institutions that may prove productive in further expanding the list. 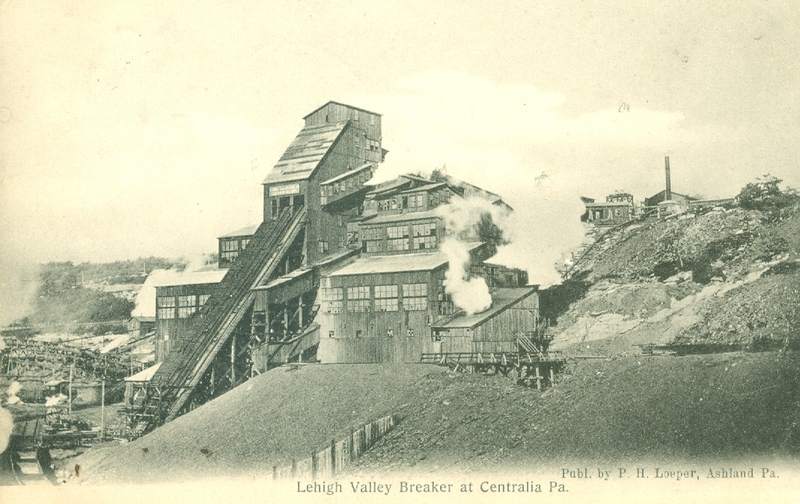 It is my hope that this list, as incomplete as it is, will prove useful to anyone exploring the history of the Pennsylvania anthracite region or pursuing genealogy searches. 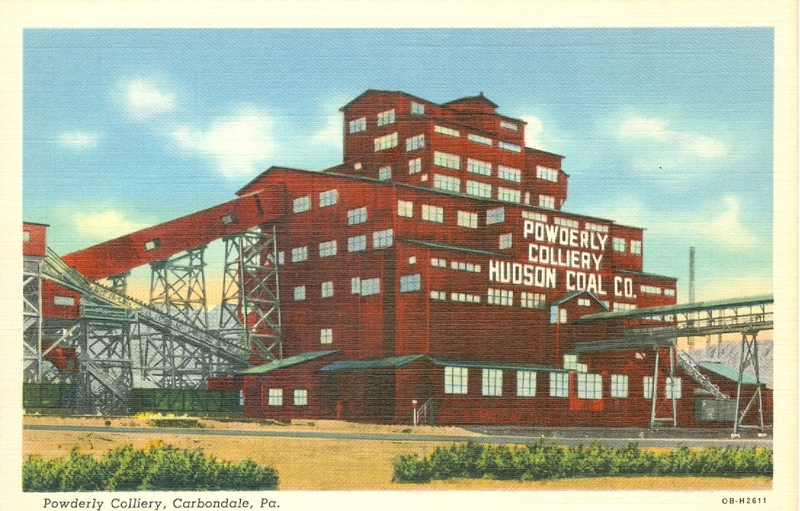 The list may be sorted by the user alphabetically by county, location or specific name. 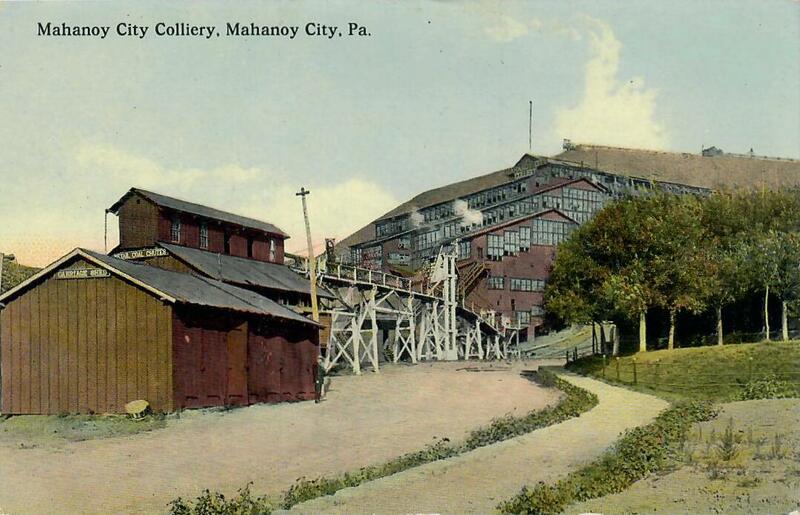 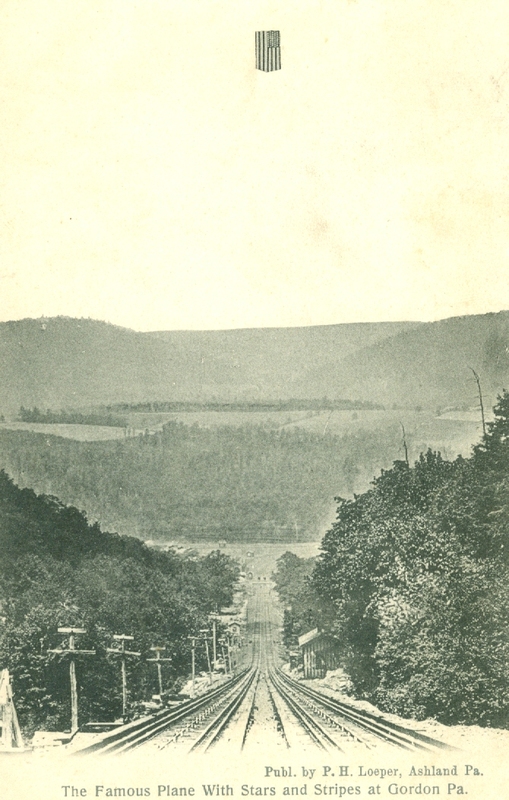 Schuylkill Mahanoy City Buck Mt. 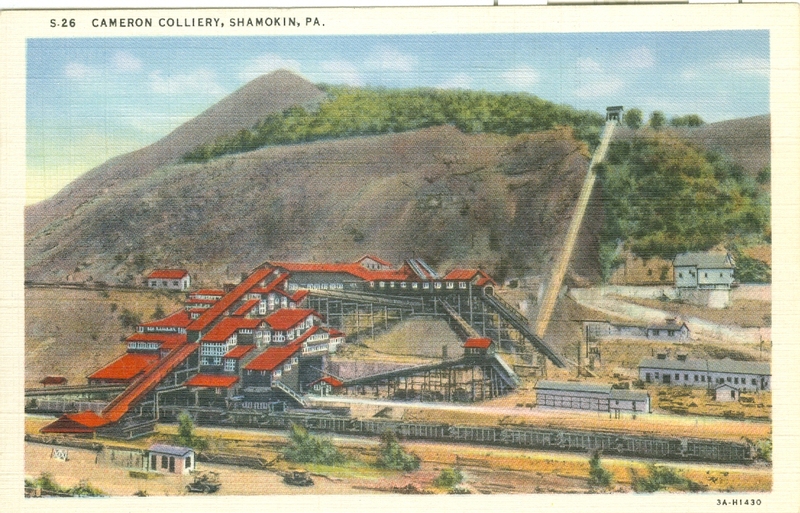 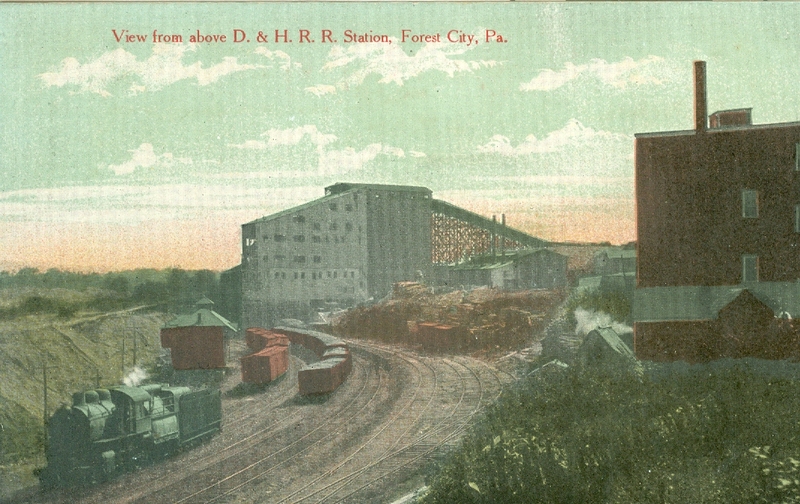 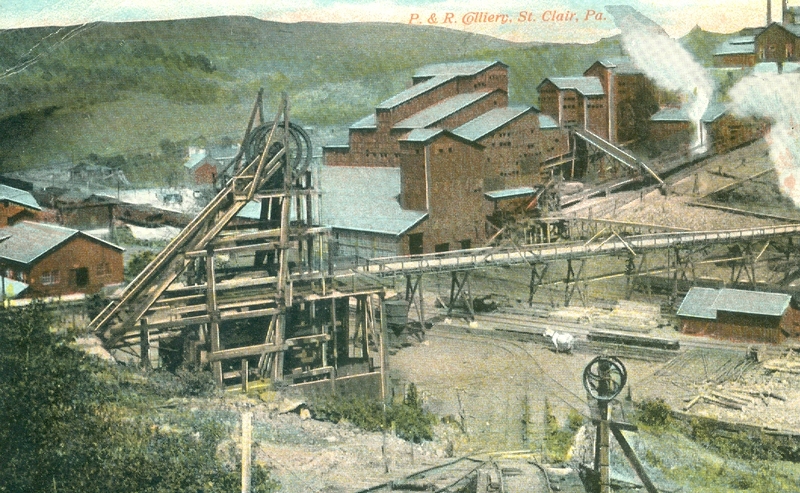 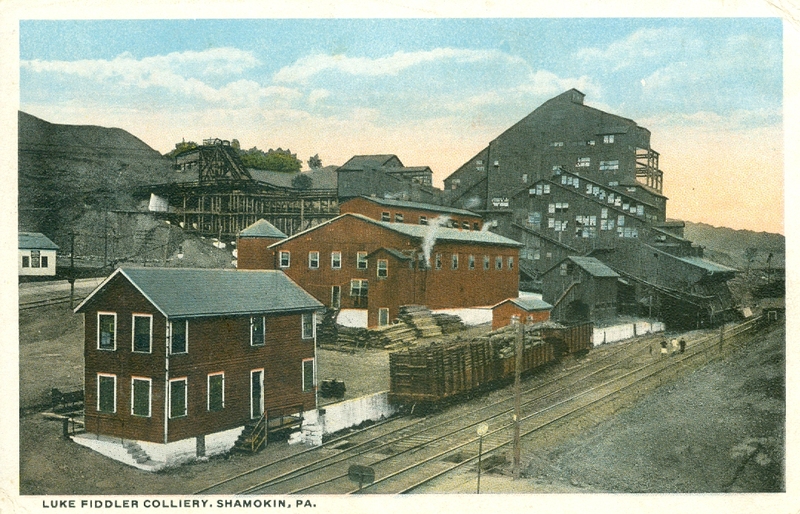 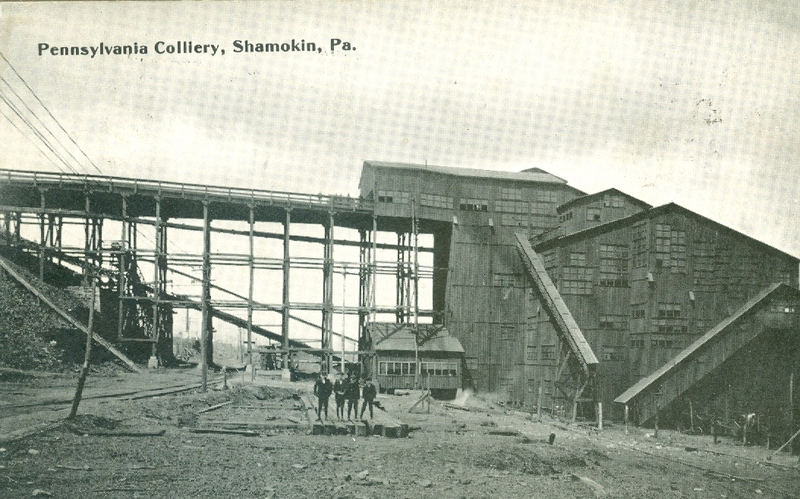 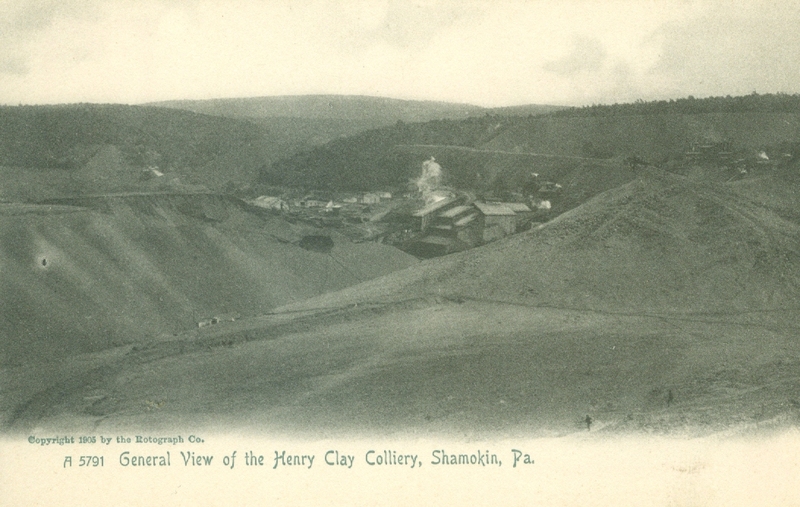 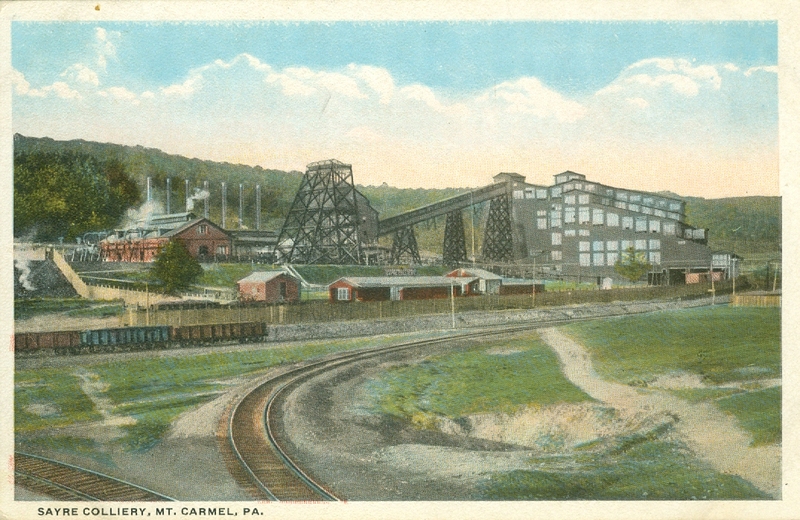 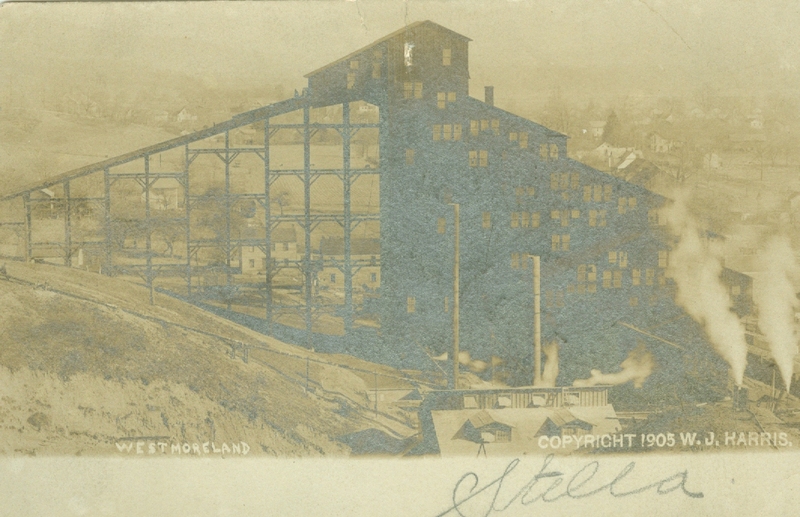 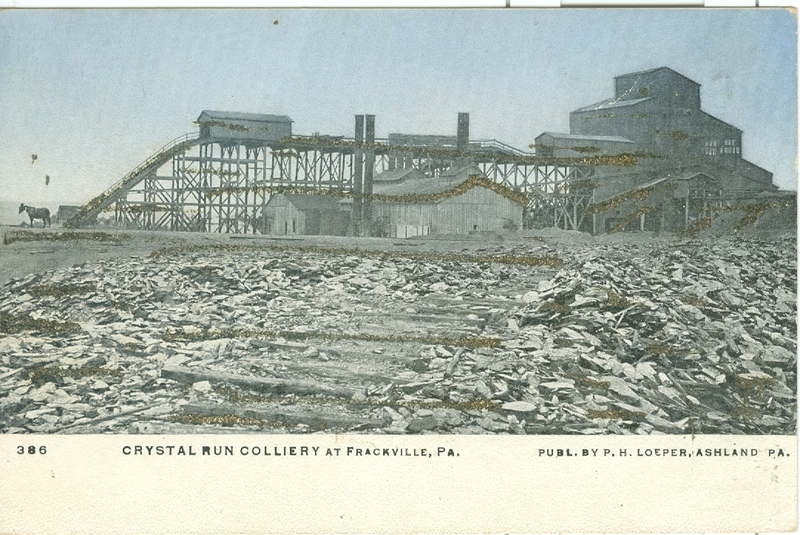 Schuylkill St. Clair Saint Clair Coal Co.